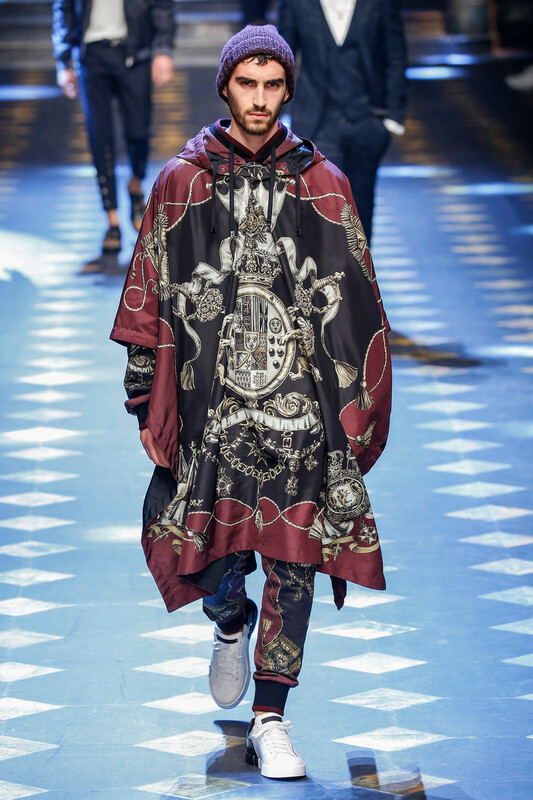 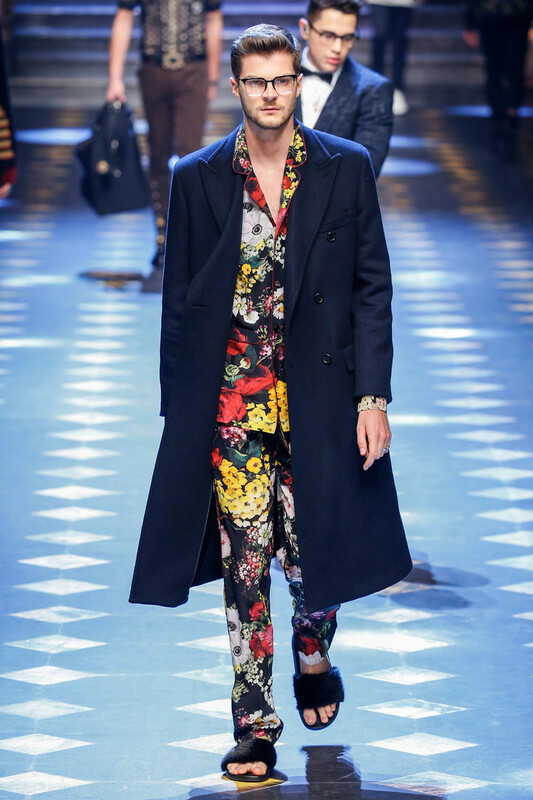 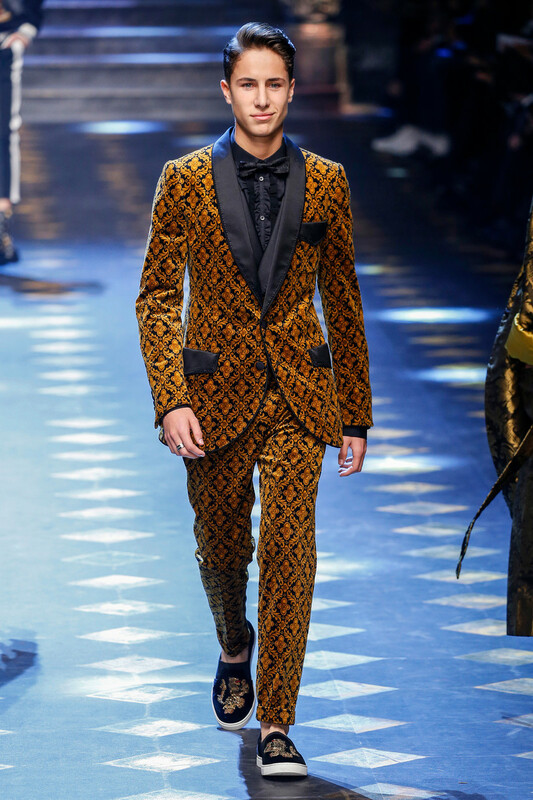 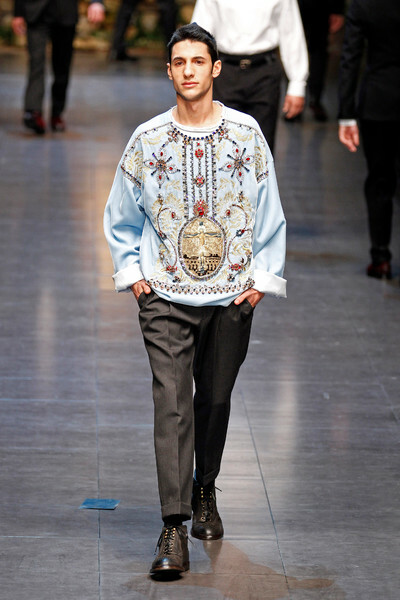 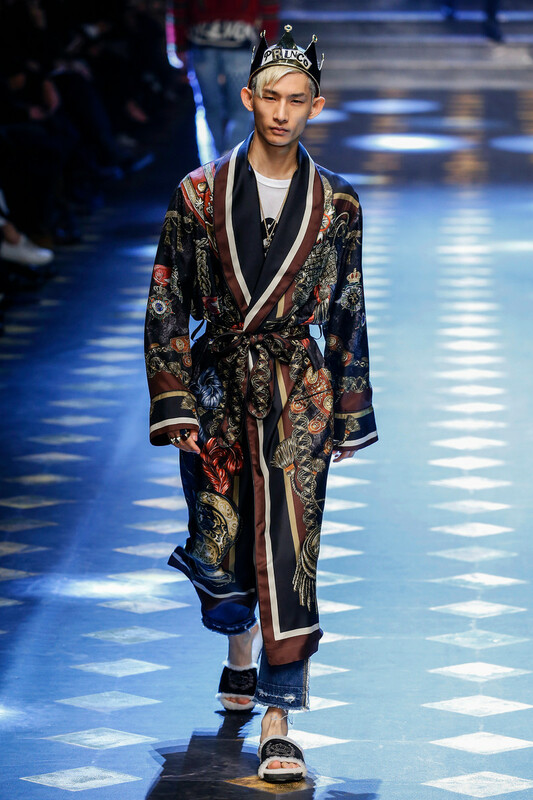 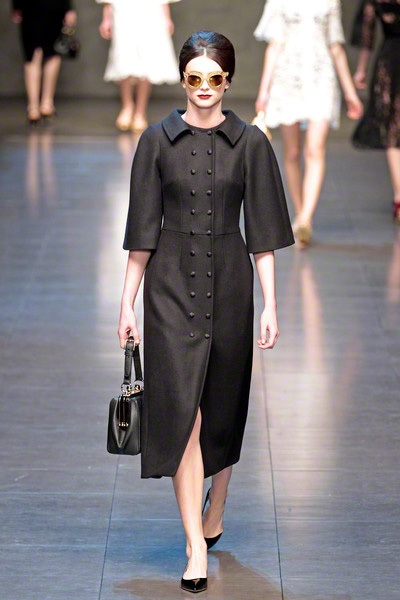 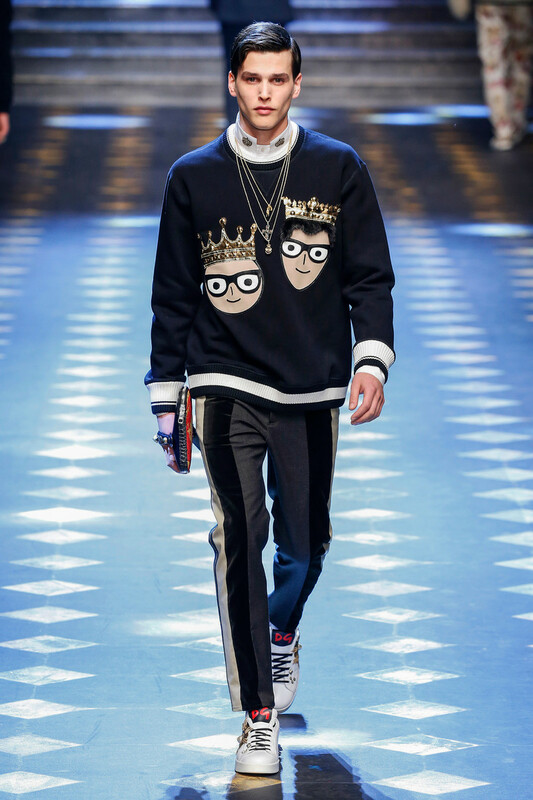 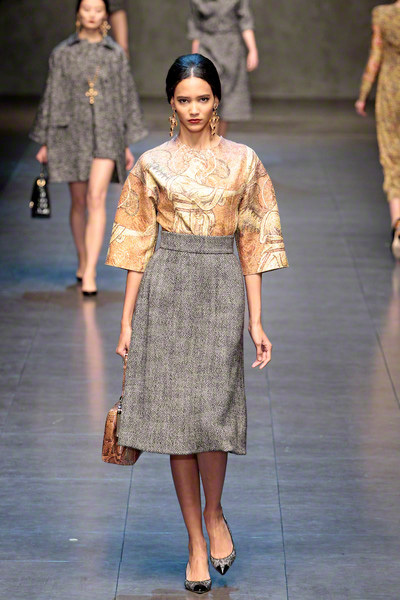 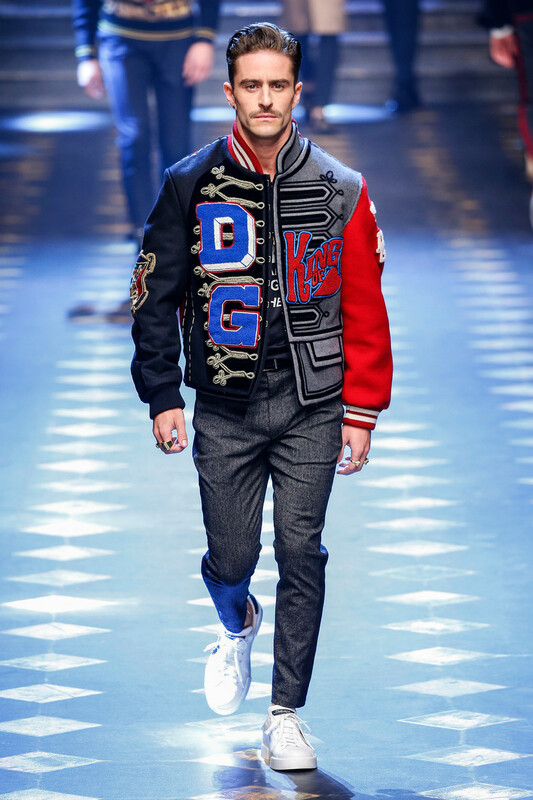 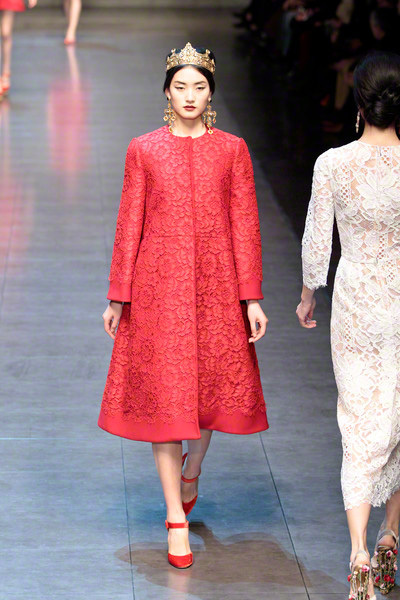 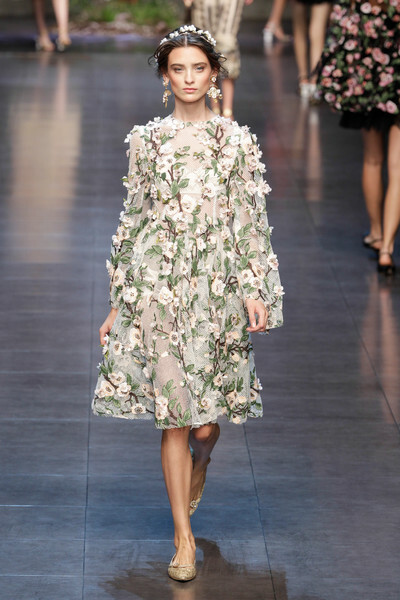 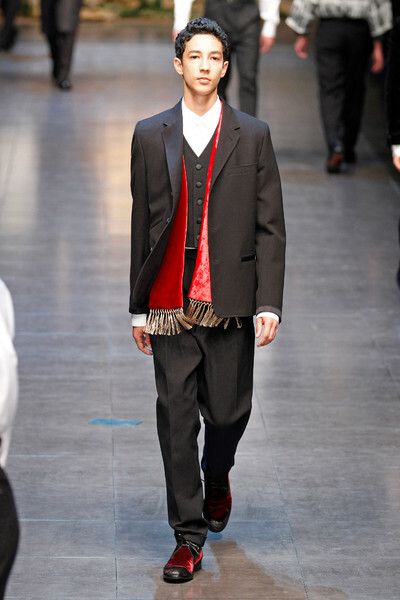 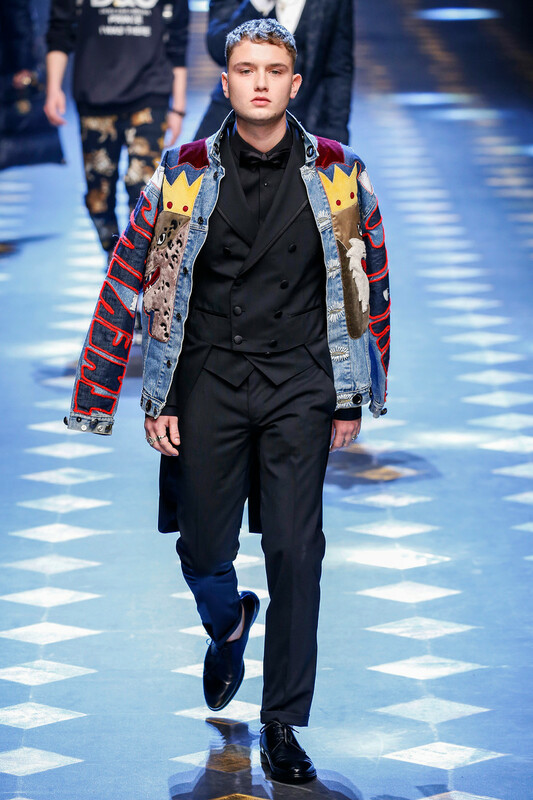 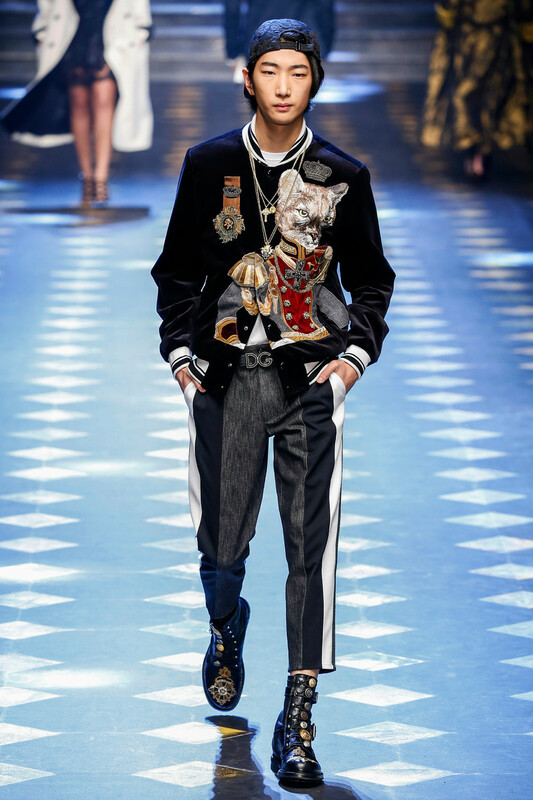 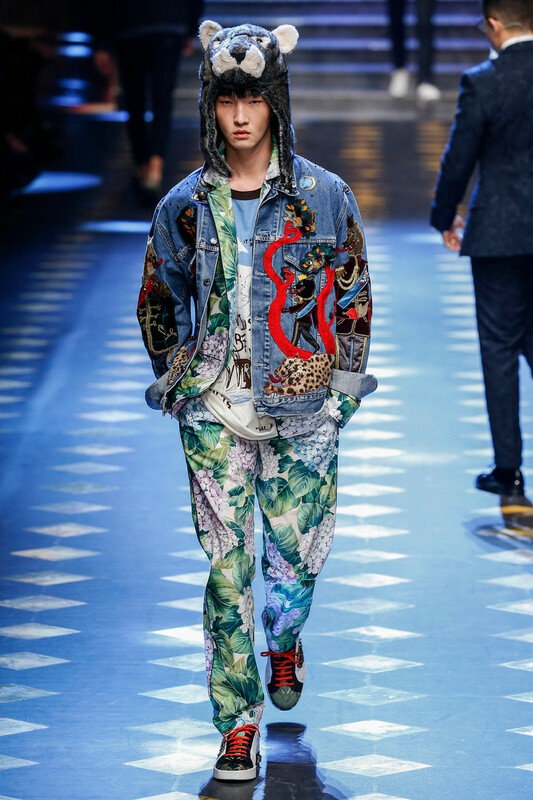 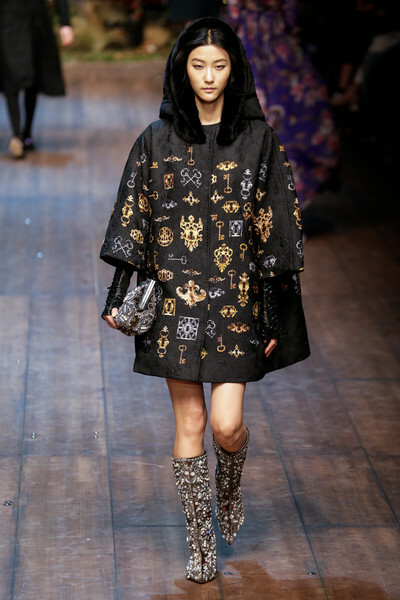 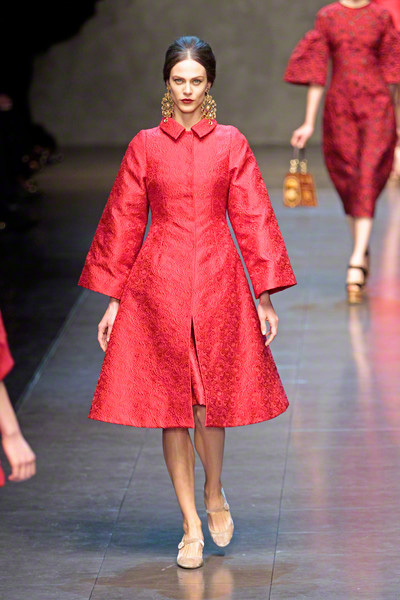 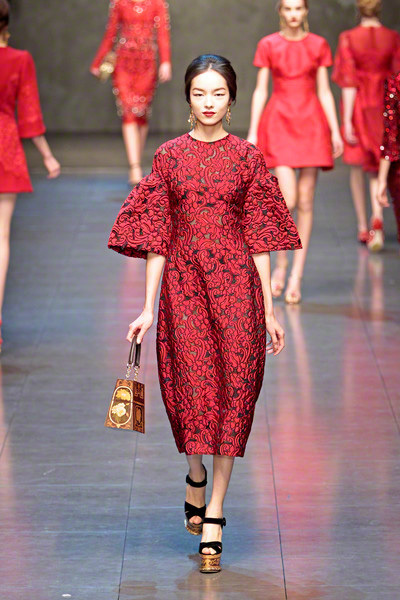 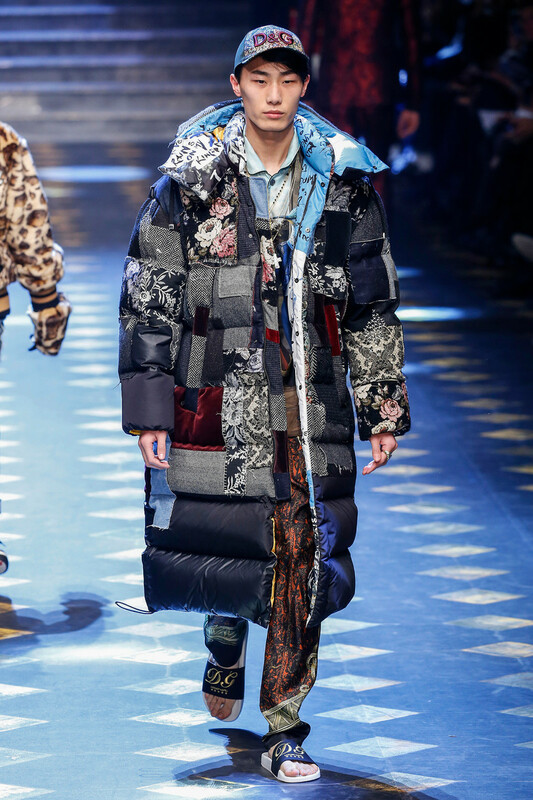 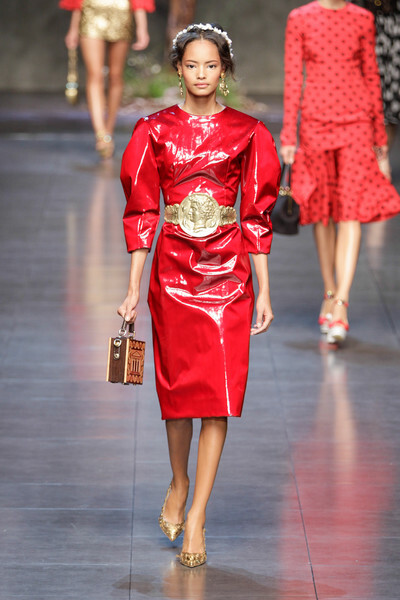 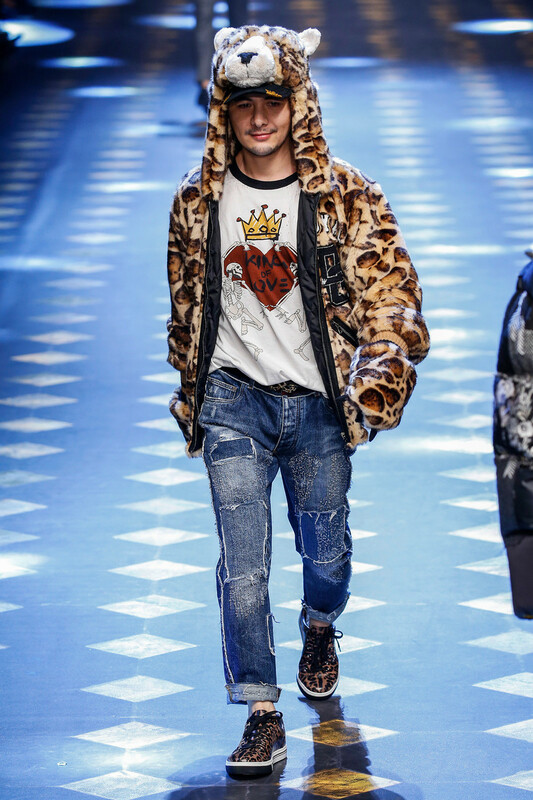 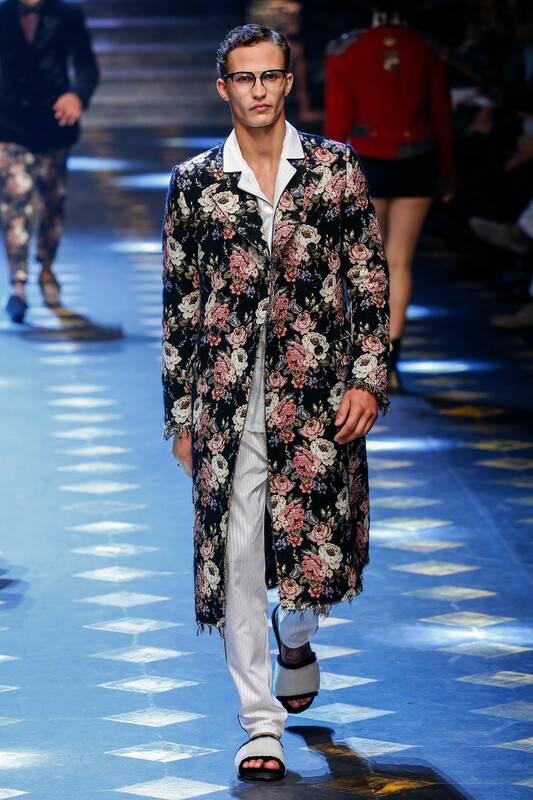 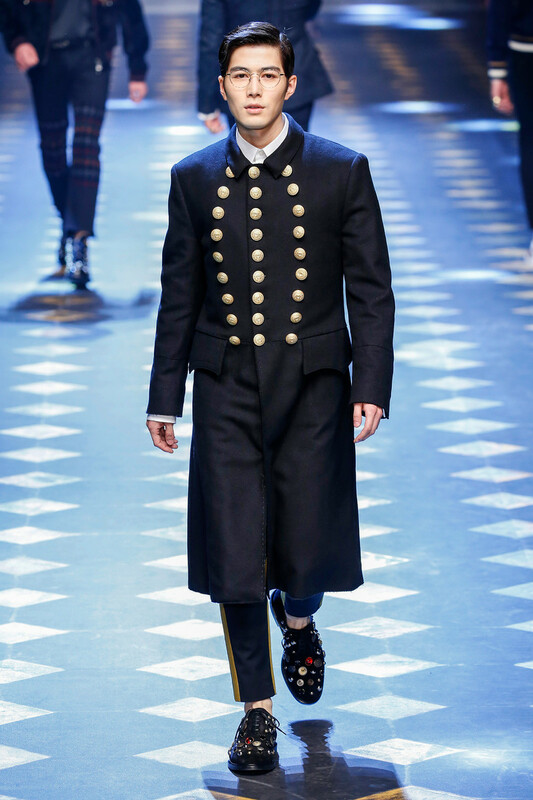 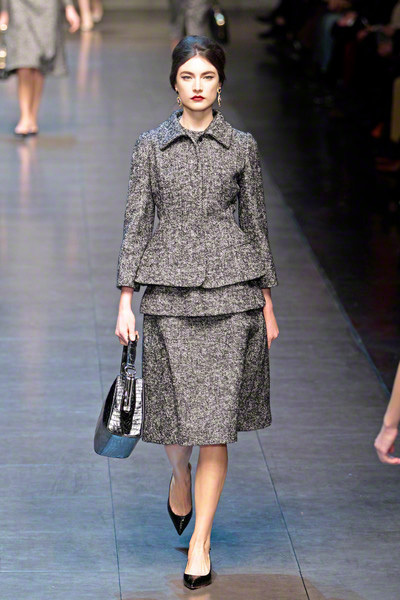 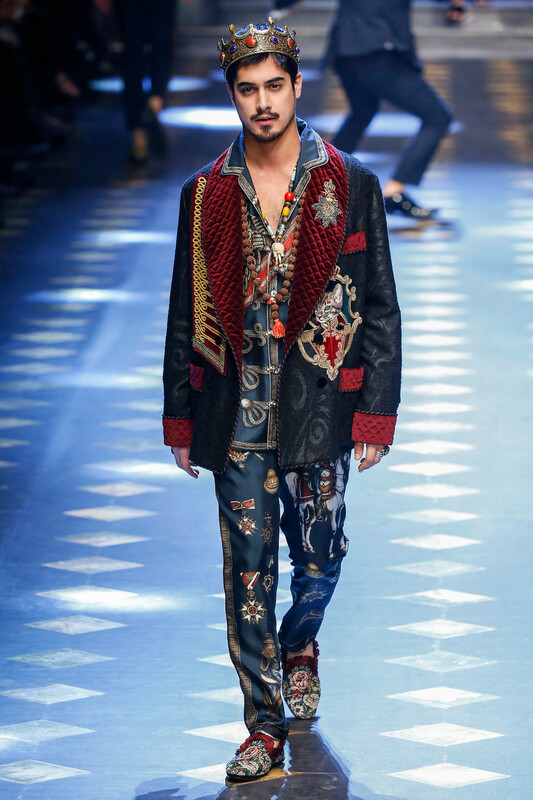 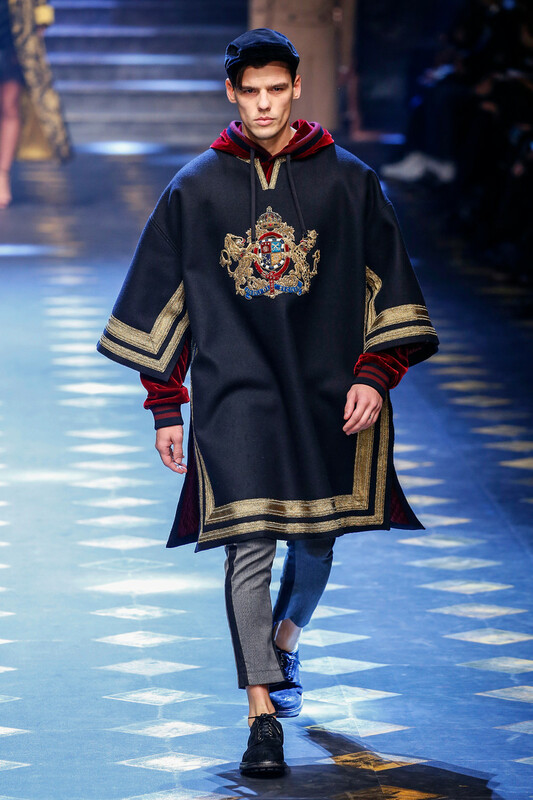 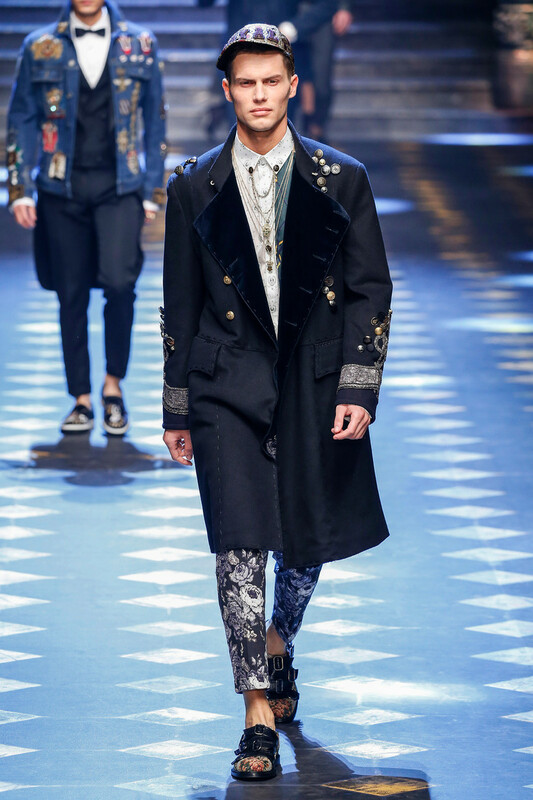 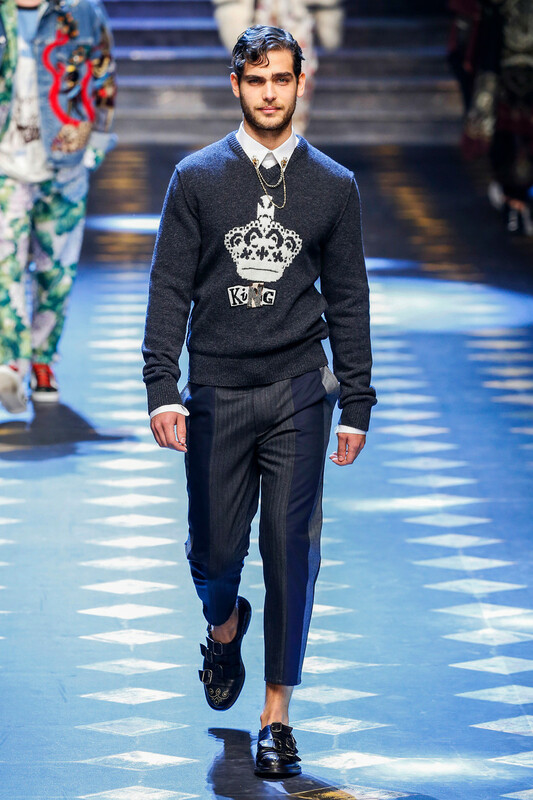 Each new collection from Dolce & Gabbana now presents a revision of signatures old (like the strict tailoring), and new, like the oversize geisha silhouette. 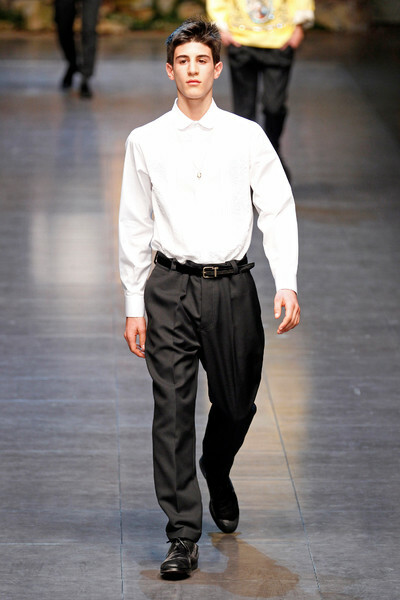 But there’s never a sense of the banality that you might expect to attach itself to the overly familiar. 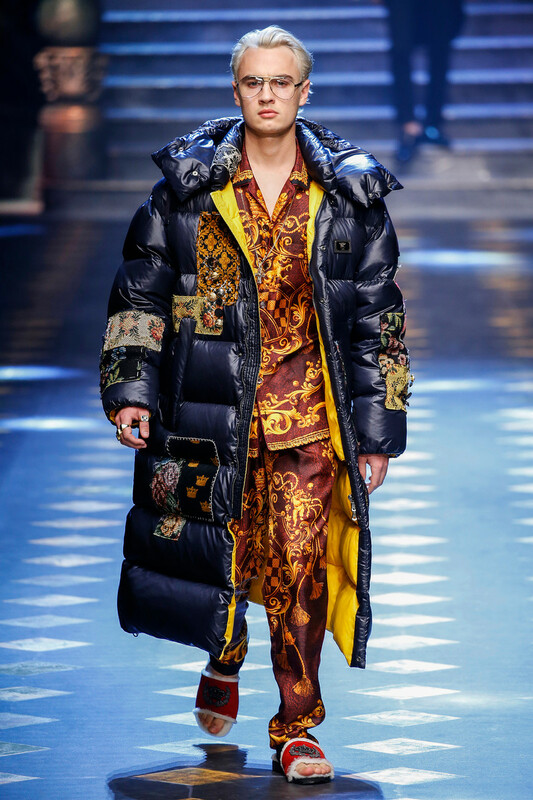 That’s because the clothes are infused with a visual intensity that transcends the kitschiness of the imagery to become something verging on celebration. 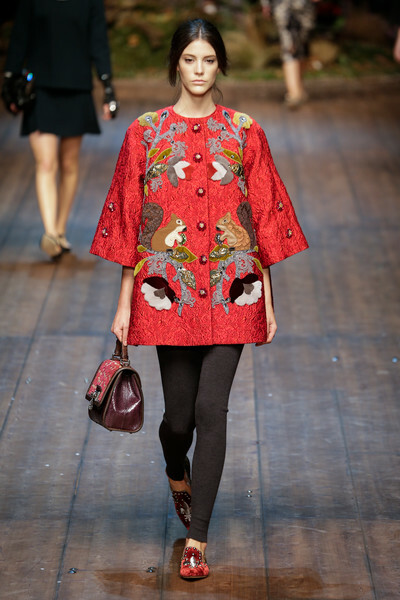 The parade of peacocks and dragons and swallows darting through bamboo forests that passed down the catwalk was indeed a catalog of kitsch, but by the time those elements had been printed on a silk boot or embroidered on a lace shirt or knitted into a cardigan sweater, they’d become facets of a collection that also featured three-piece suits and patched jeans and summery striped pants and an army of polo shirts. 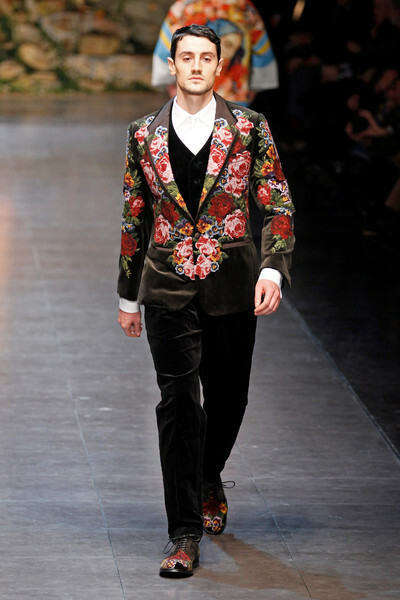 A whole lot of separates, in other words—suggestions for integrating even the most extravagant piece into a wardrobe. 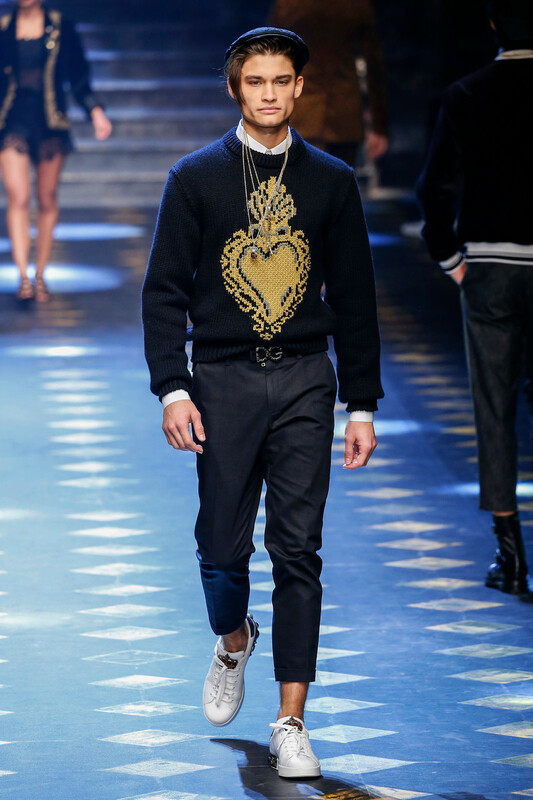 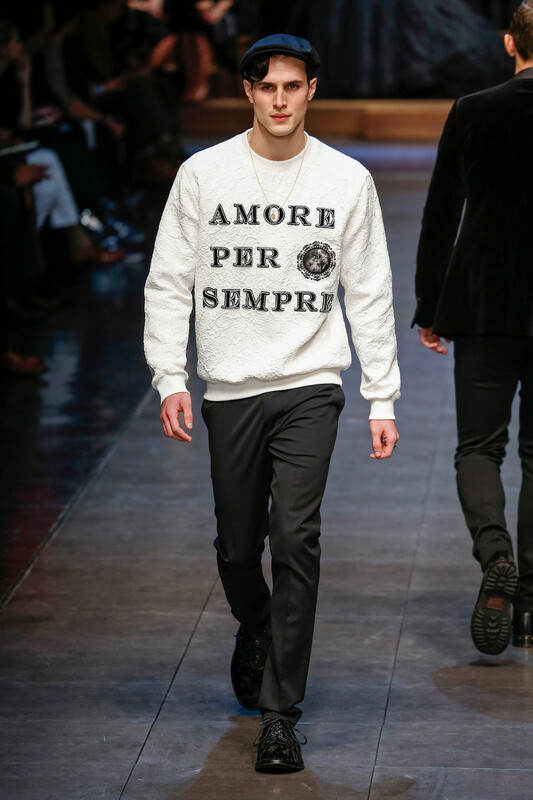 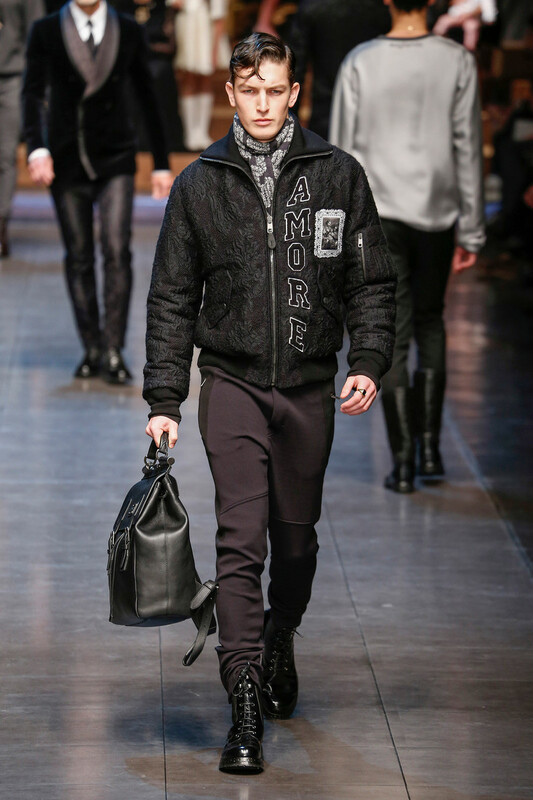 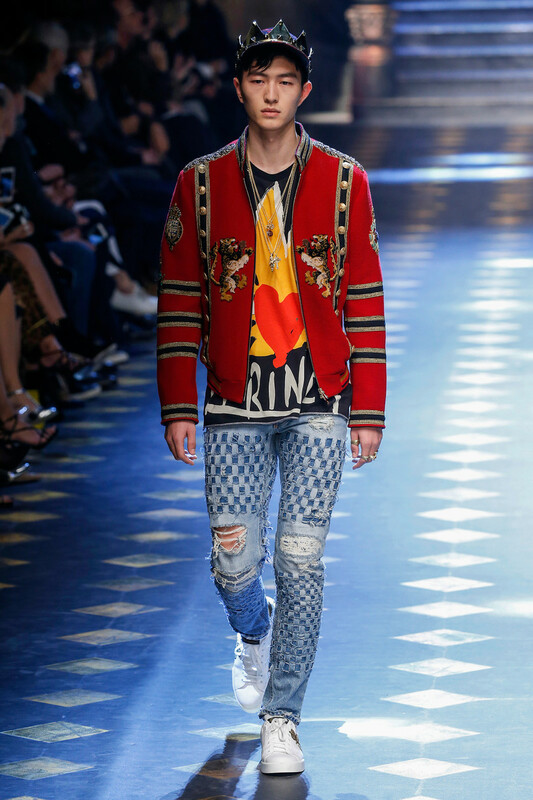 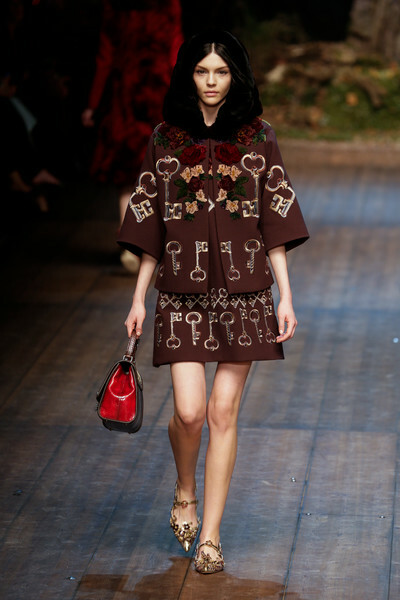 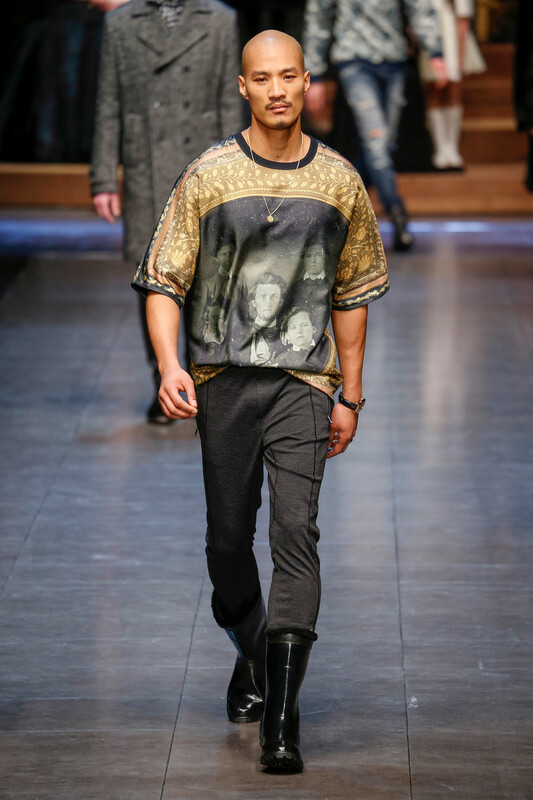 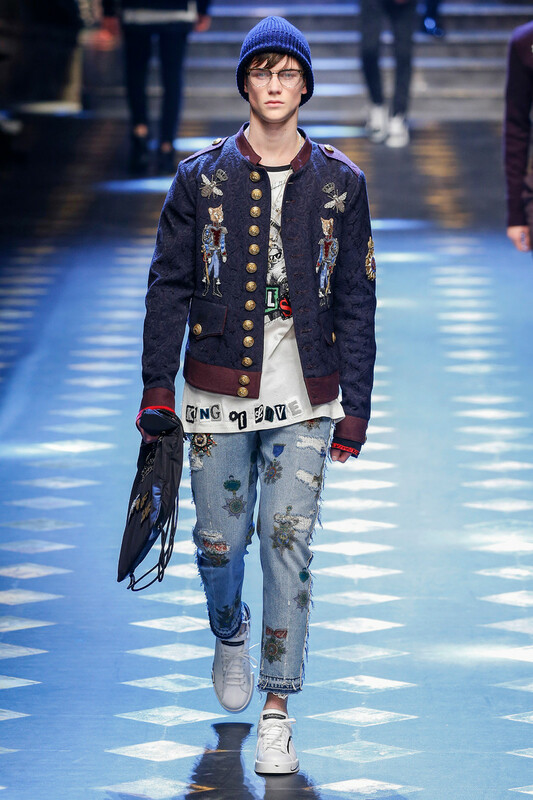 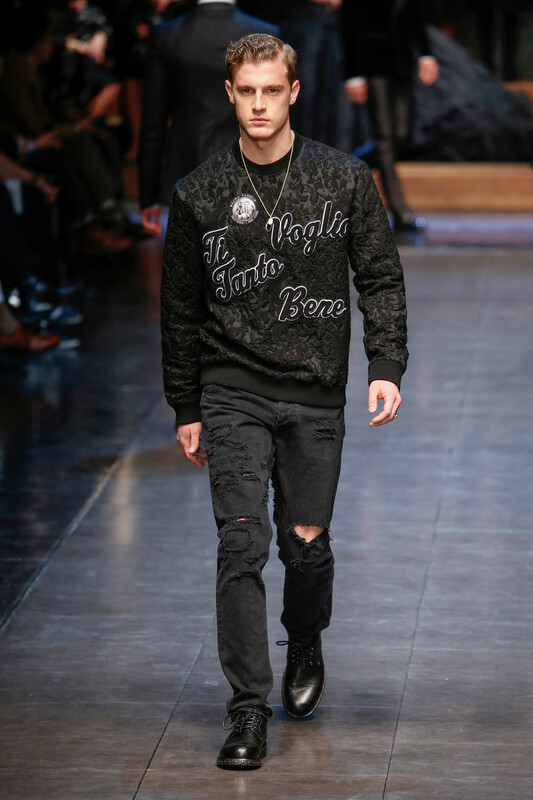 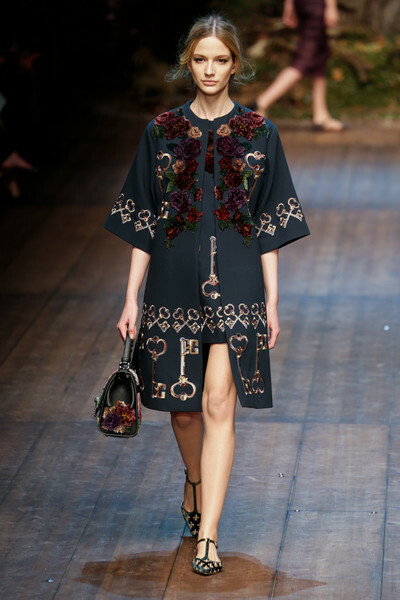 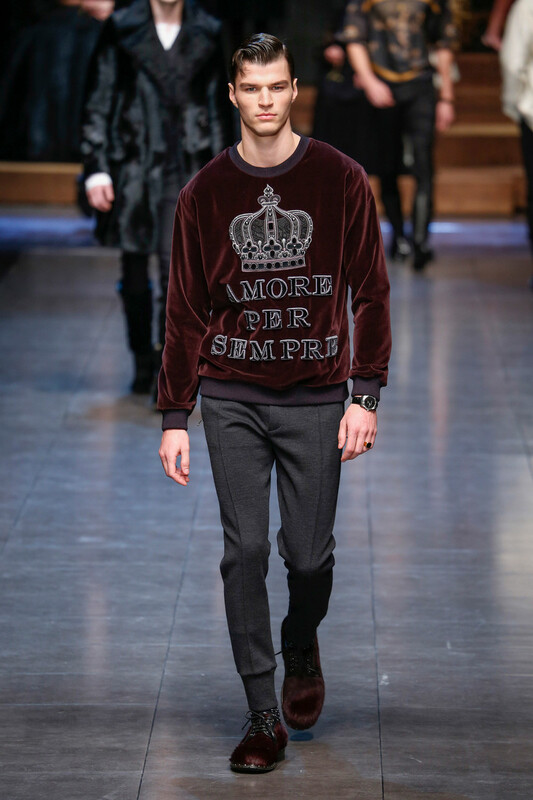 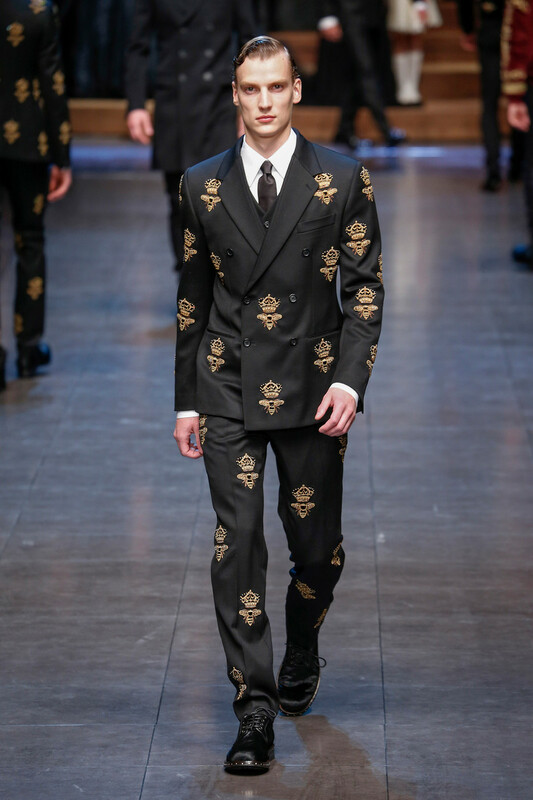 The message of love that drove the latest collection of Dolce & Gabbana couldn’t have been timelier. 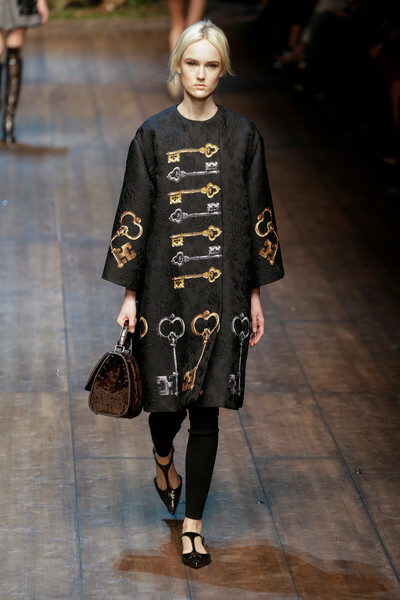 Love, family, community—the eternal verities that offer security when the foundations are kicked out from under us. 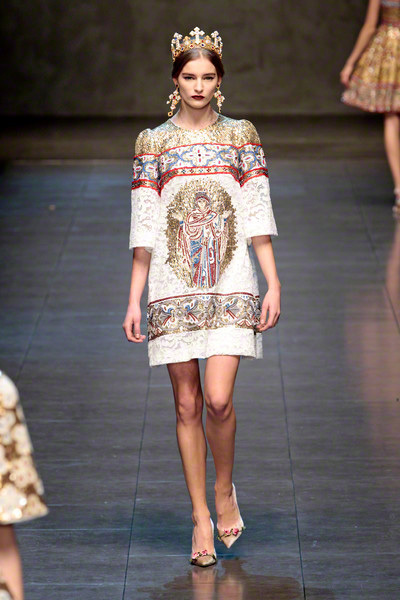 For ever inspired by their beloved Sicily designers Domenico and Stefano this time pulled from the moment in history when invaders brought myths, legends and thus fairytales to the island. 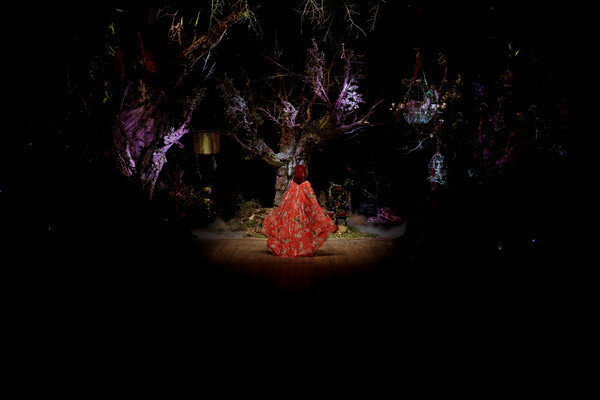 Doing so the show’s backdrop was one big mesmerizing fairy tale wood. 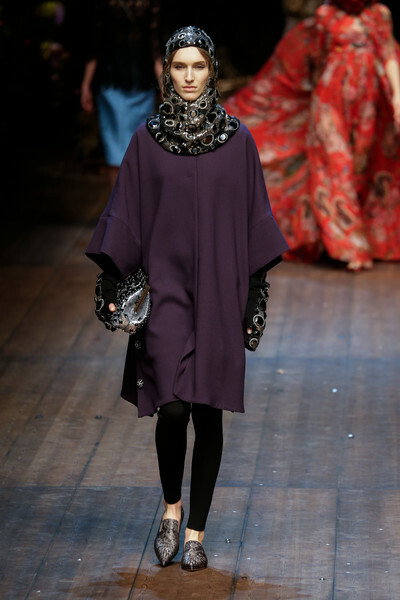 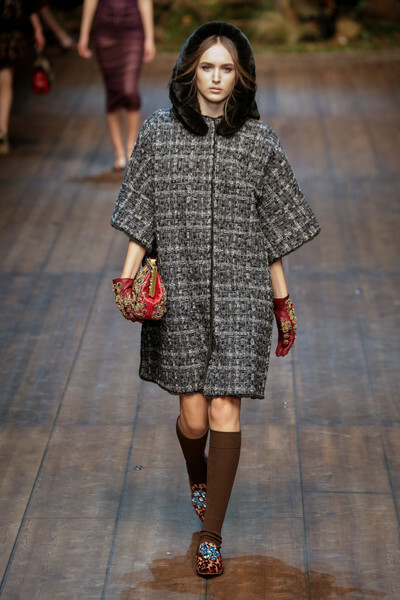 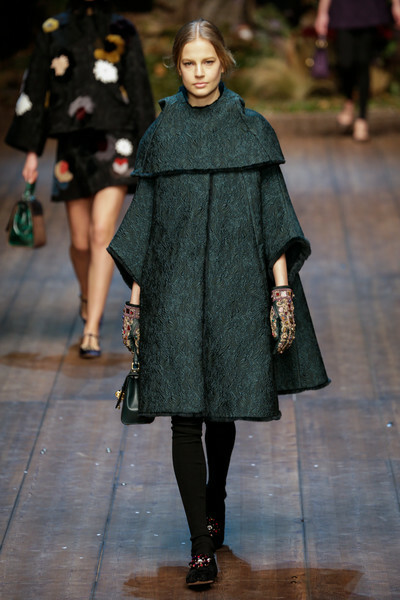 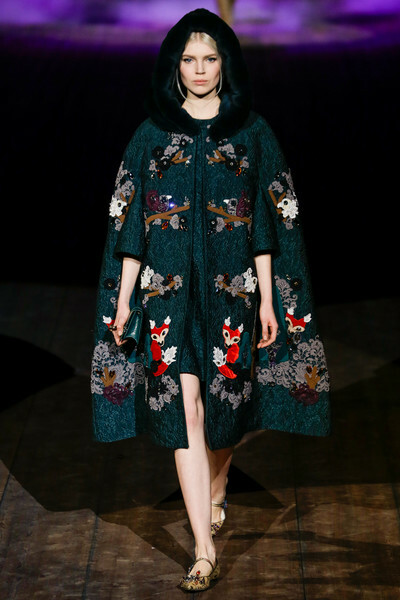 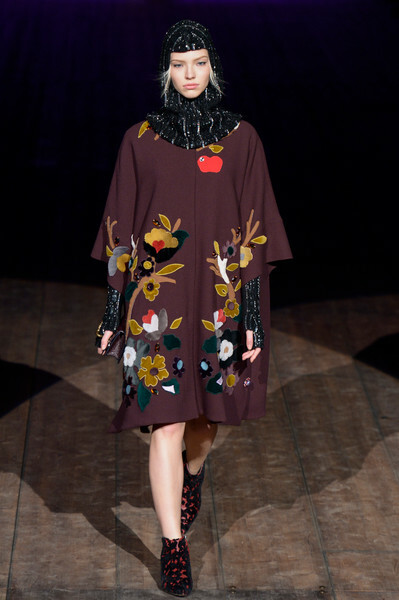 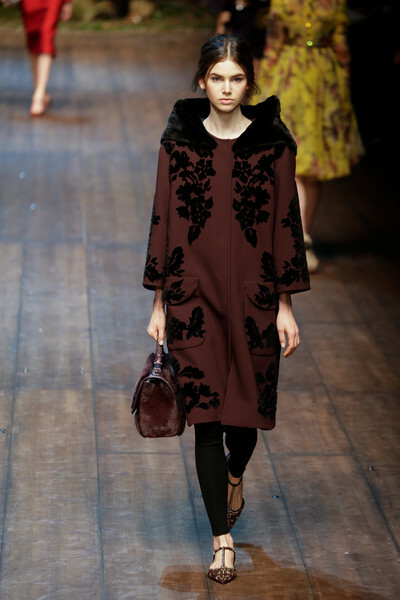 Models were dressed as little red (grey and purple) riding hoods sporting large capes with fur trimmed hoodies. 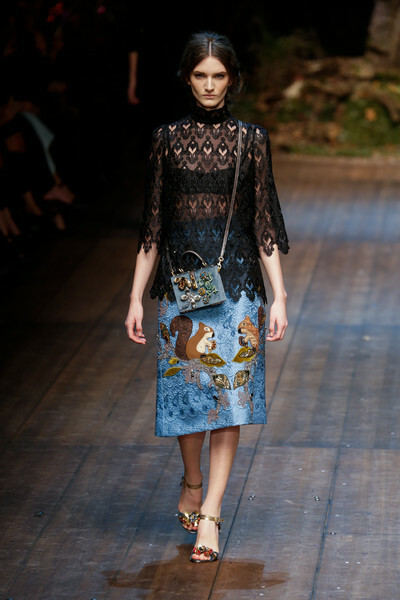 Cartoon-y Foxes, owls and squirrels were embroidered onto their clothing, as well as large flowers and keys (to the castle). 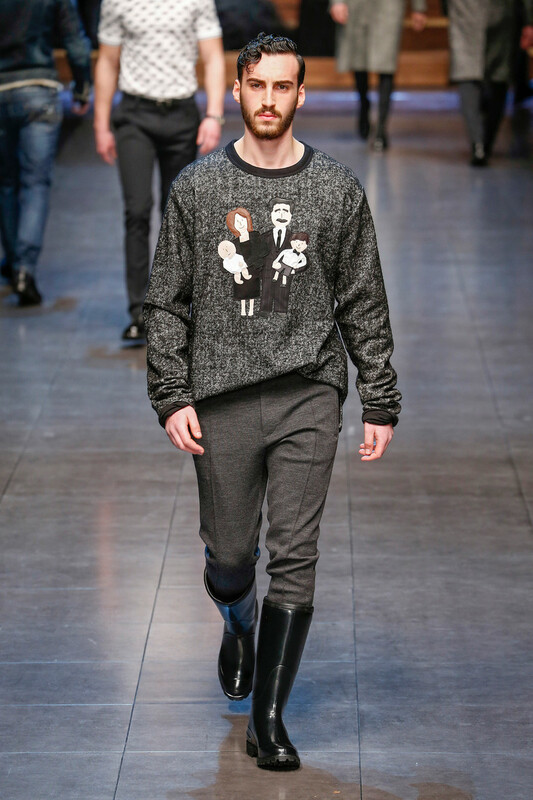 There were frogs to be kissed. 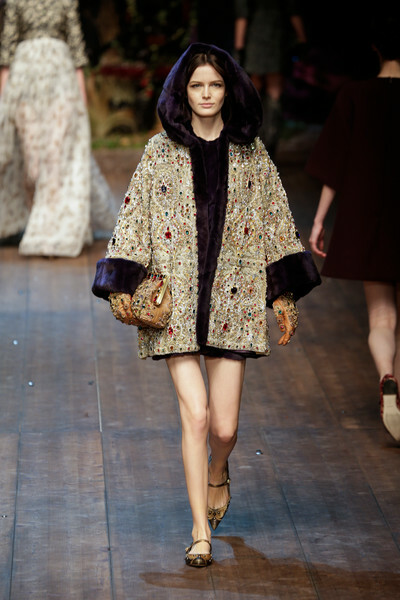 The color palette was warm (purple -amethyst-, ruby, emerald, burgundy, mustard), fabrics were rich and decorated (with beads and sequins) to the max. 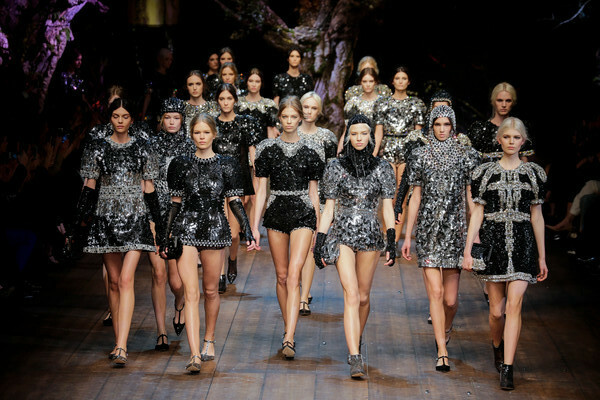 Attention was in the details, from diamond encrusted gloves to embellished handbags; this was luxury fashion at it’s finest. 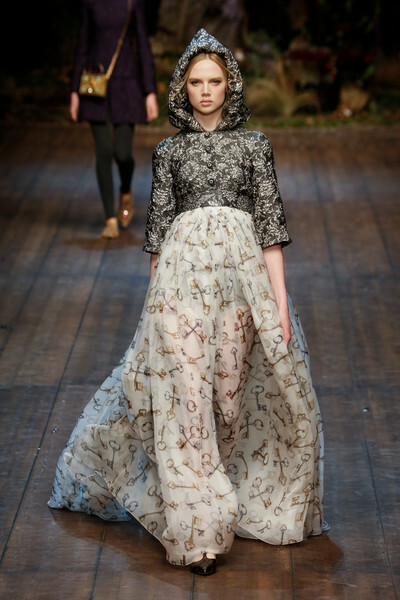 And though every single piece was beautifully made there were creations for the castle’s servants and there were show stopping princess gowns. 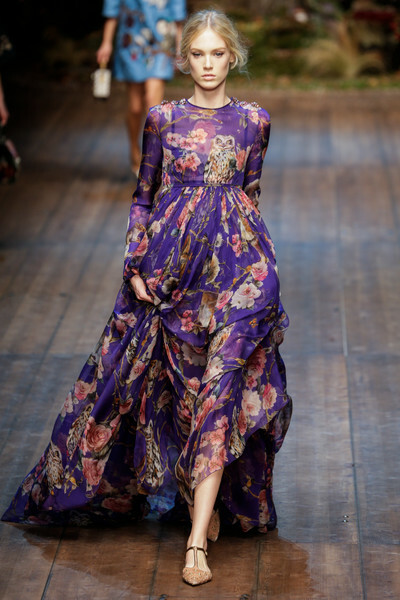 One purple, floral printed, sheer dress, another in yellow and the closing look in red were truly magical. 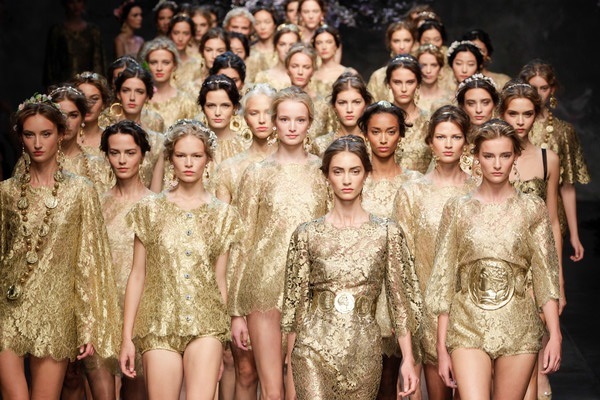 Not to mention the grande finale full of glittery Tinkerbell dresses. 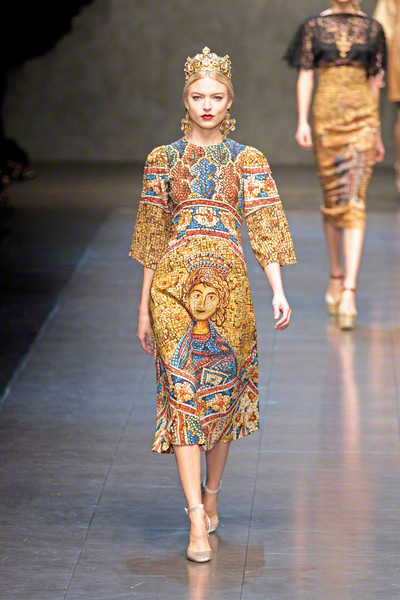 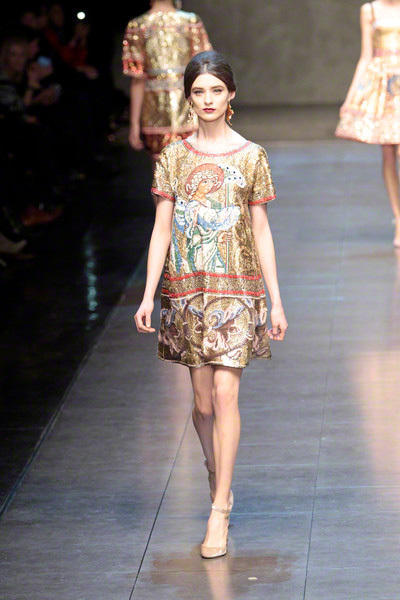 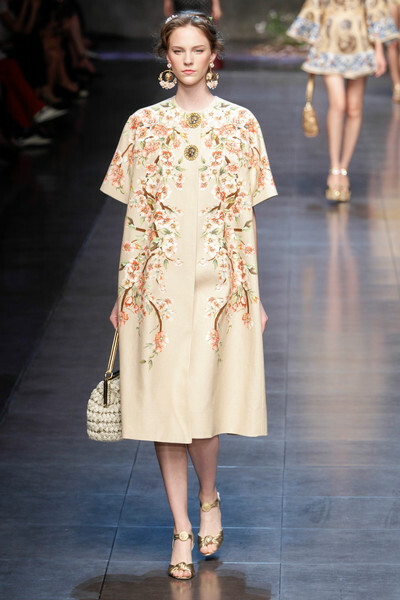 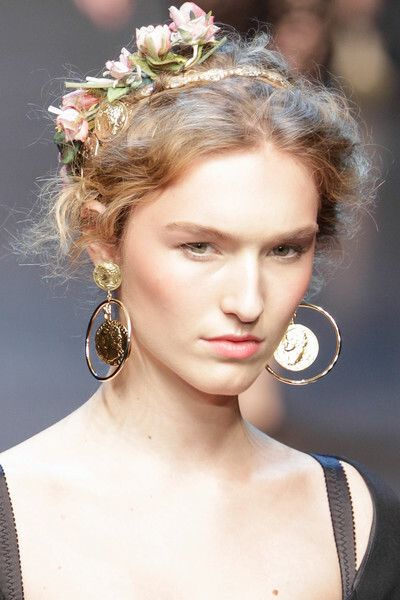 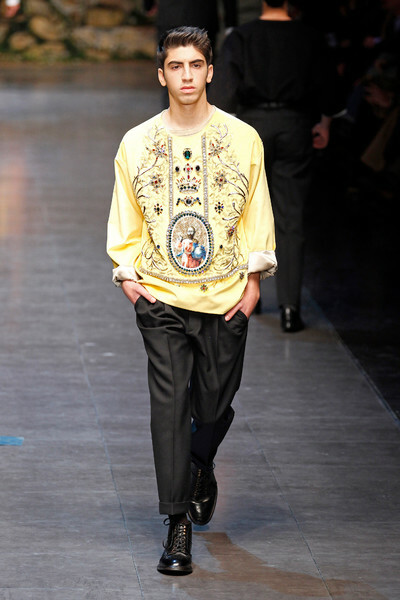 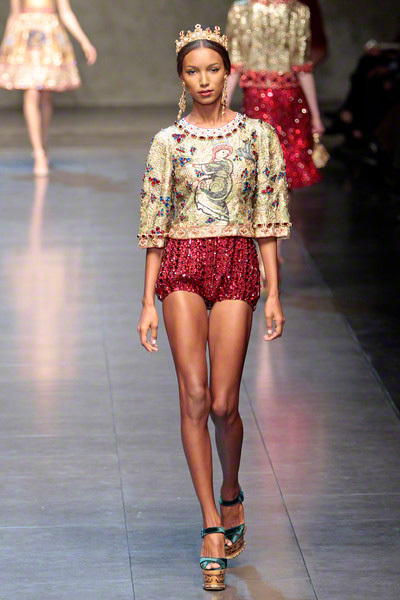 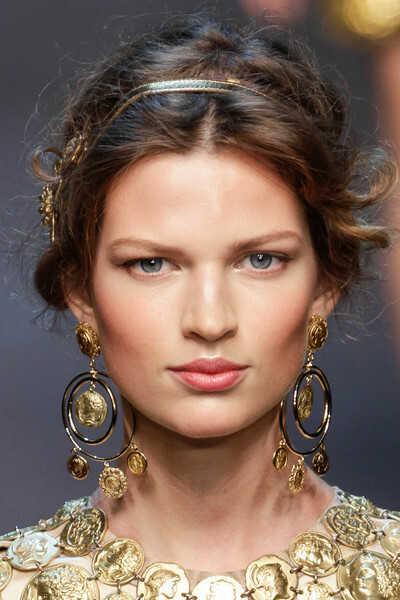 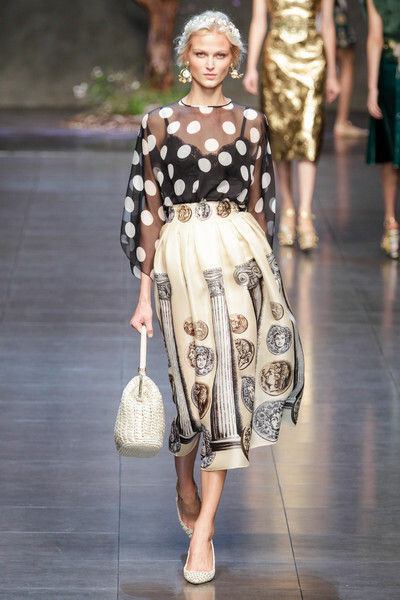 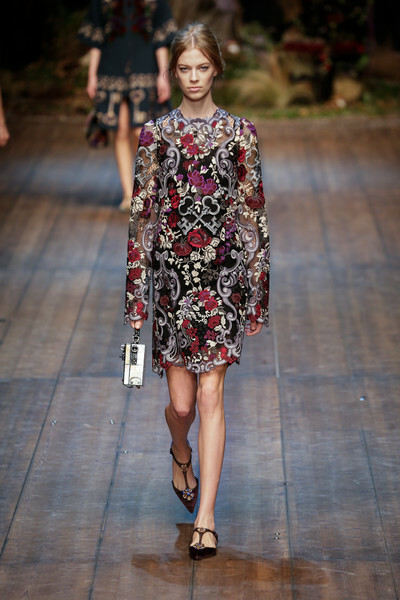 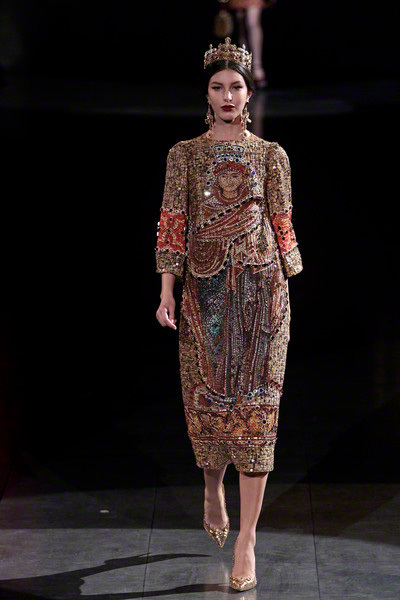 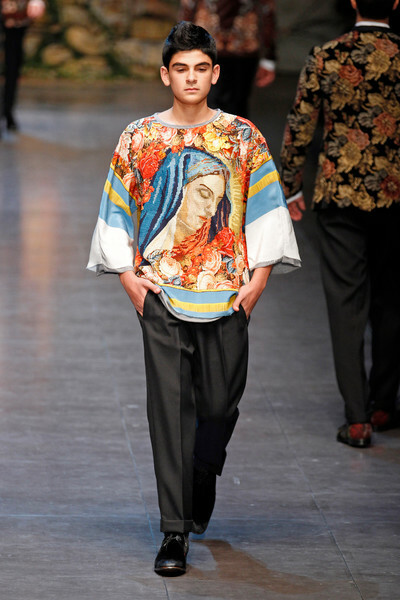 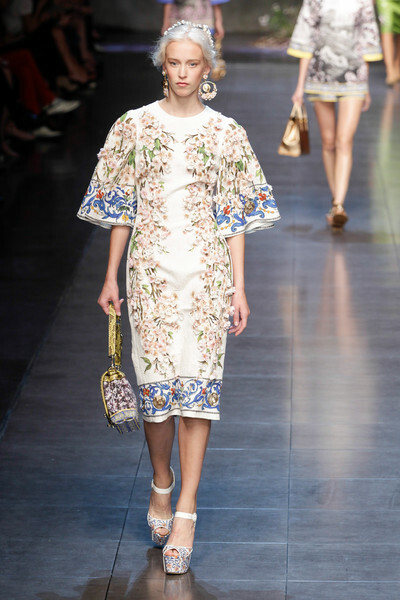 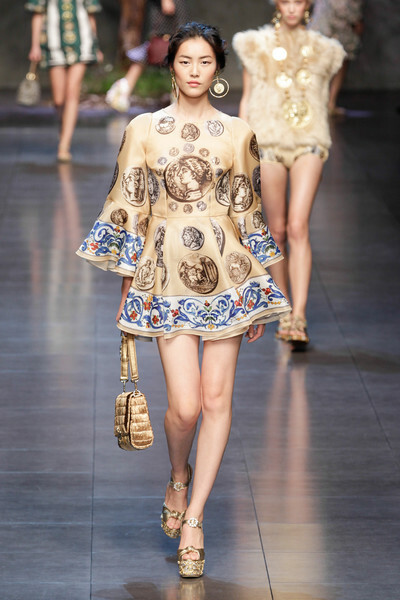 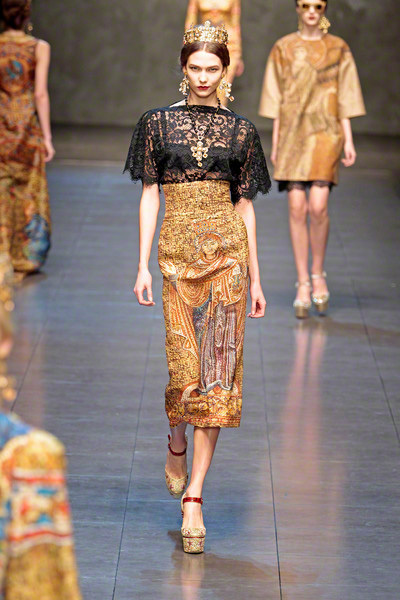 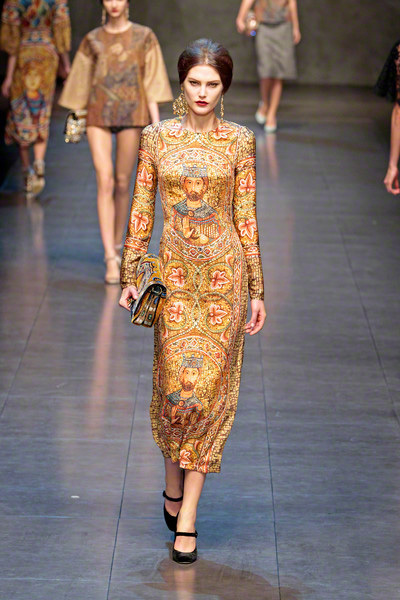 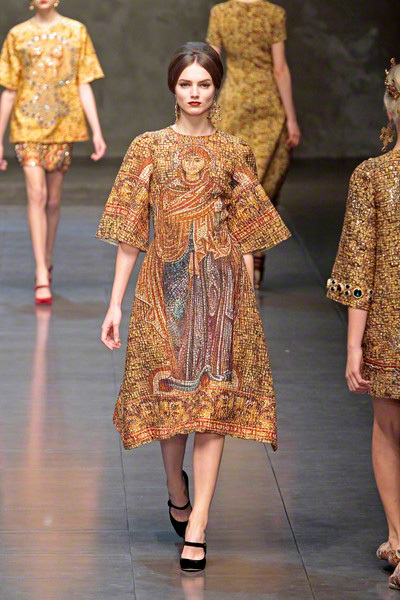 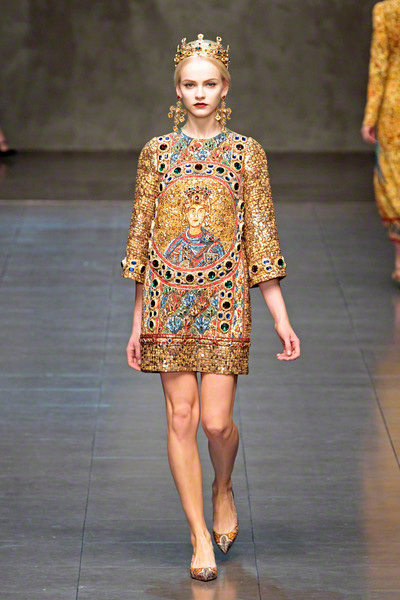 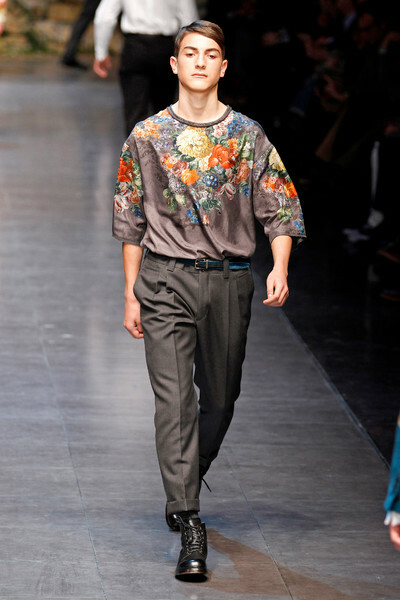 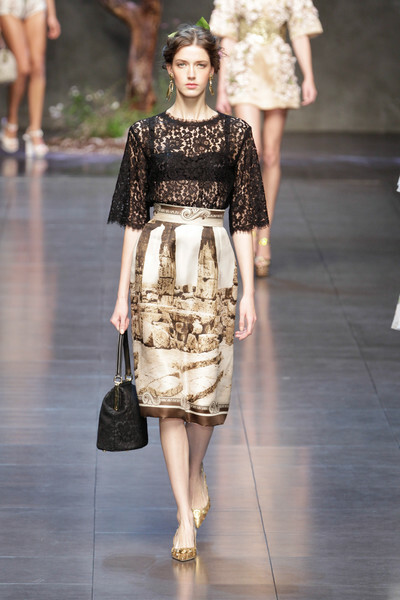 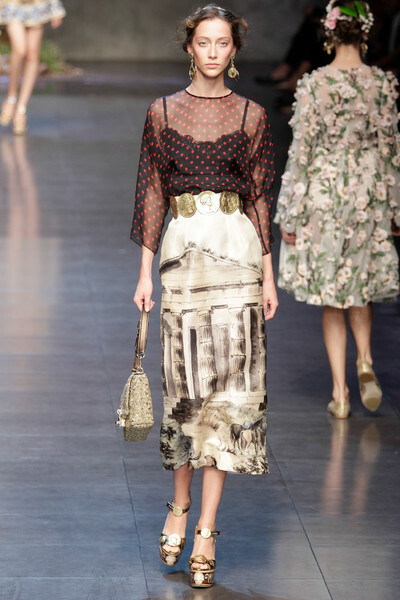 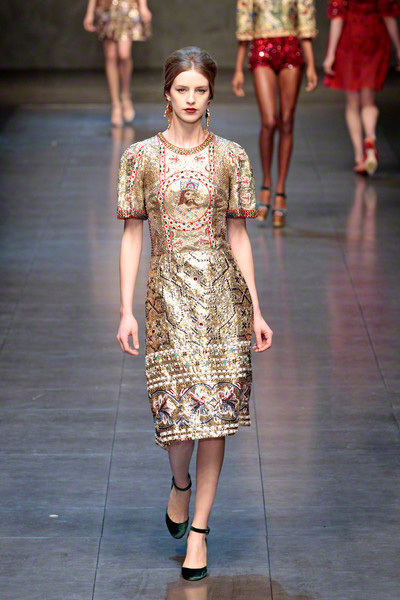 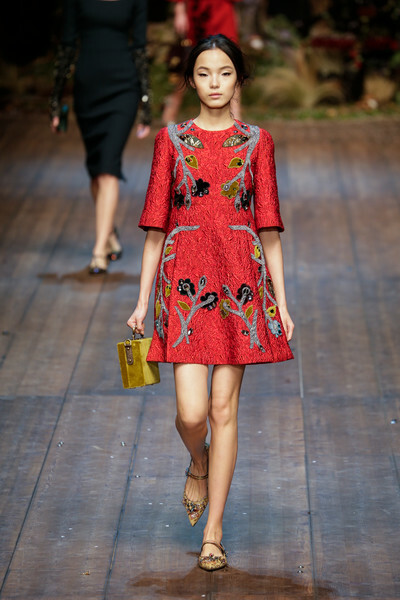 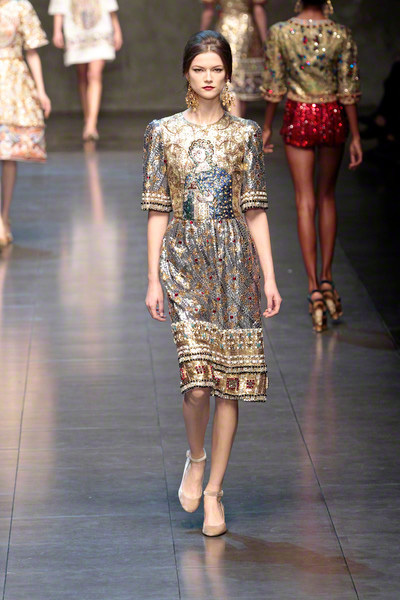 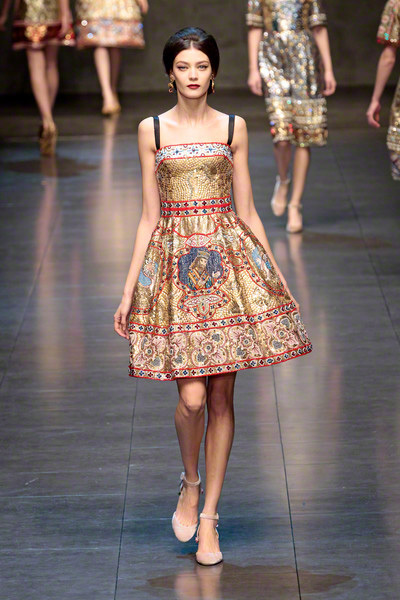 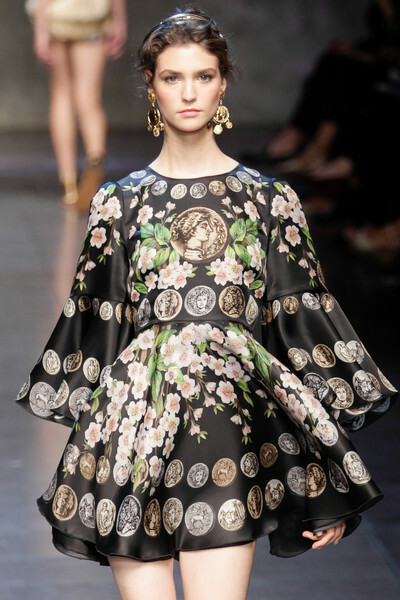 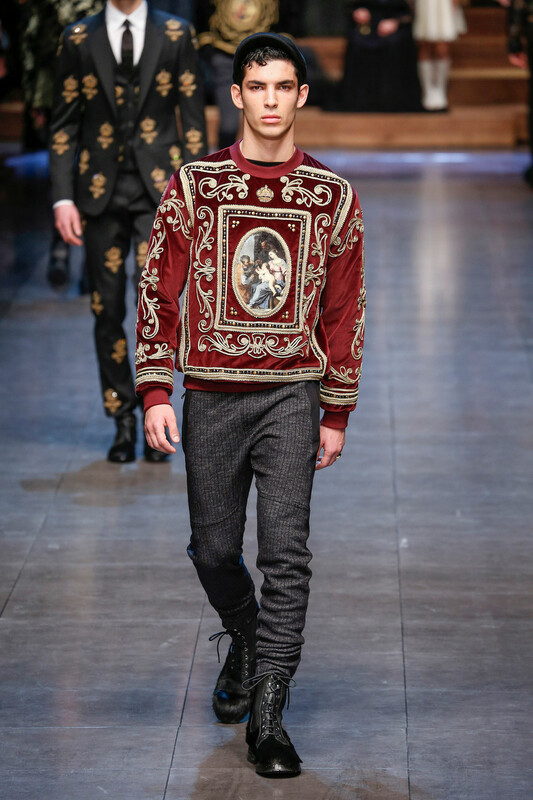 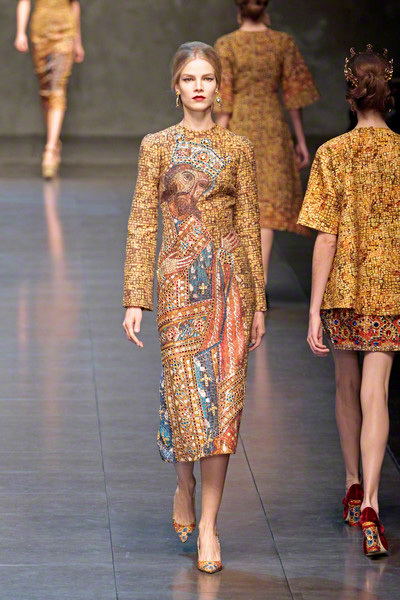 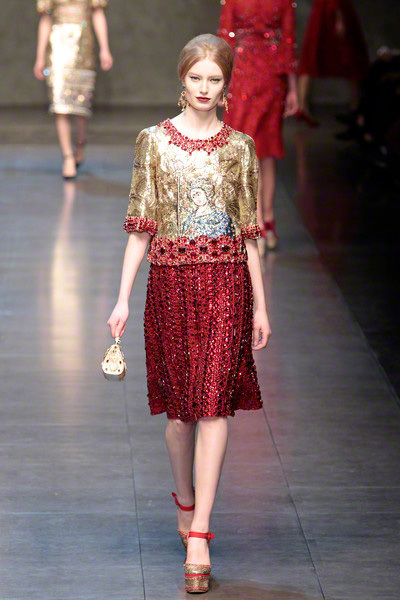 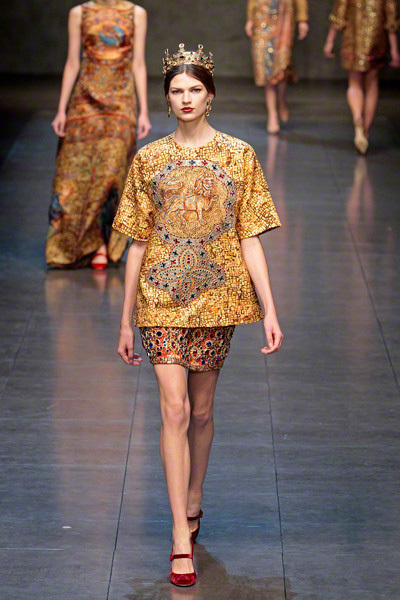 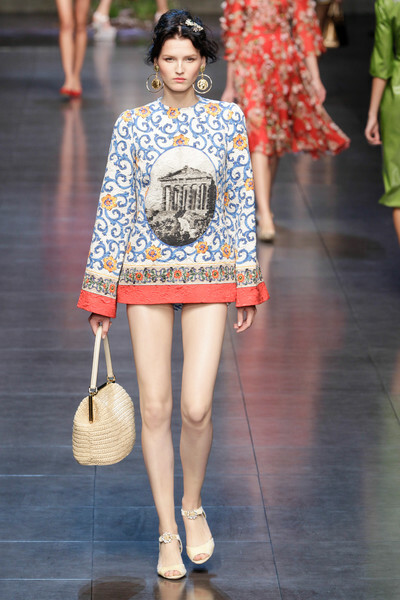 We’re enchanted..
Dolce & Gabbana still don’t get enough of Sicilian culture. 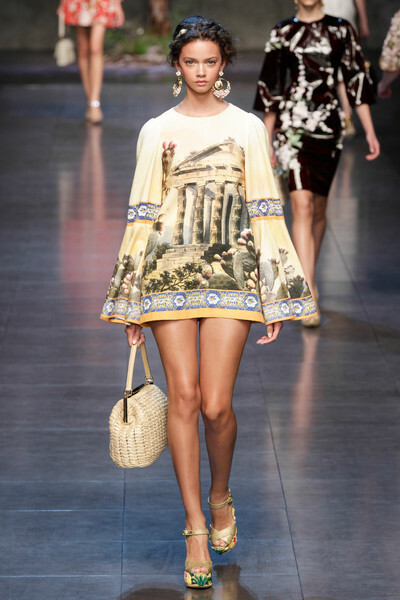 For their ss2014-collection they focused at the islands interaction with Greek culture in the ancient world. 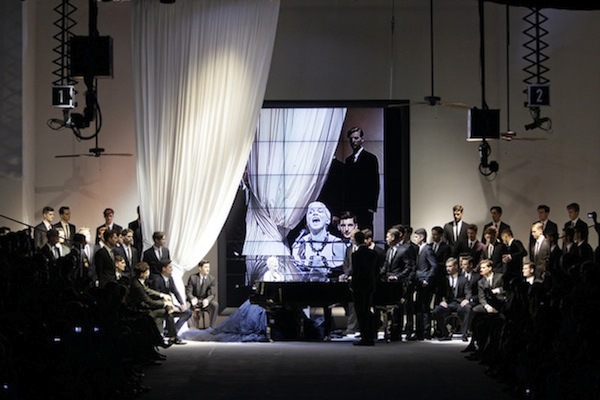 they used old photographs of ruined amphitheaters as prints. 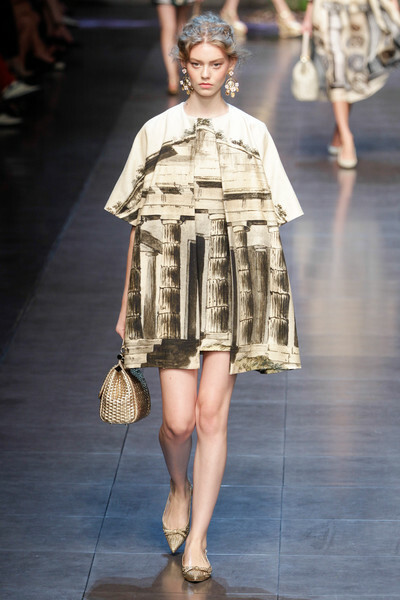 Ionic columns were reproduced as heels on shoes. 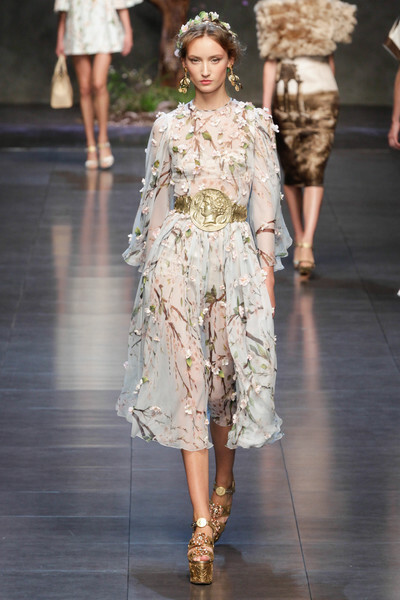 The gold coins that exploded into chunky corset belts looked witty, especially when those belts gripped delicate dresses petaled with Sicily’s almond blossom. 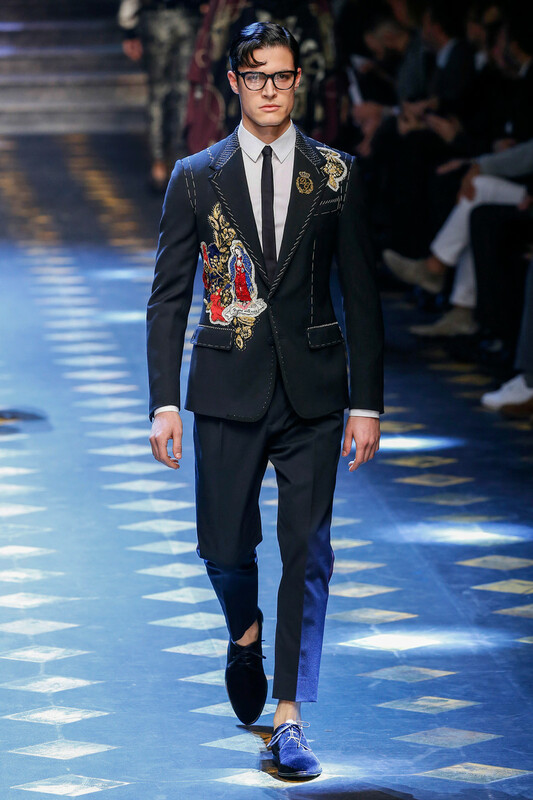 That hard/soft contrast buy viagra without prescription is a Dolce & Gabbana signature, the same way that a woman in a bustier and black lace slip is anything but vulnerable. 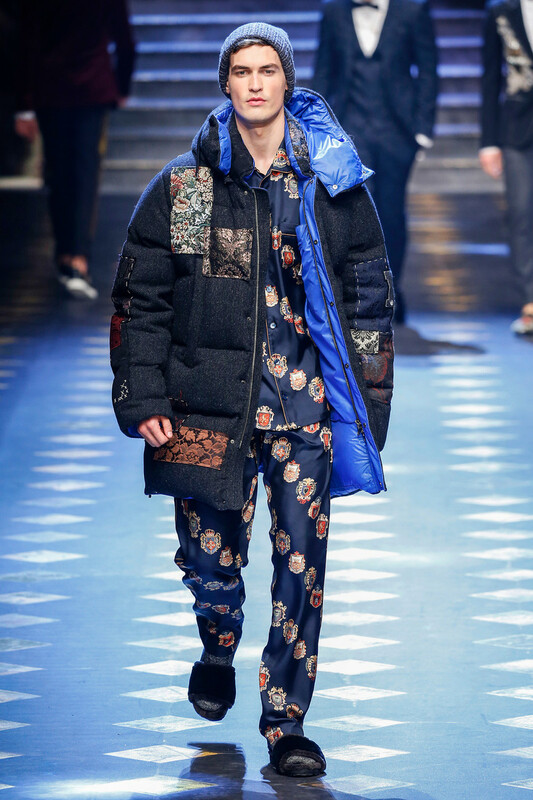 The collection was described as “an unconscious dream”: the clothes embodied the blend of the real and the irrational that can only be found in dreams. 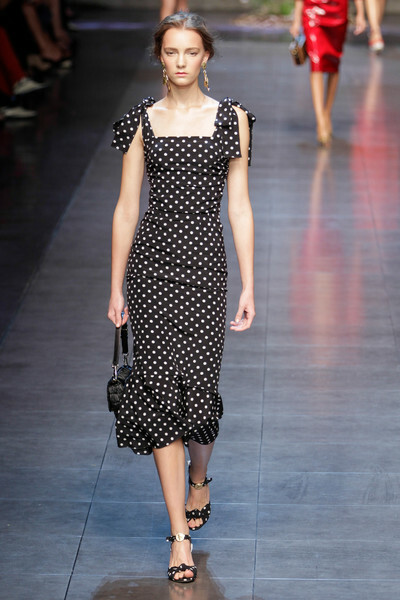 Sophia Loren was a reference point, as seen in the red slip-dress with black bra showing, the sheer polka-dotted blouses, pencil skirts, and coat-dresses. 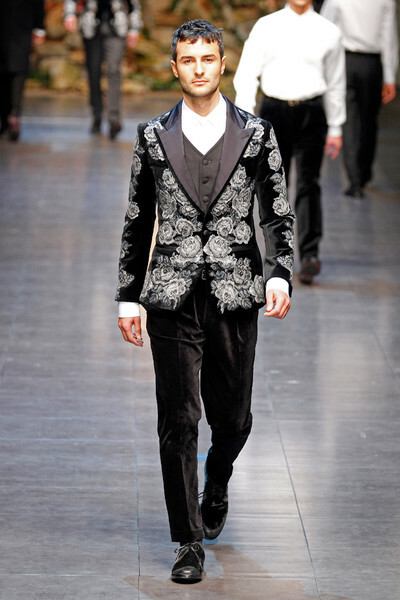 What brought everything together was the wonderful workmanship and fabric research. 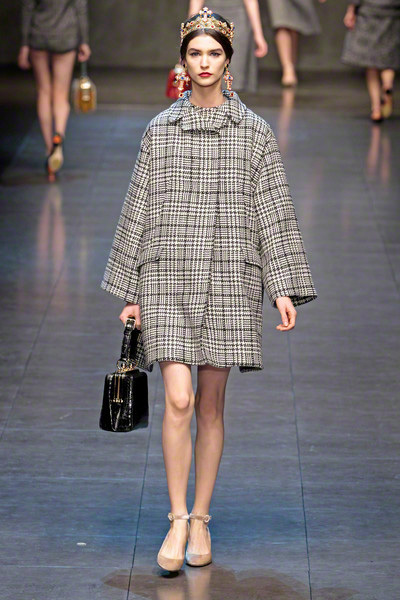 It always makes a nice picture when designers use the differences and opposites in men’s clothes wear and women’s in their collection. 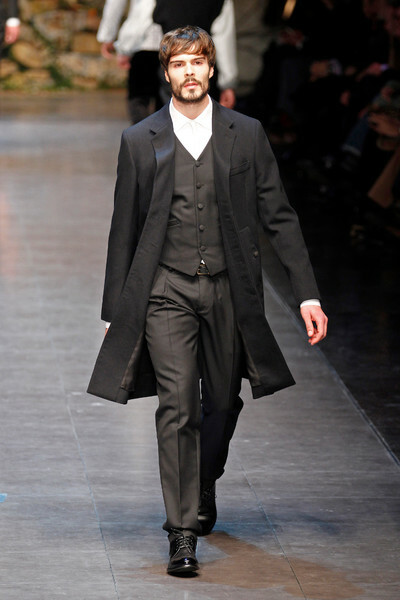 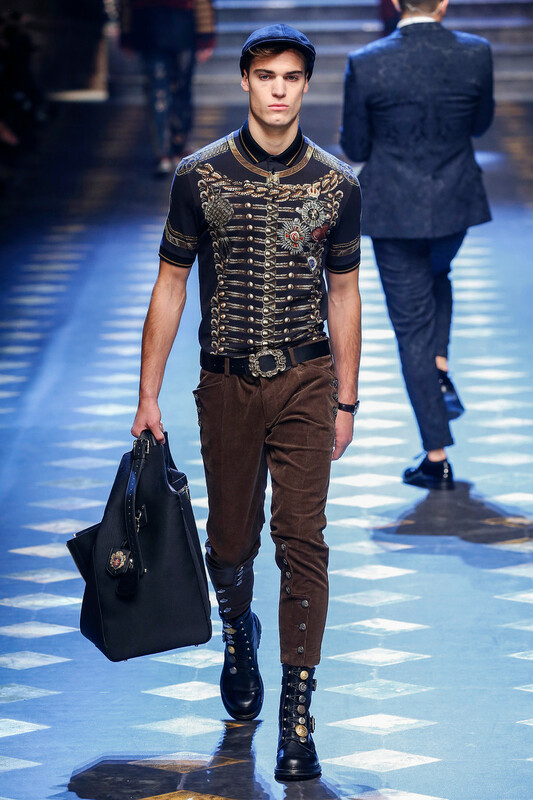 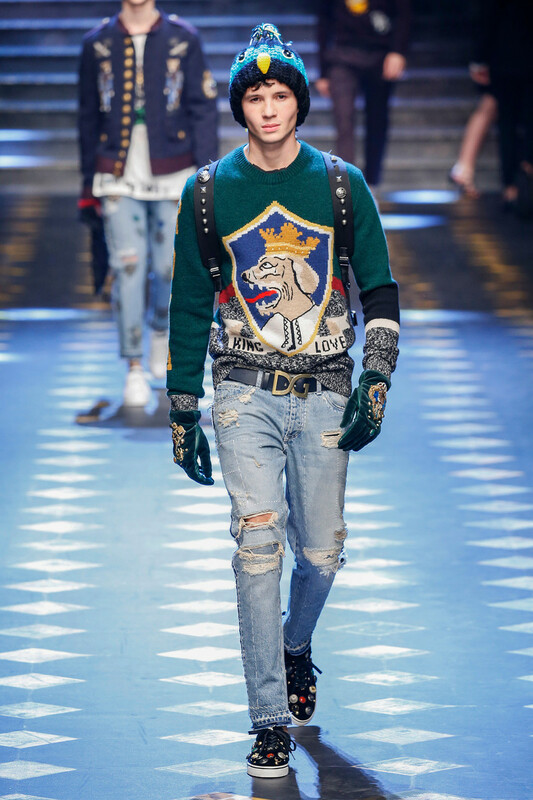 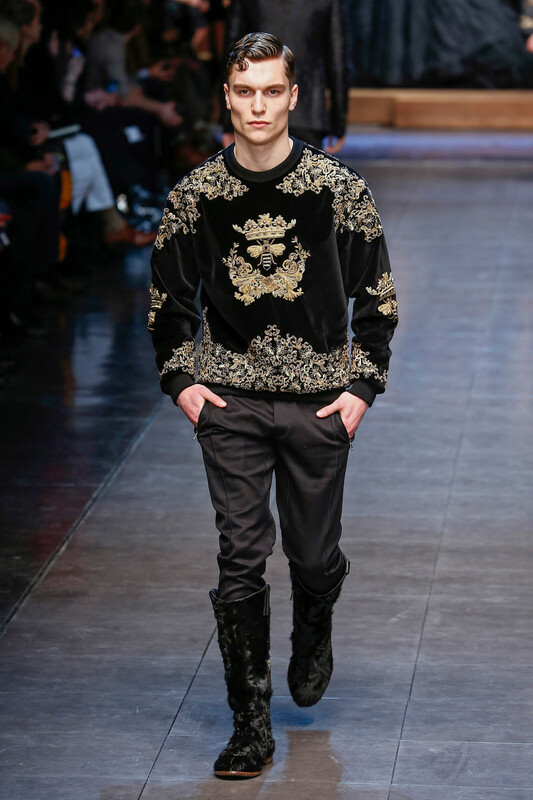 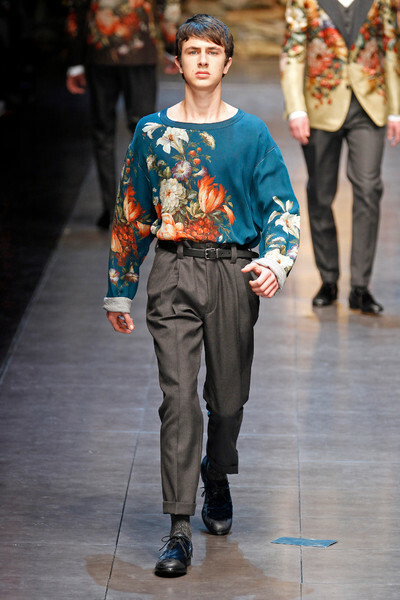 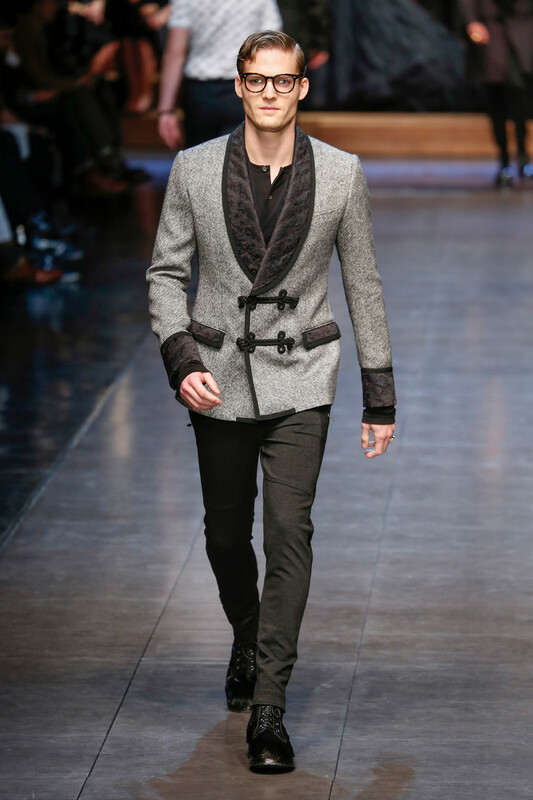 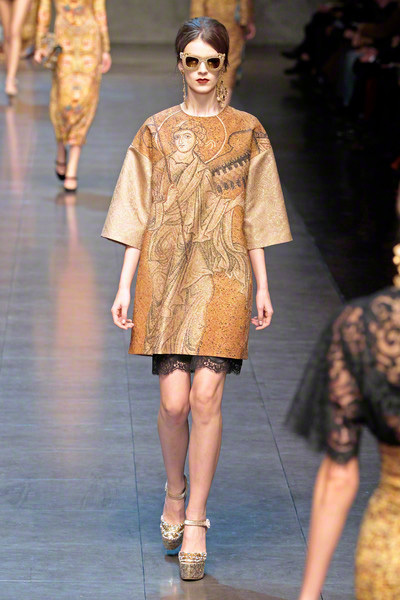 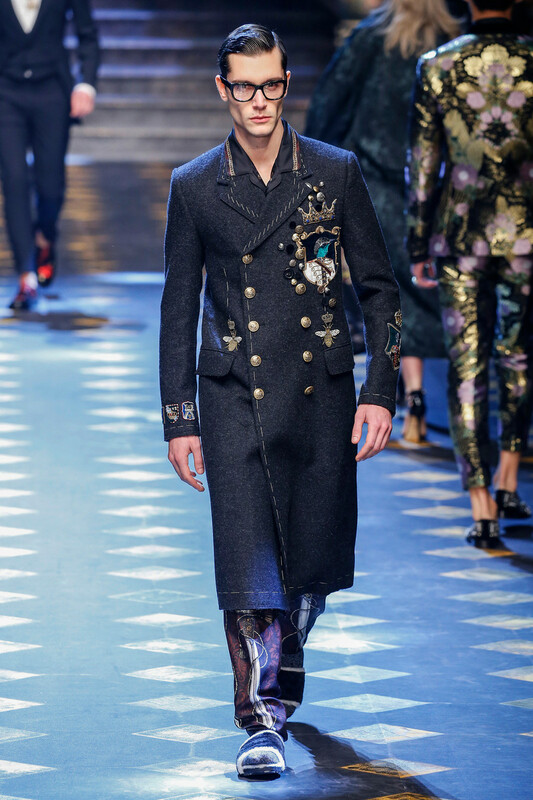 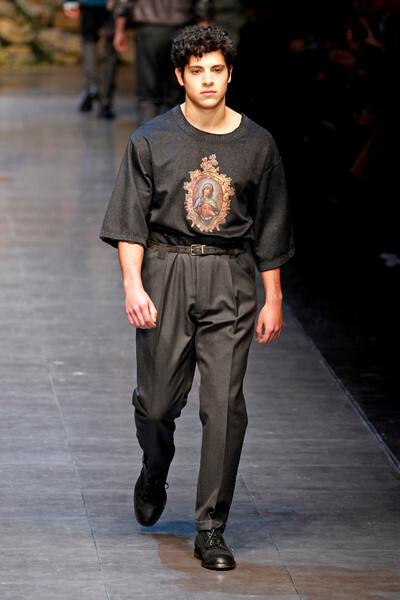 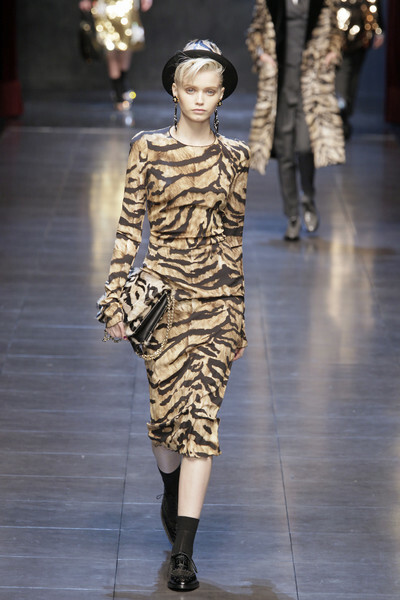 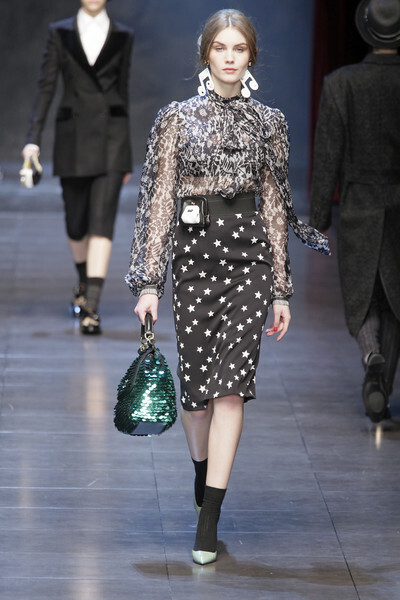 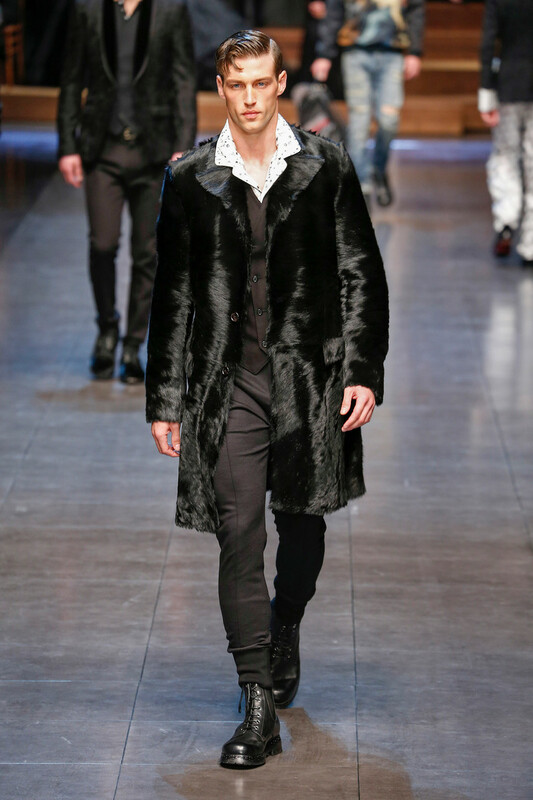 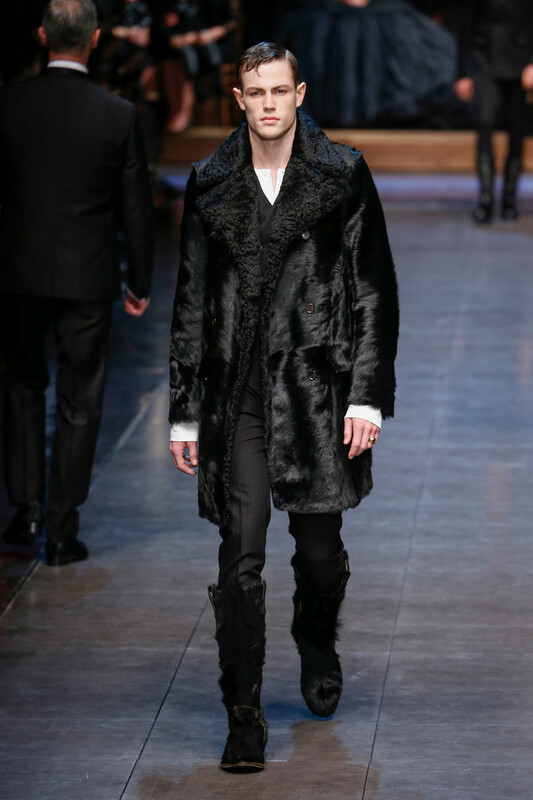 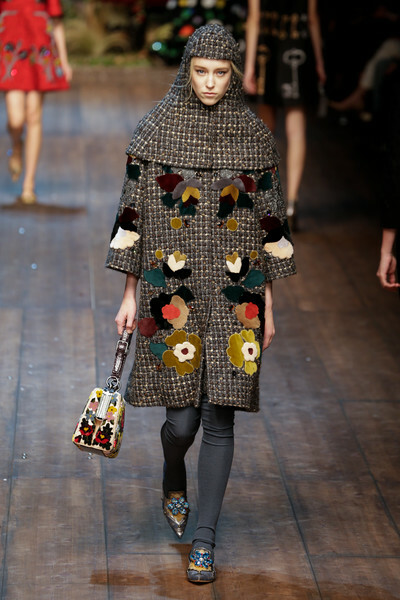 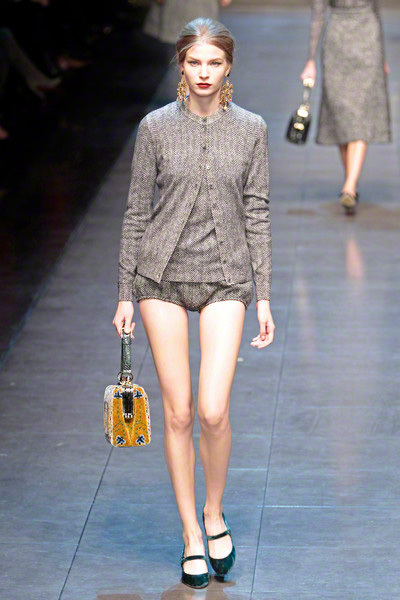 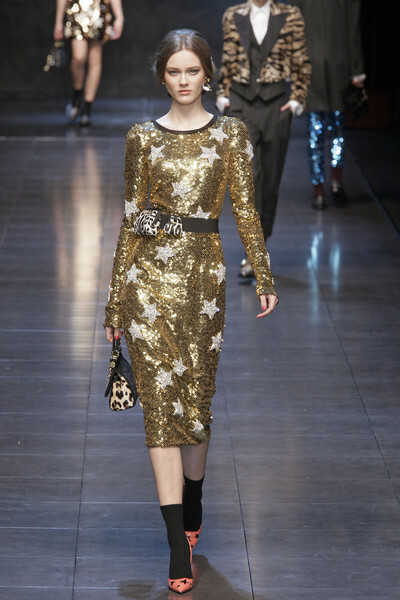 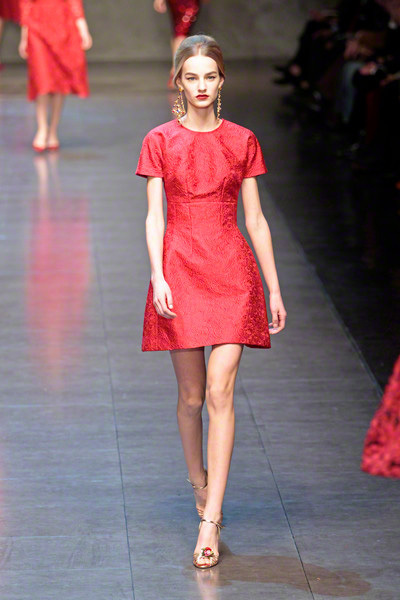 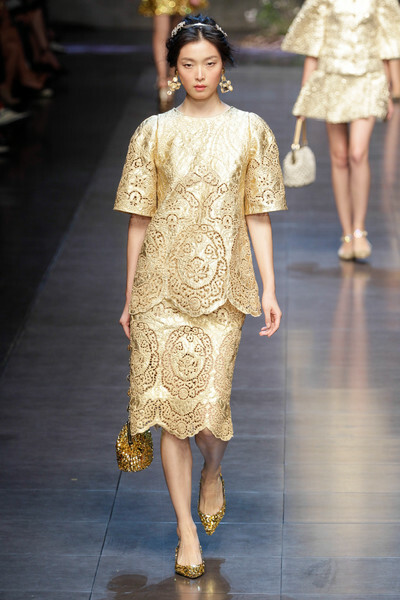 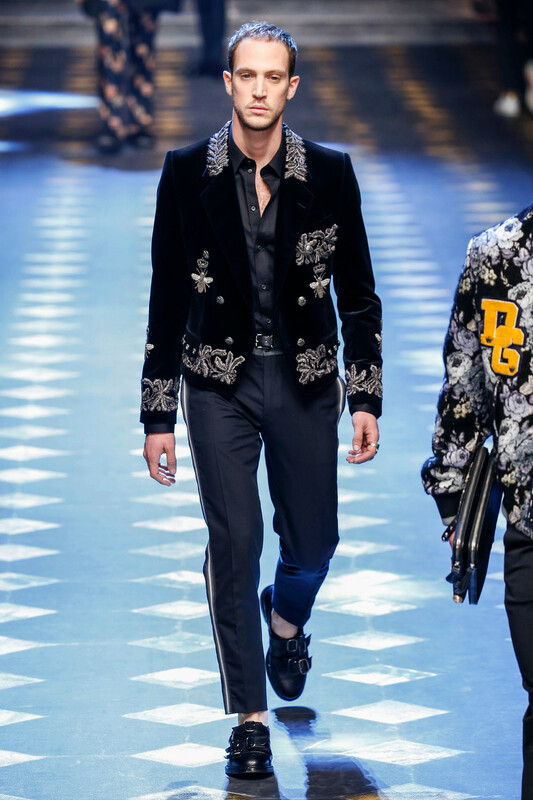 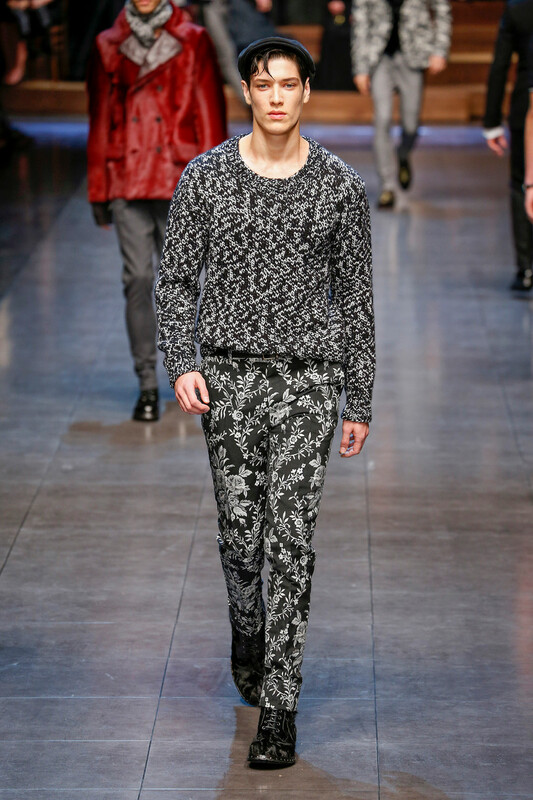 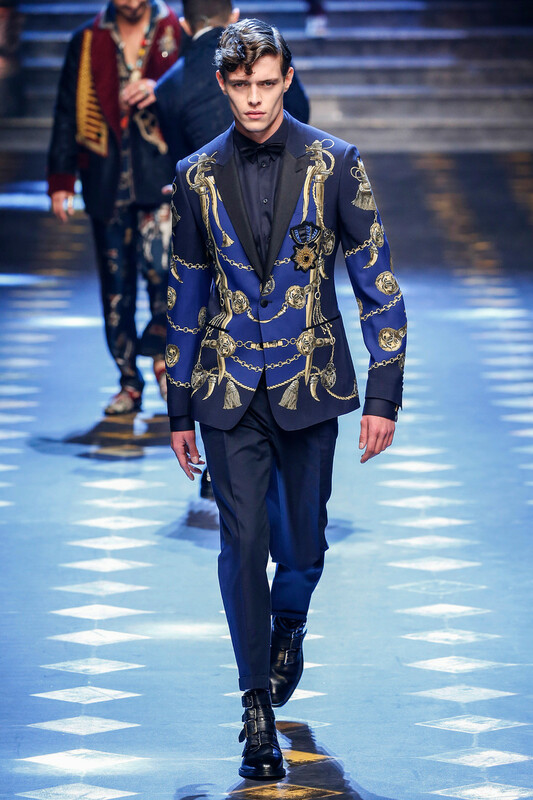 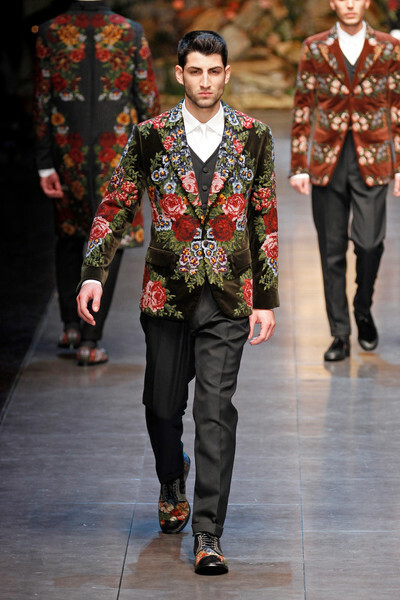 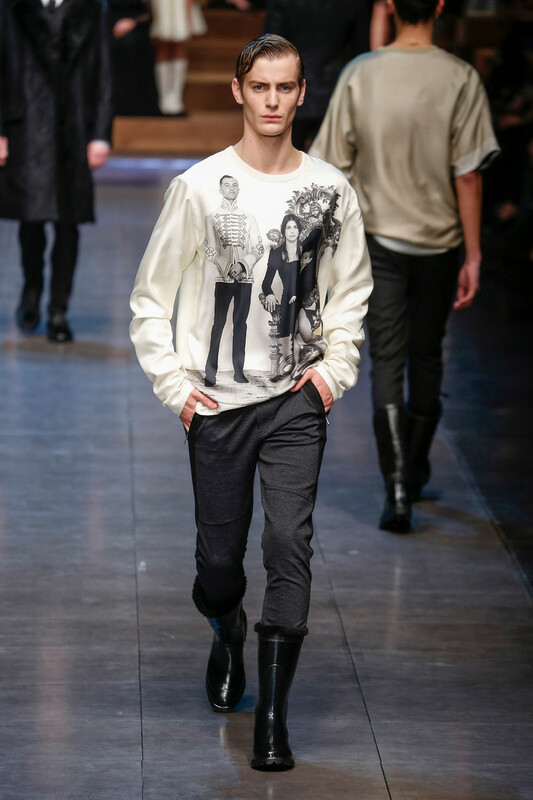 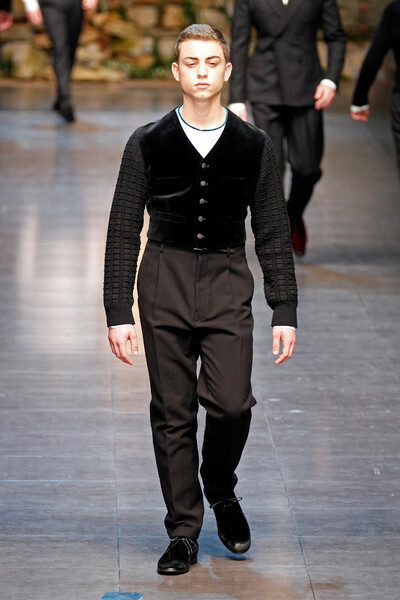 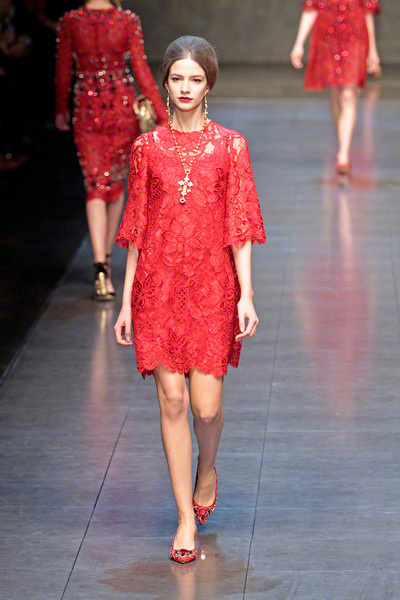 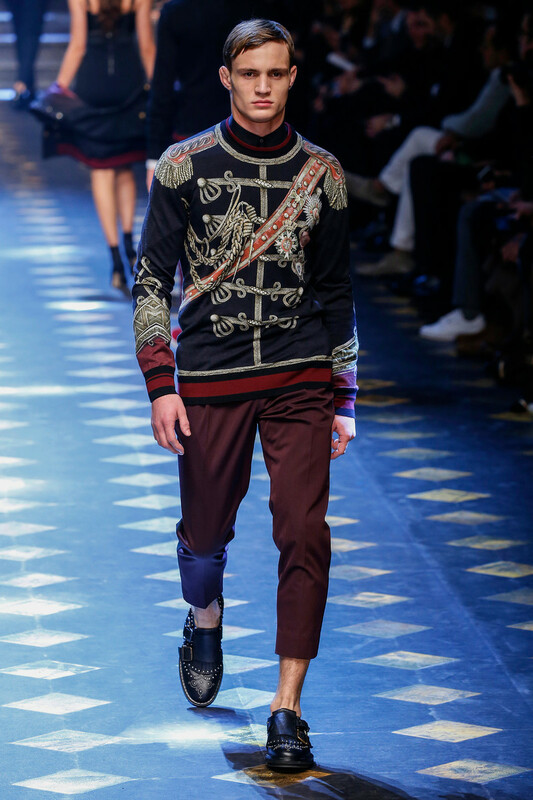 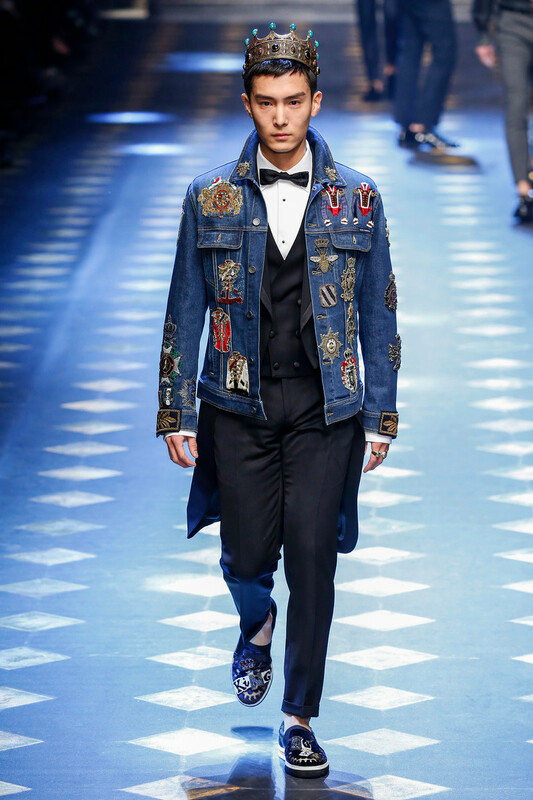 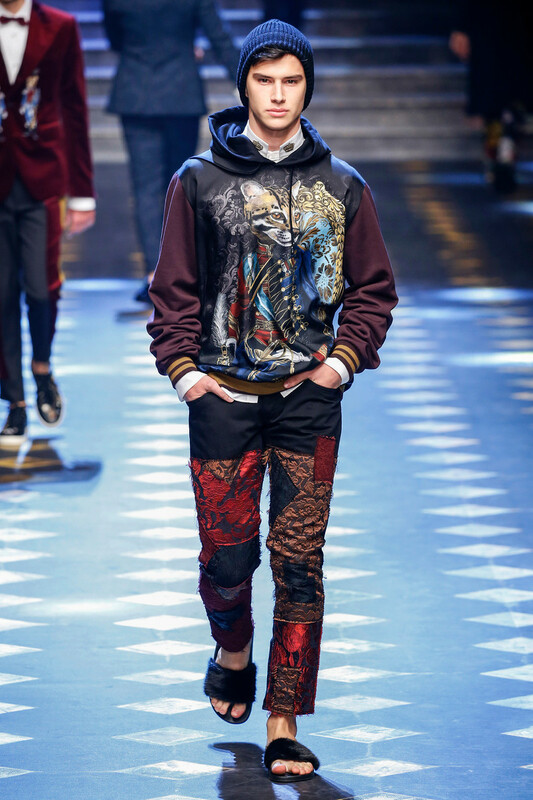 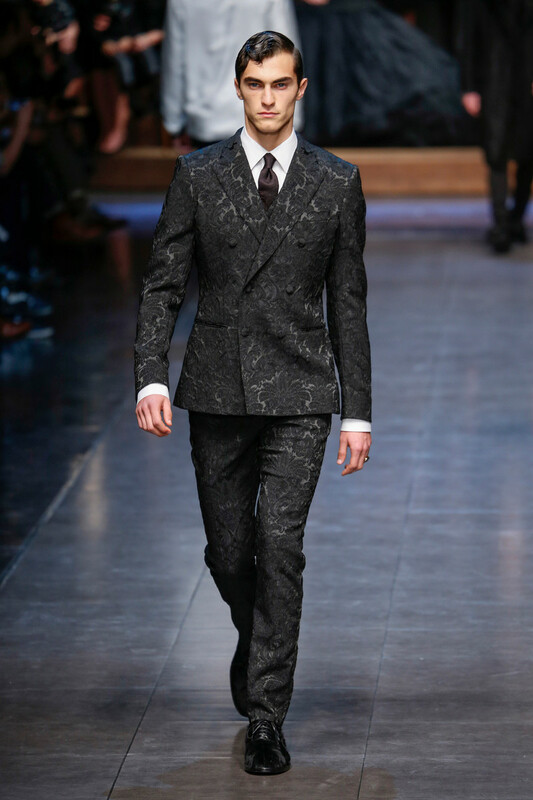 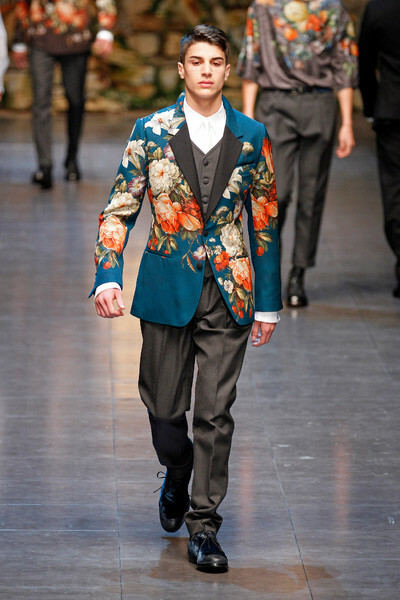 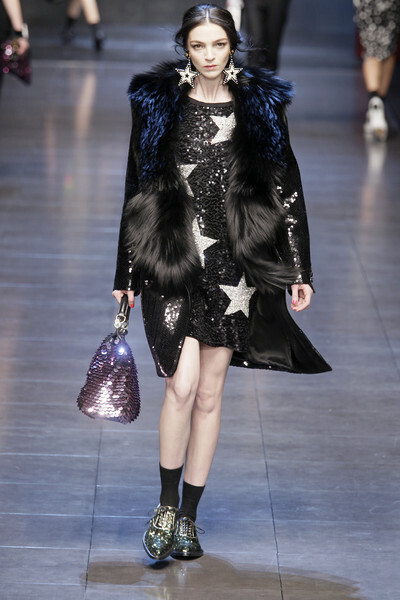 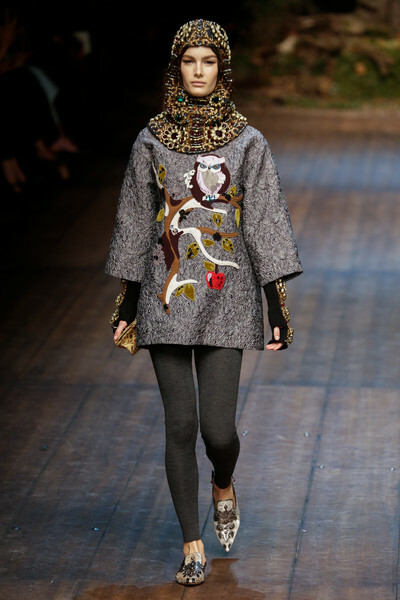 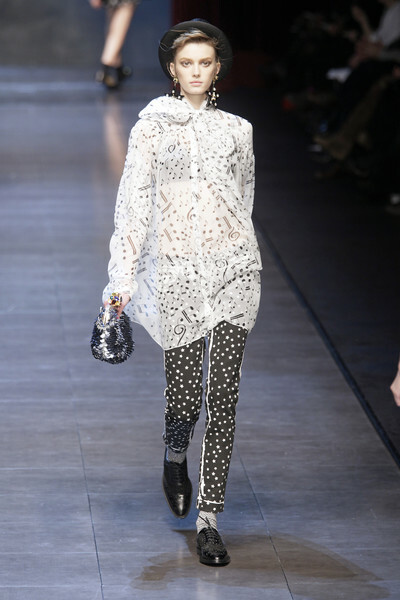 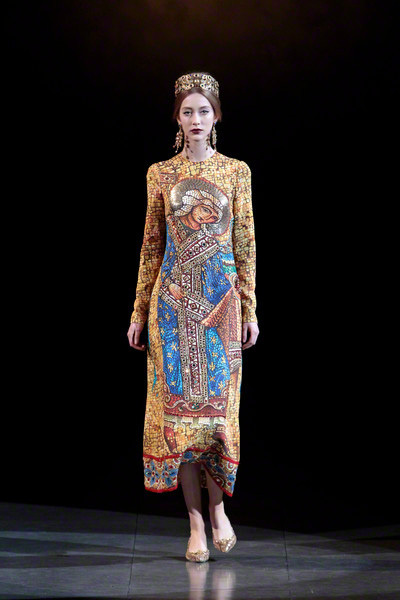 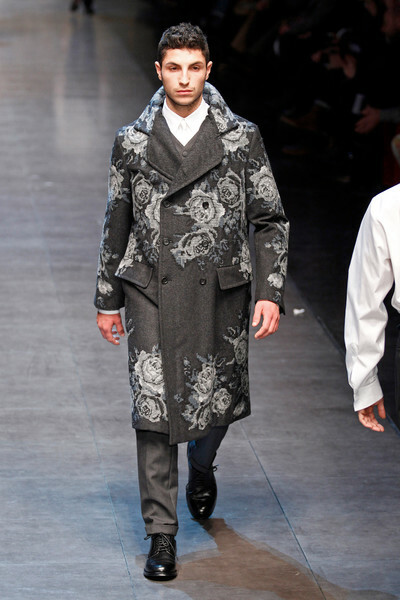 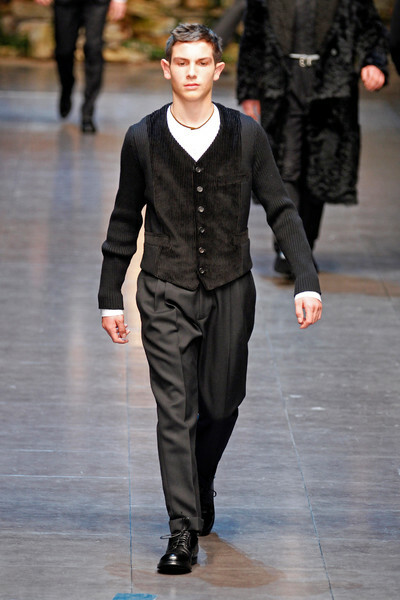 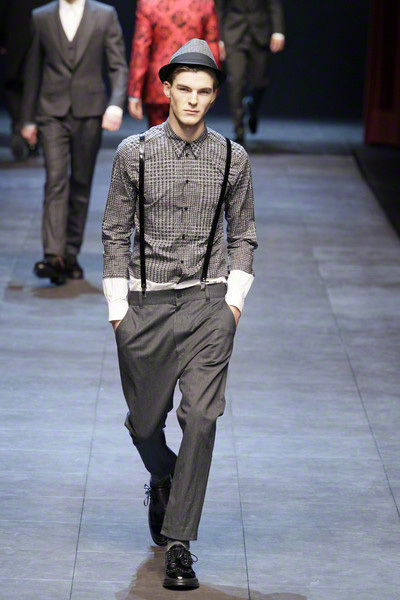 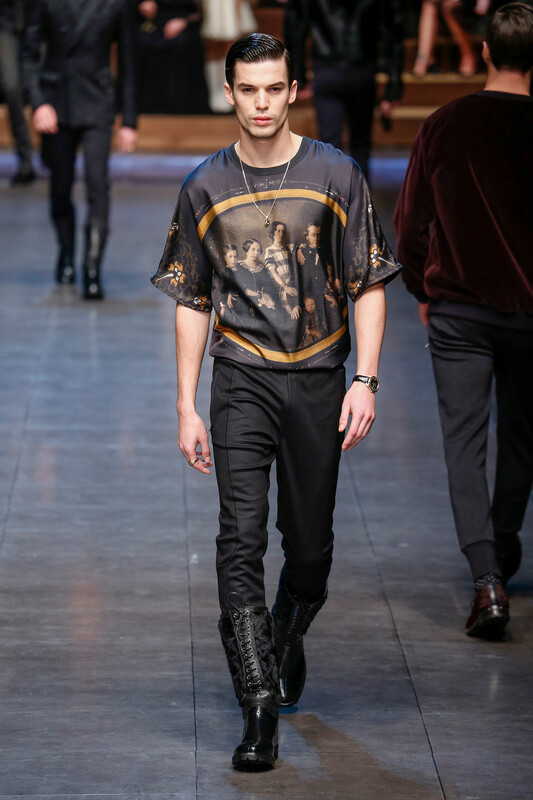 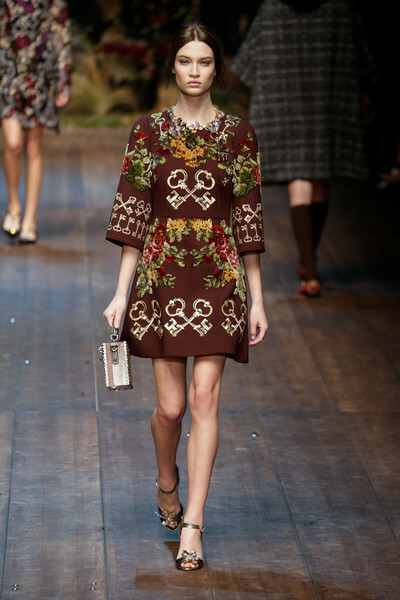 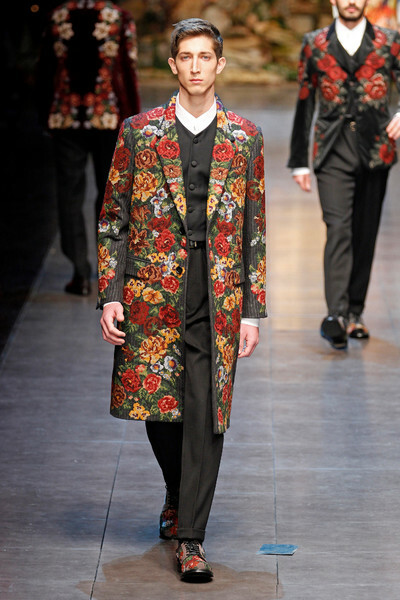 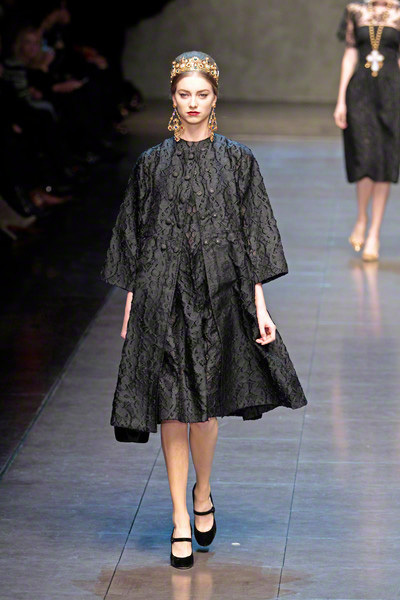 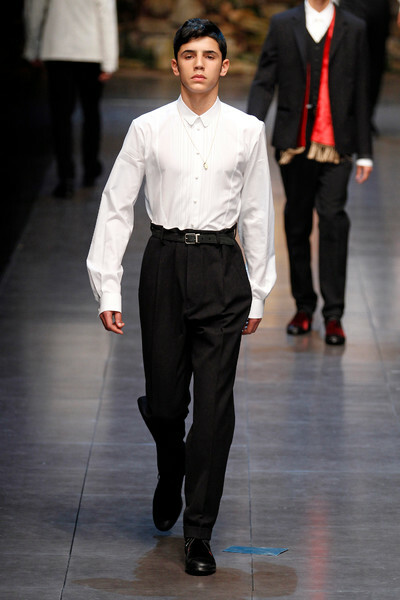 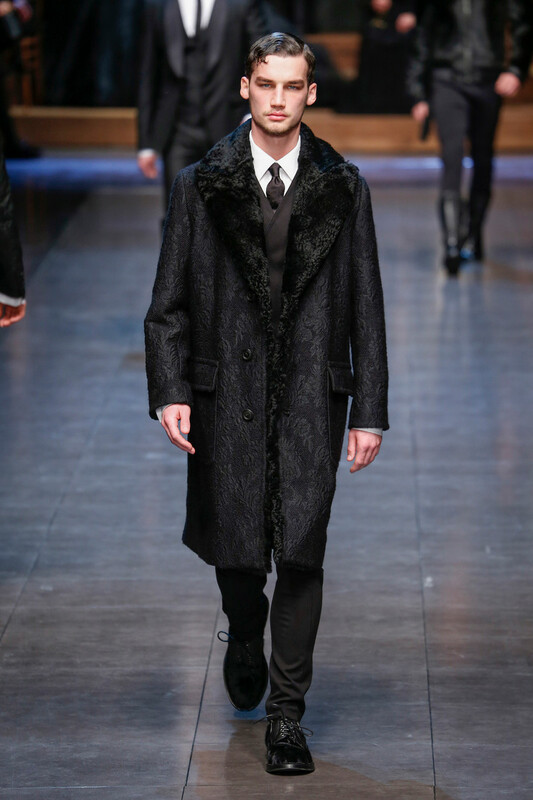 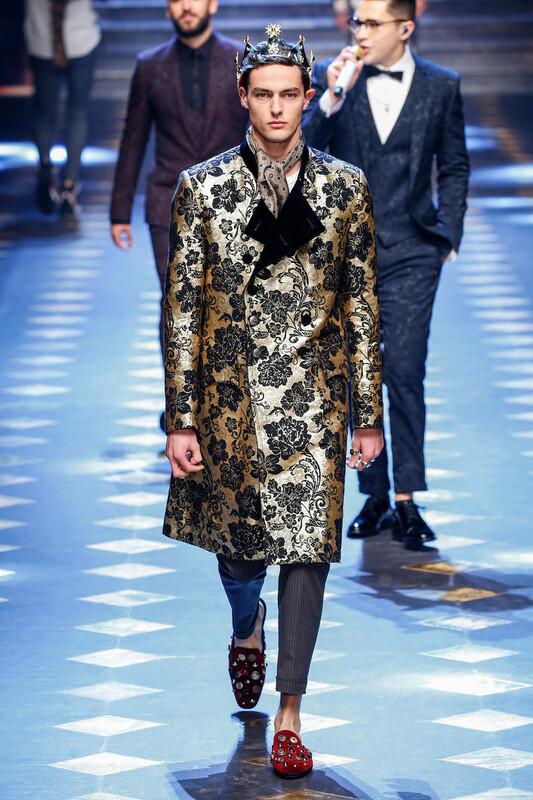 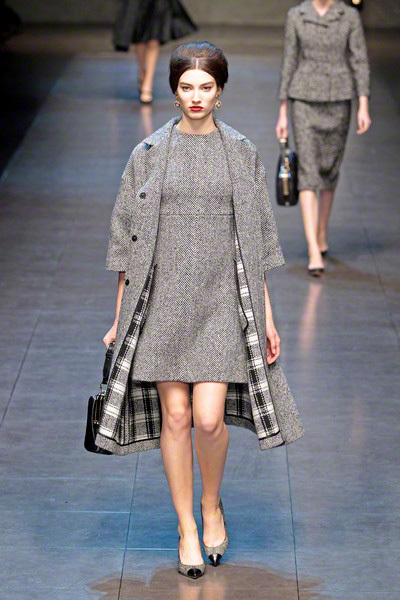 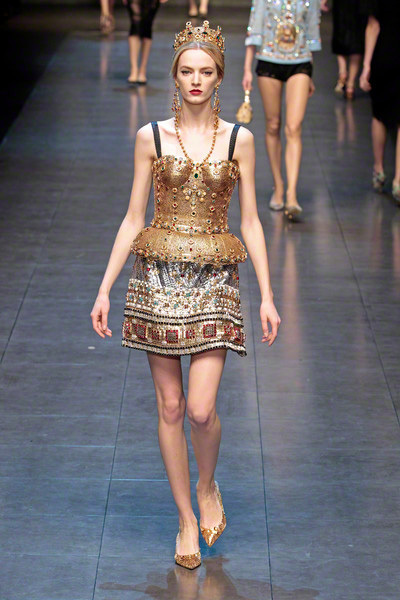 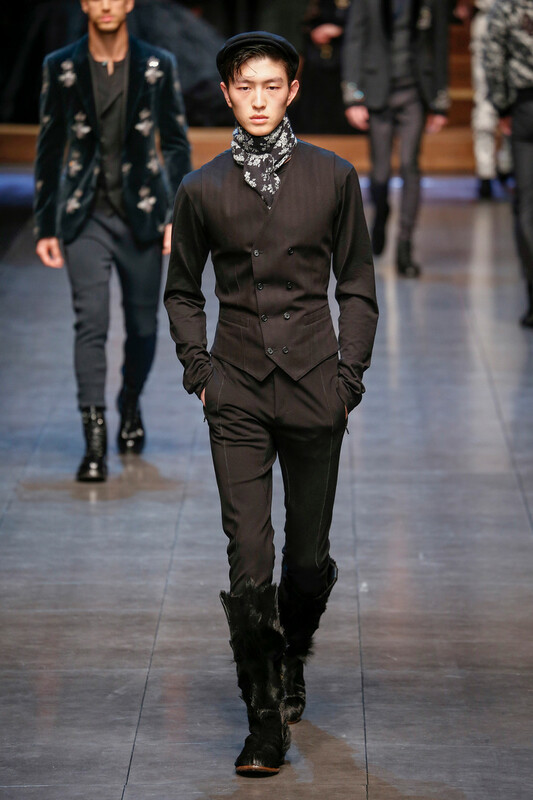 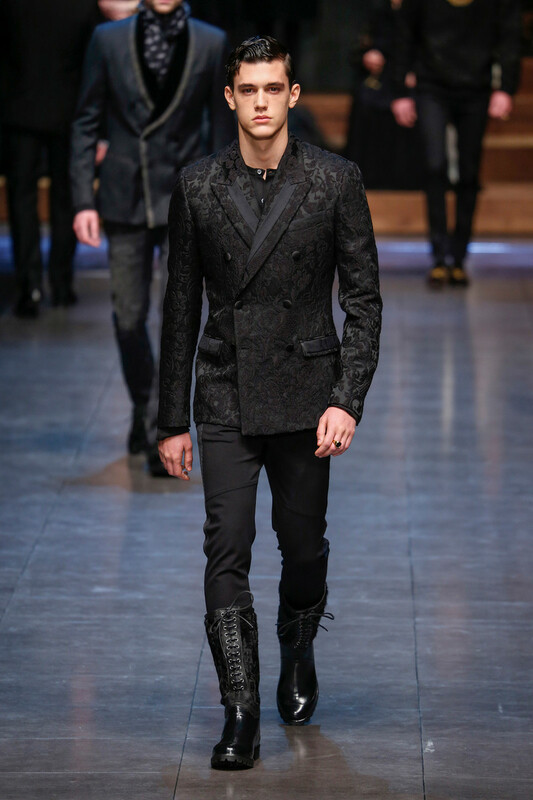 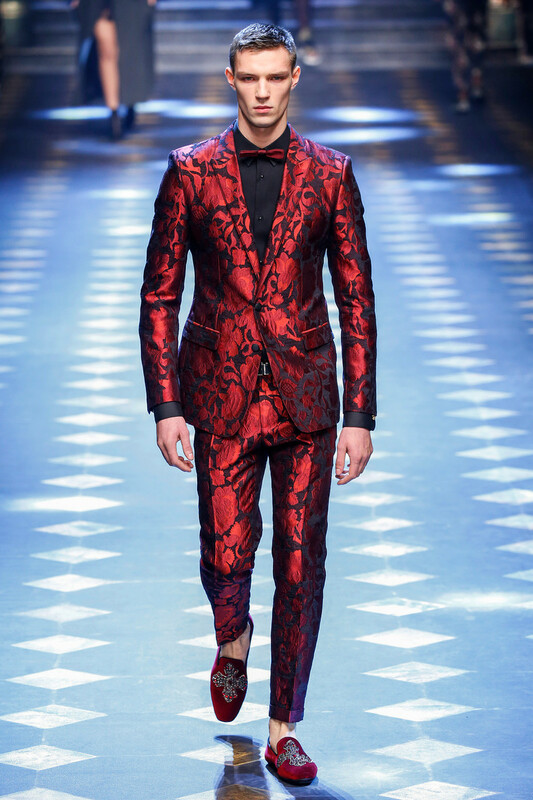 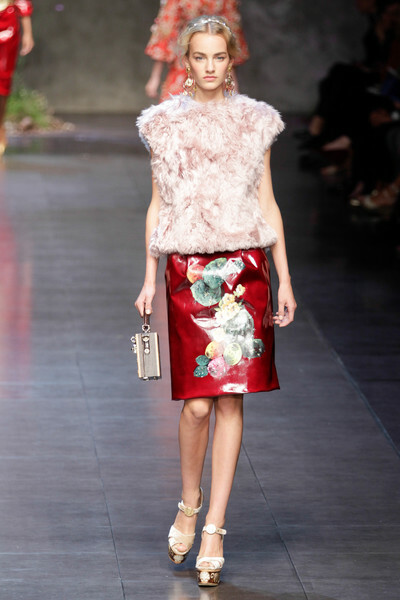 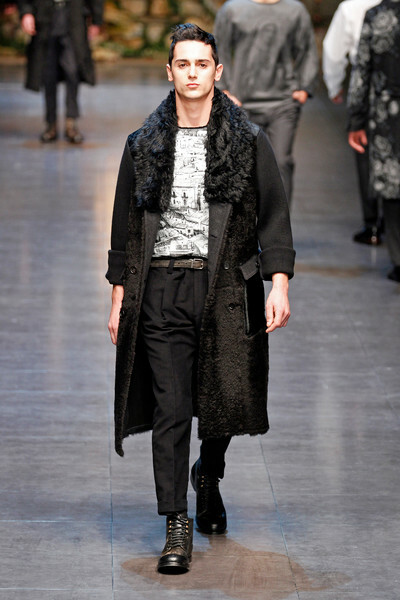 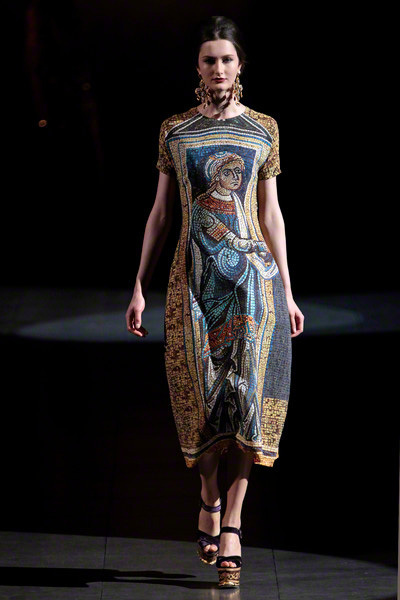 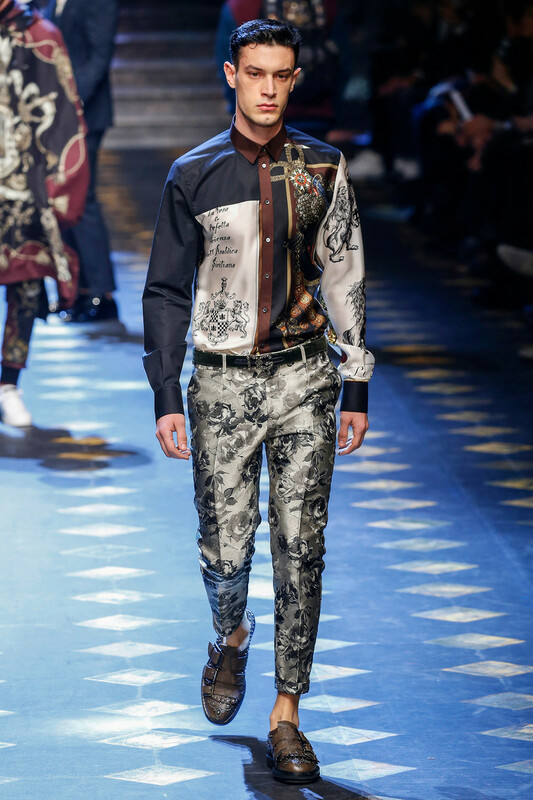 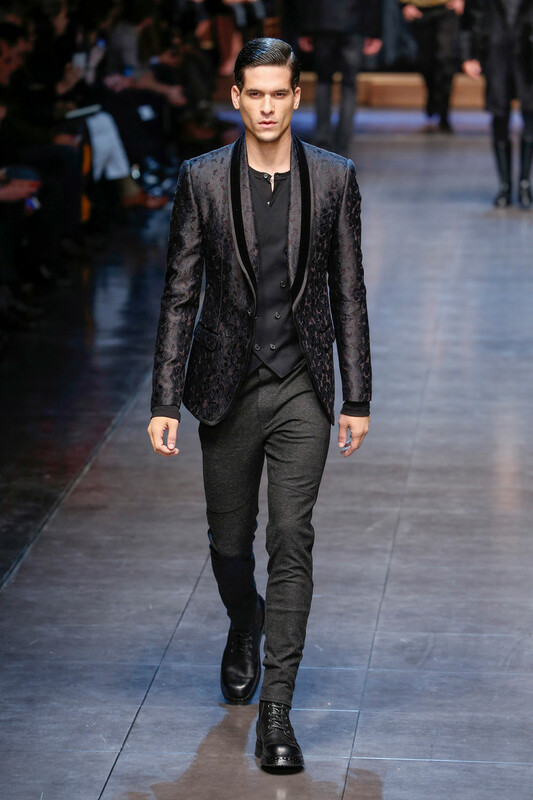 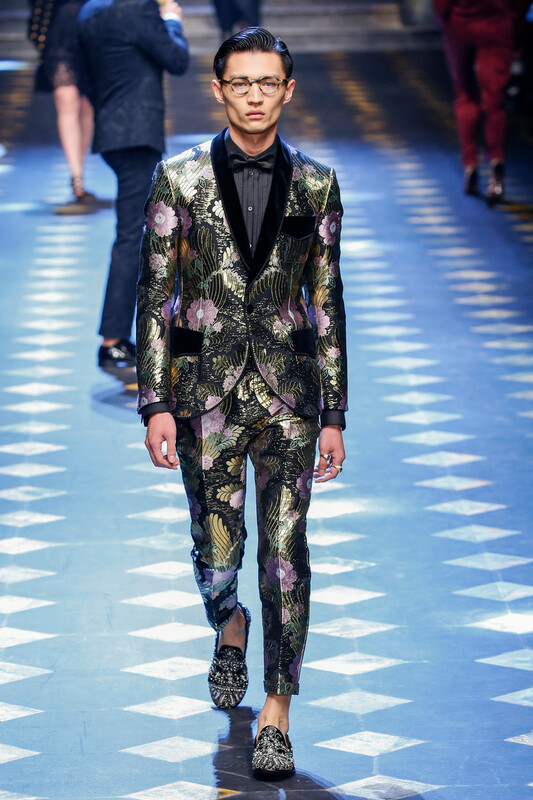 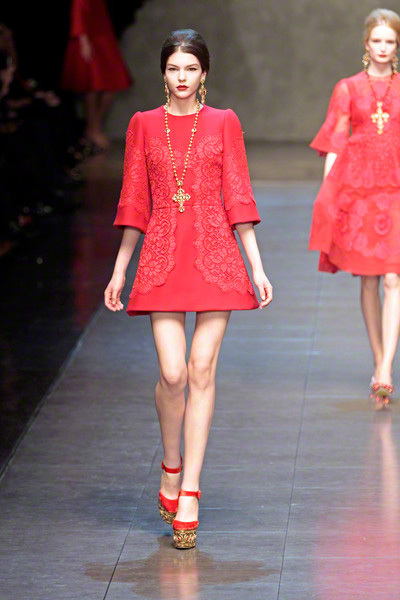 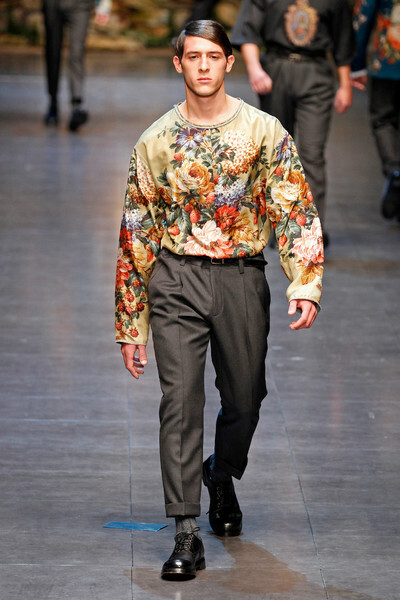 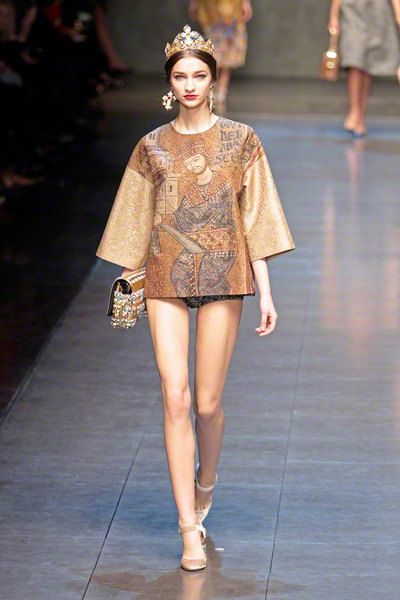 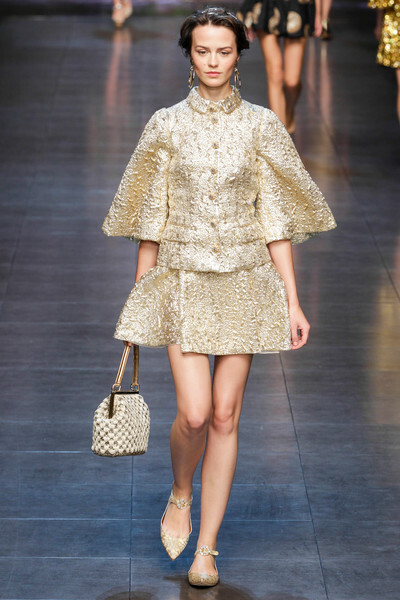 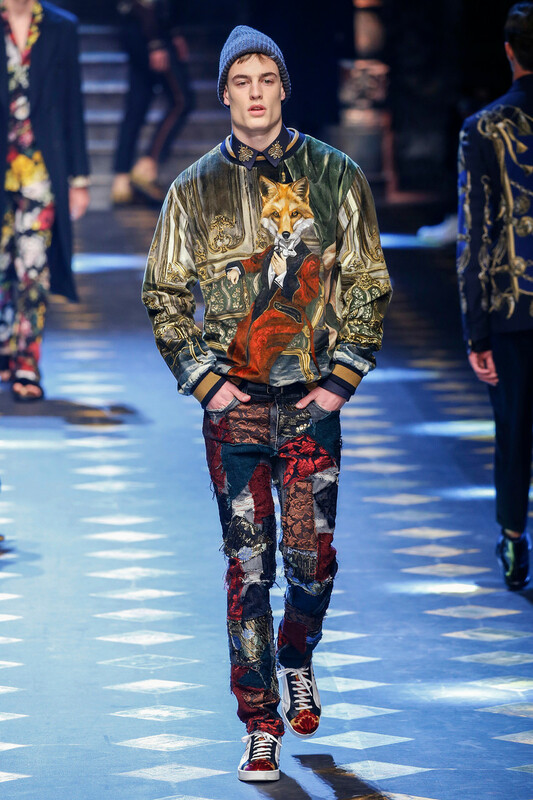 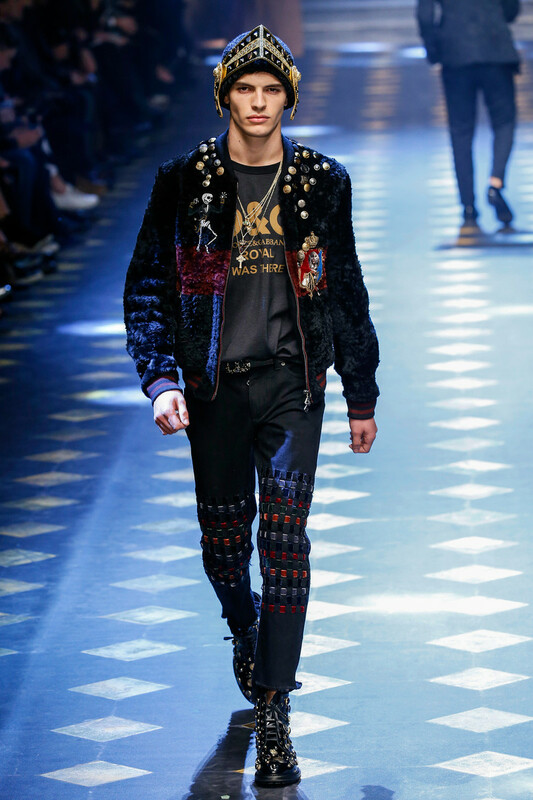 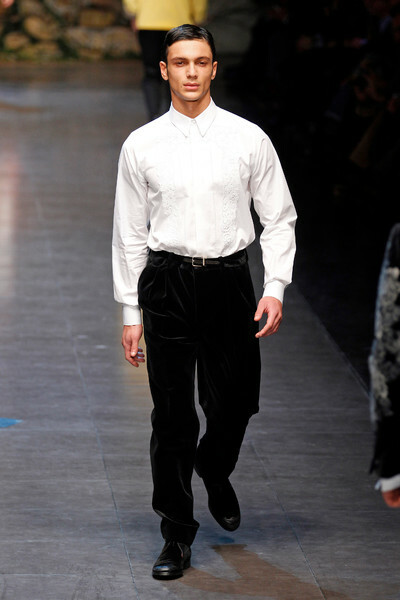 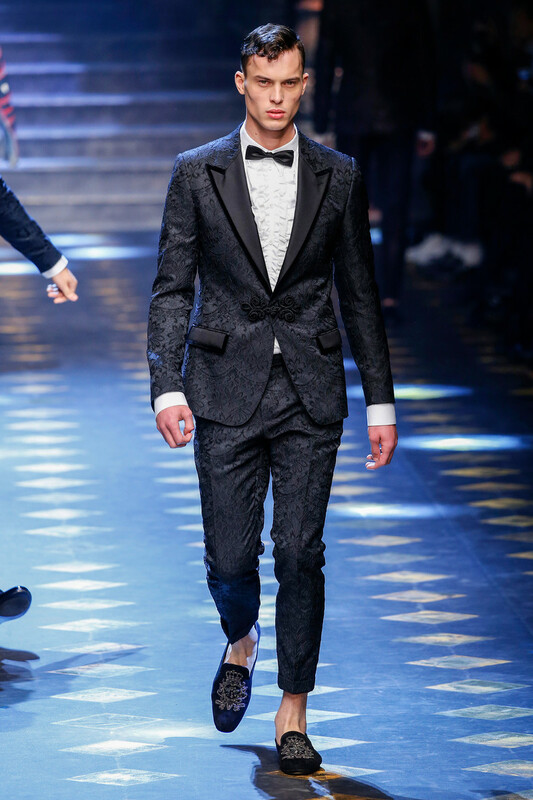 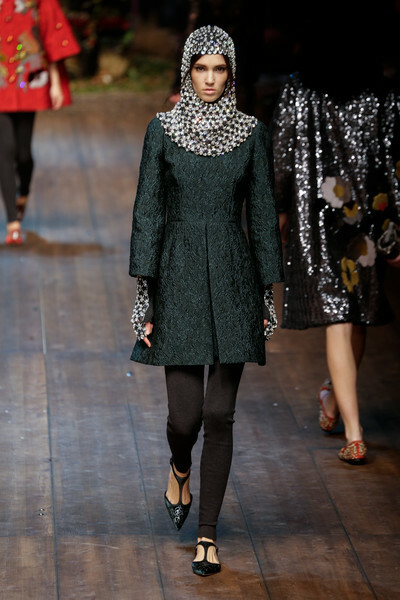 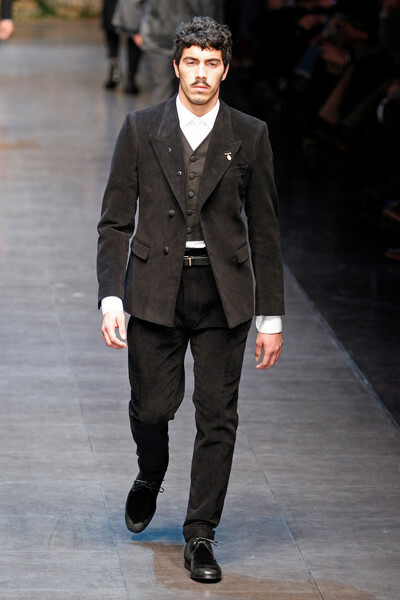 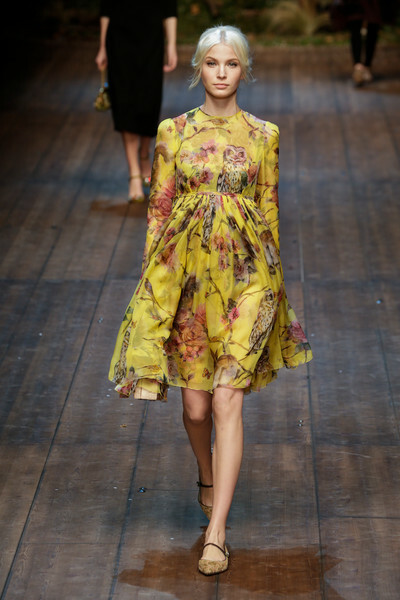 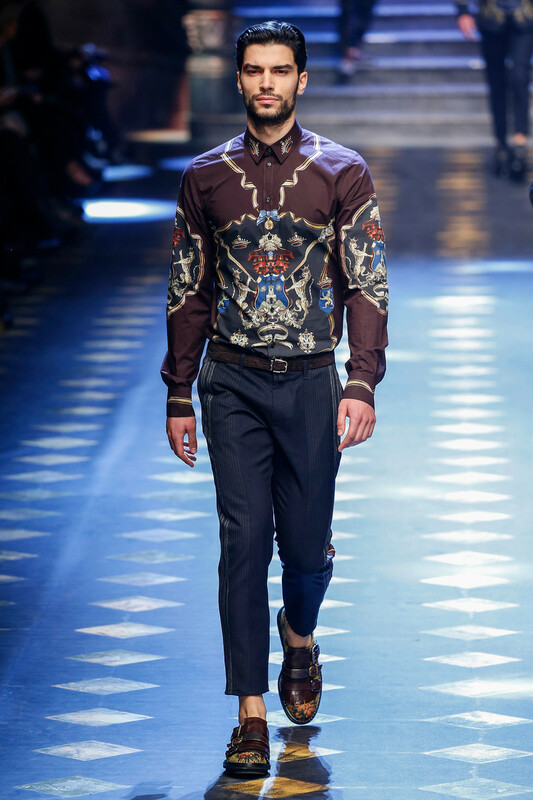 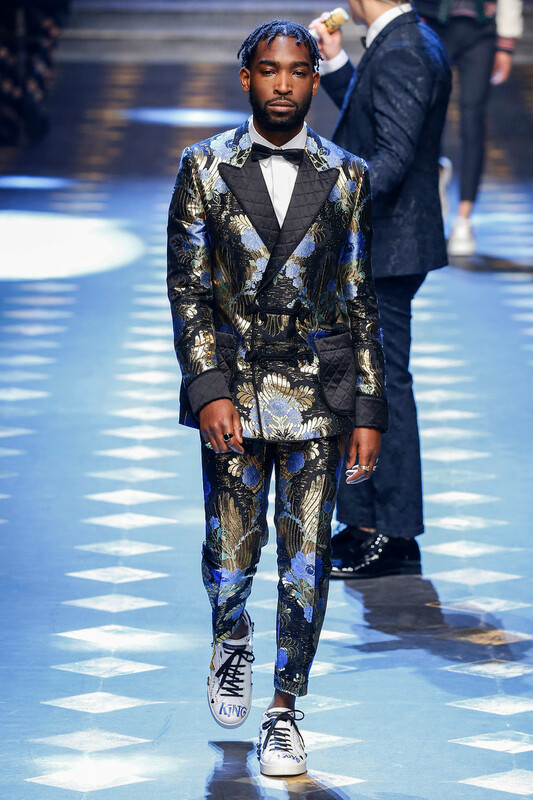 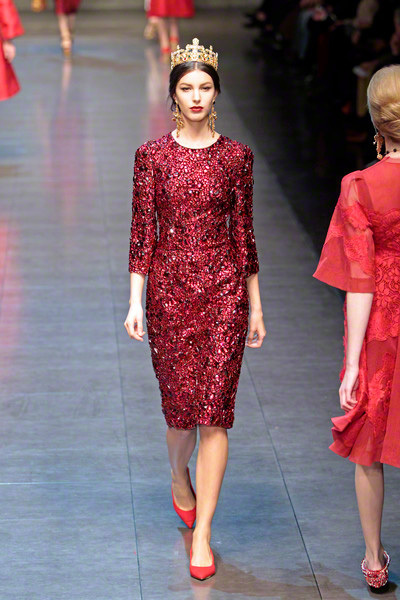 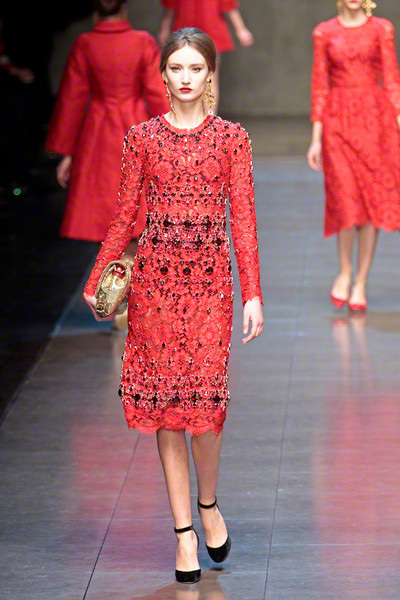 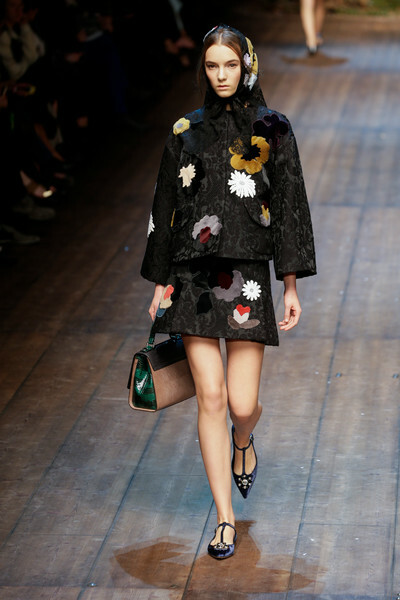 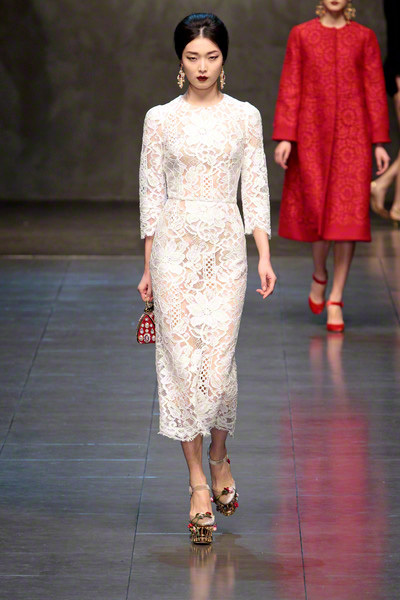 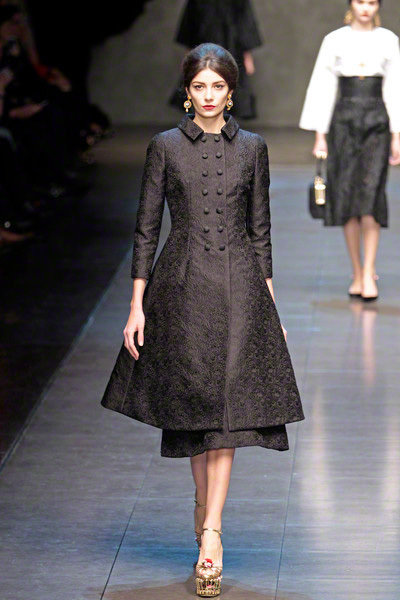 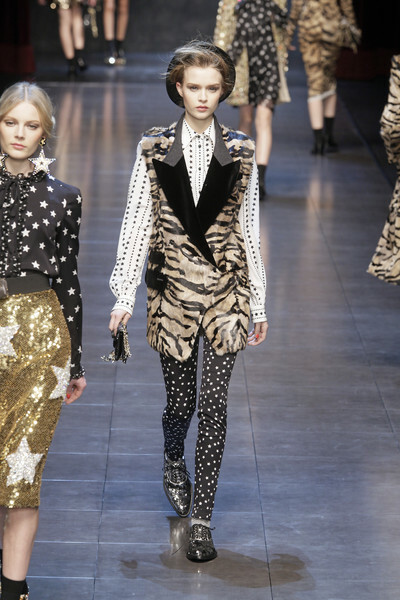 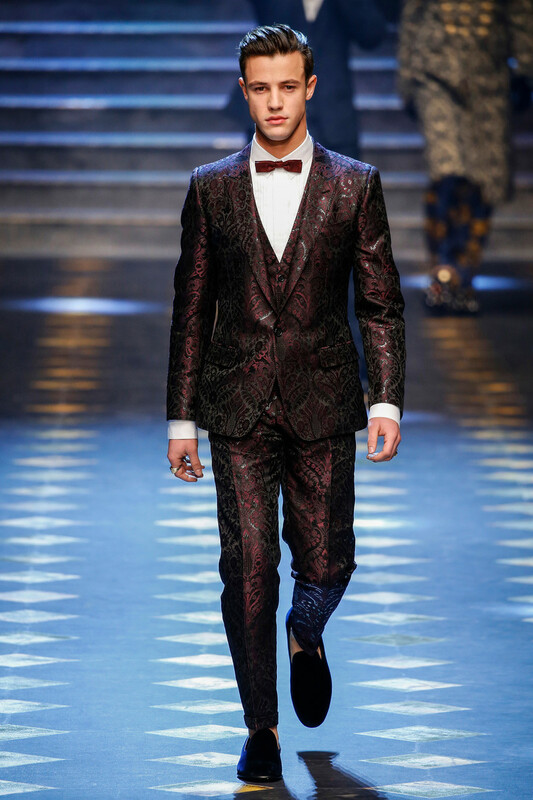 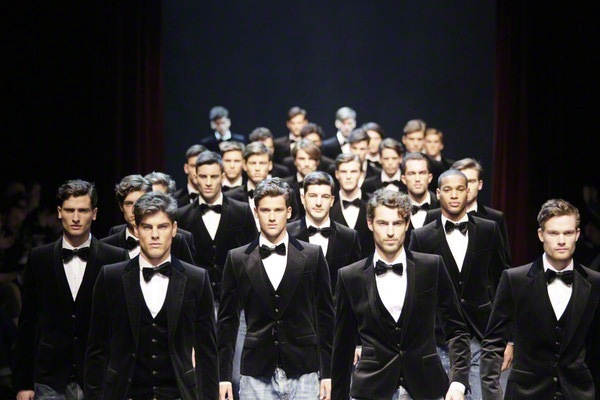 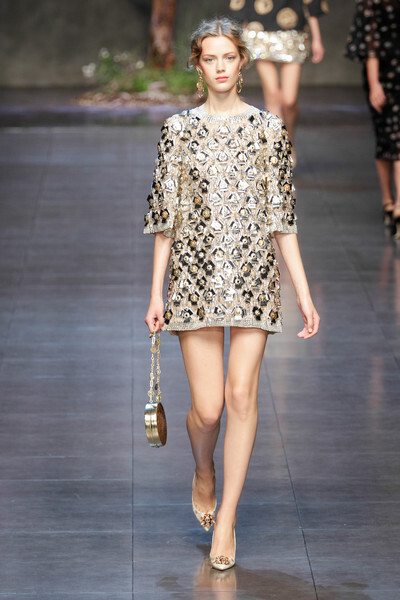 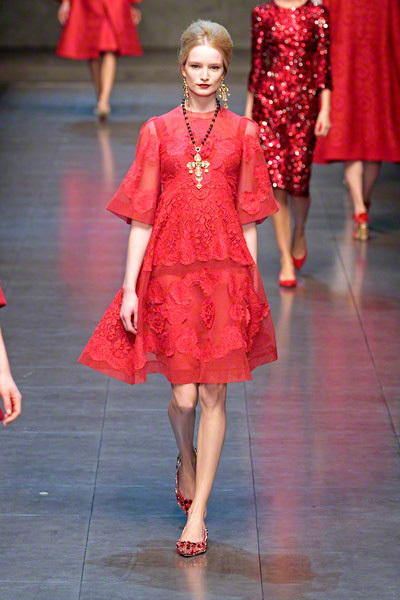 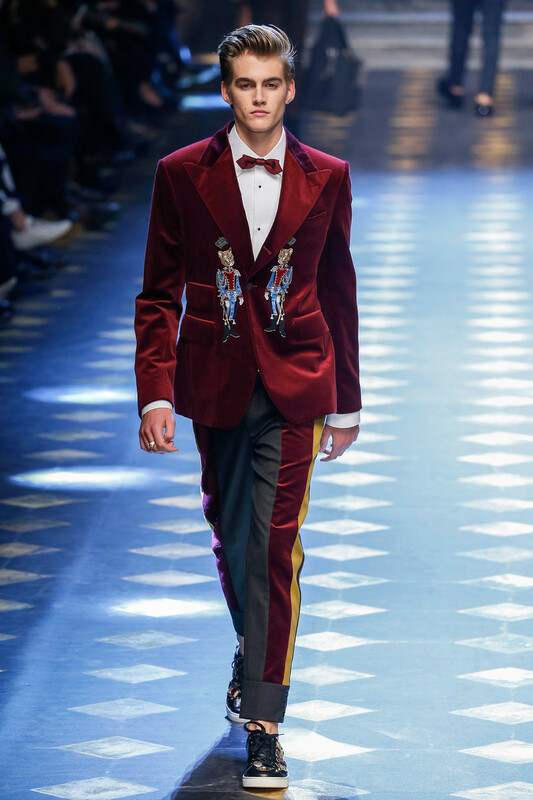 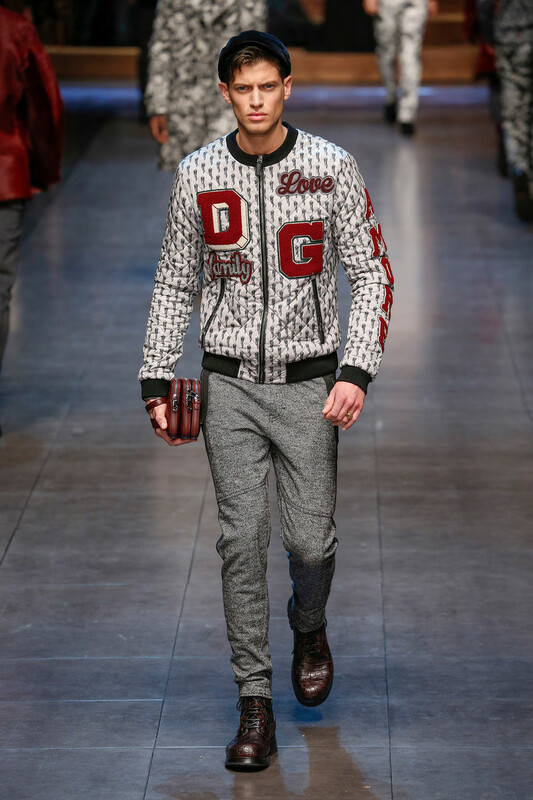 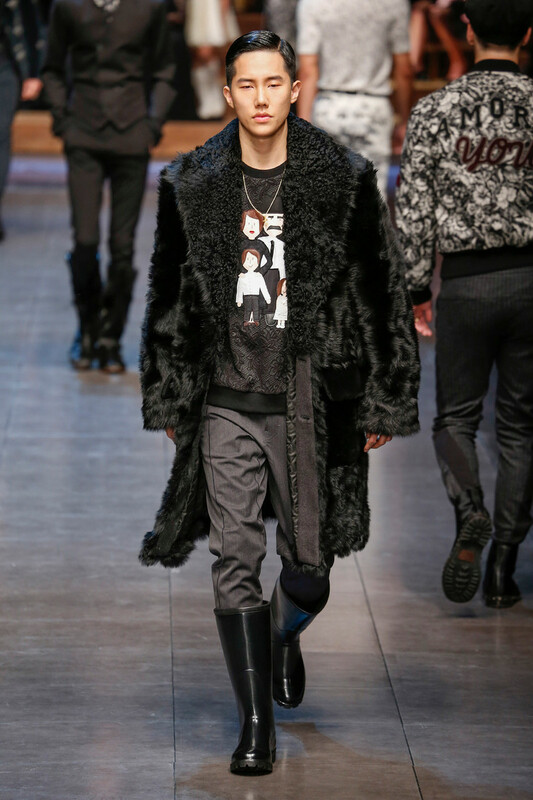 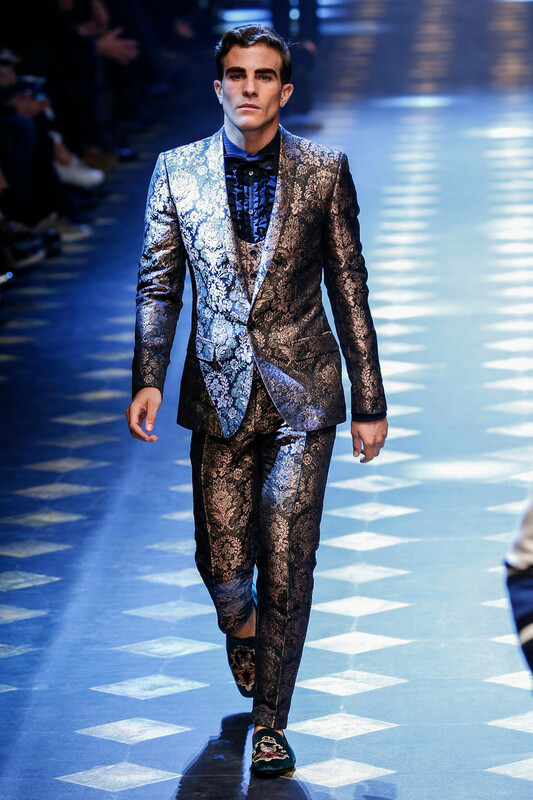 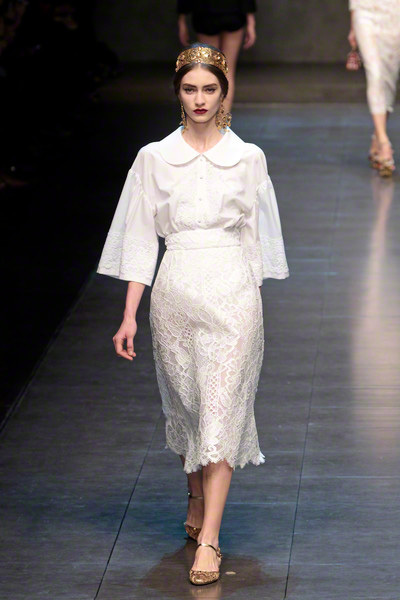 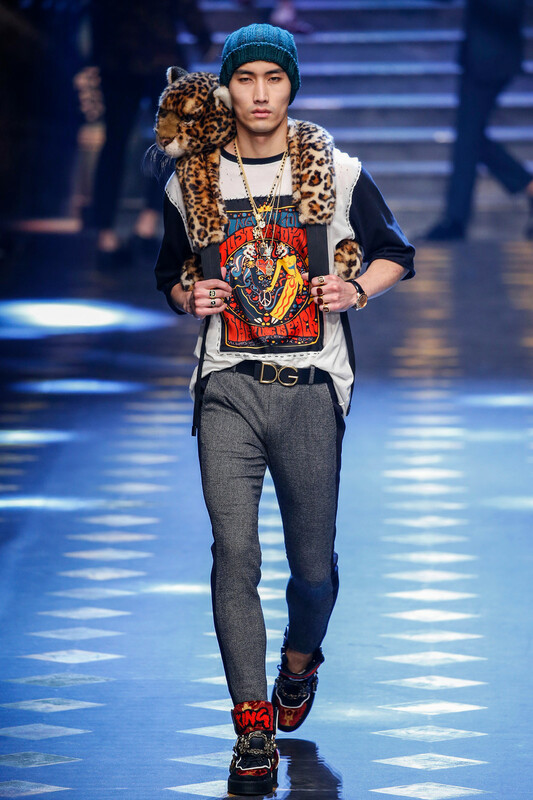 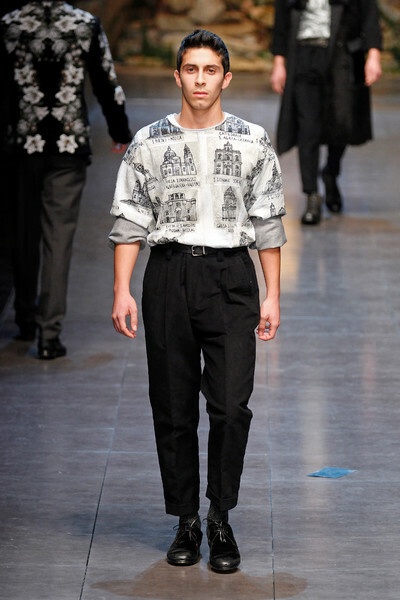 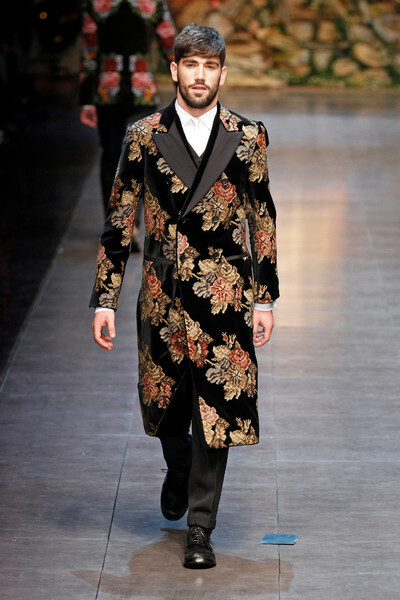 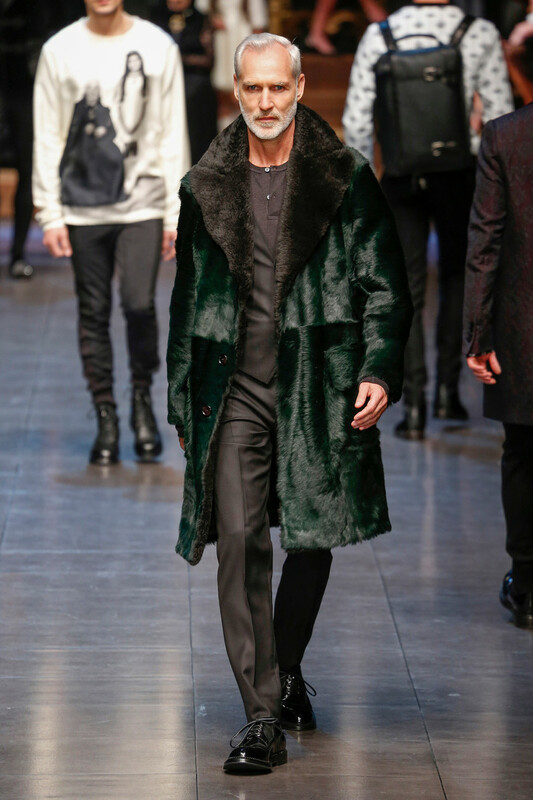 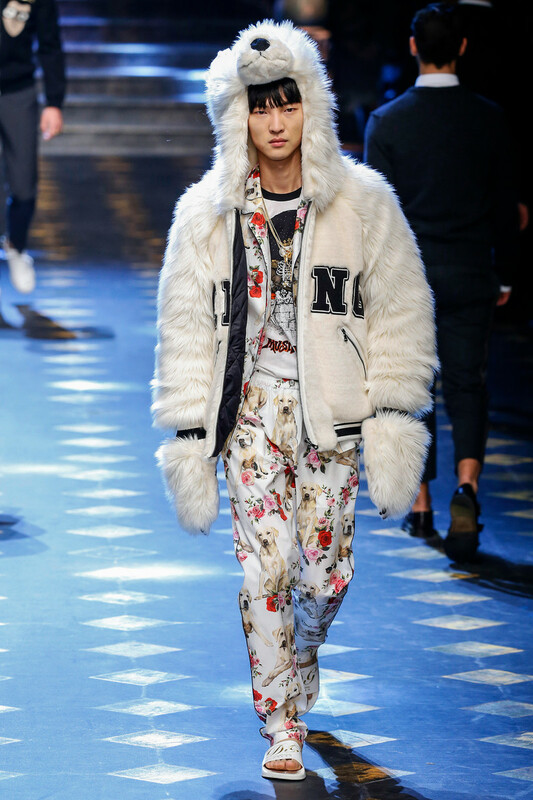 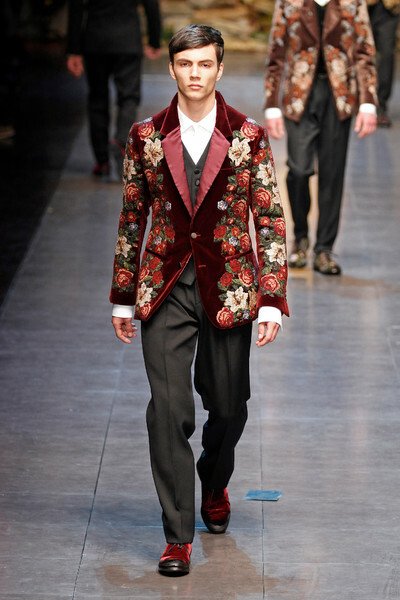 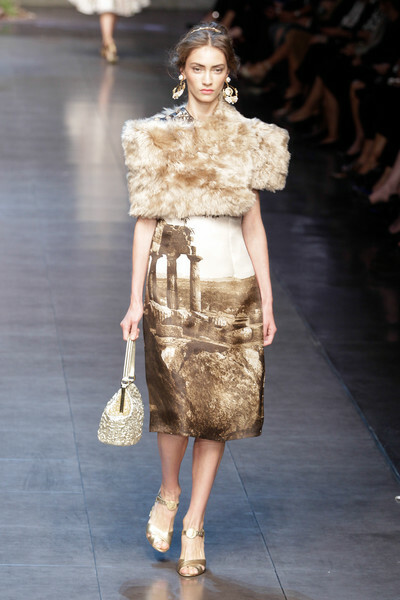 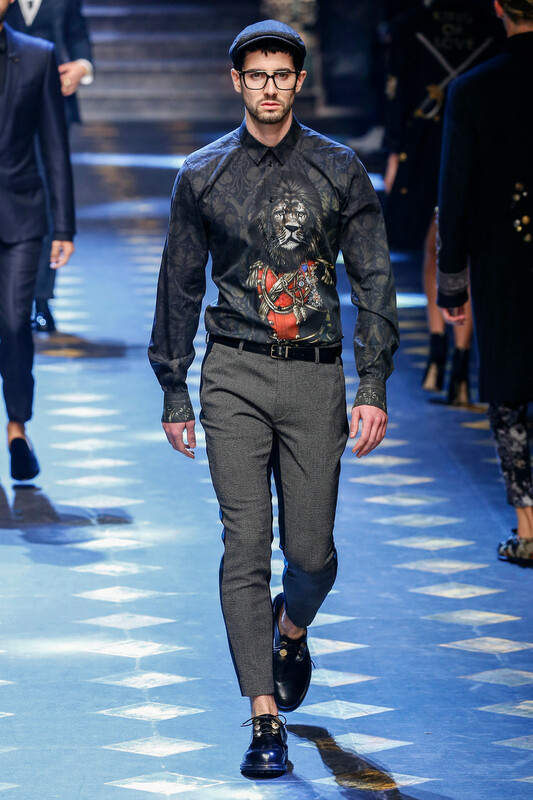 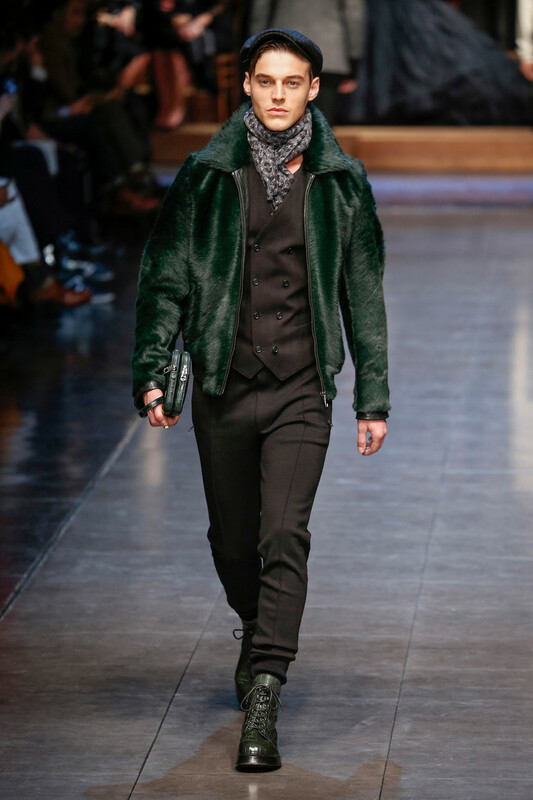 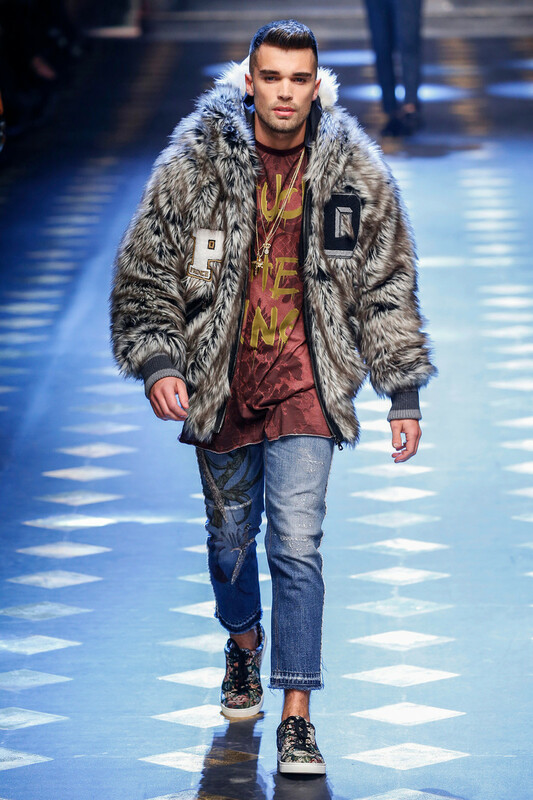 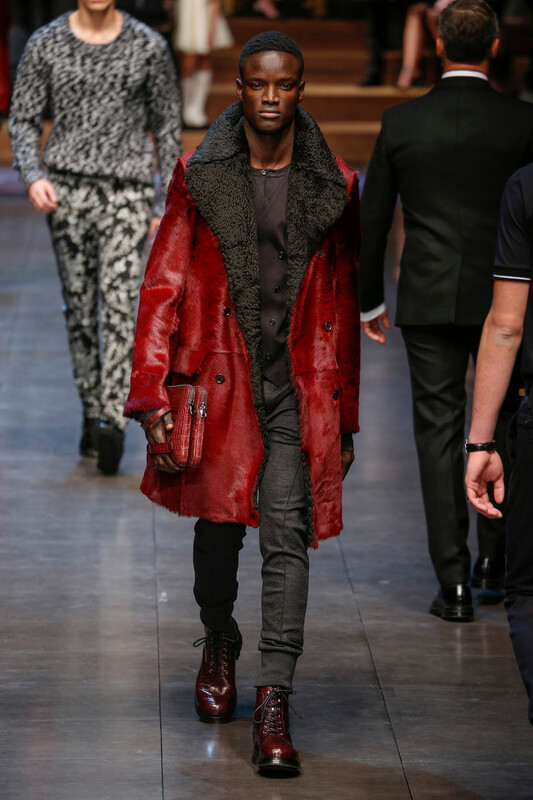 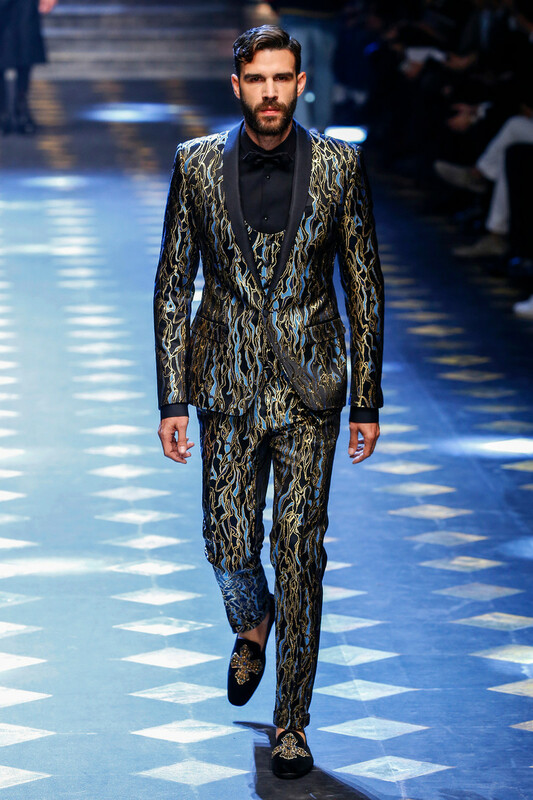 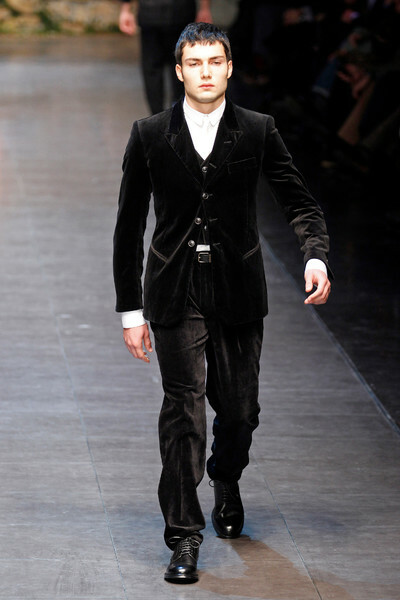 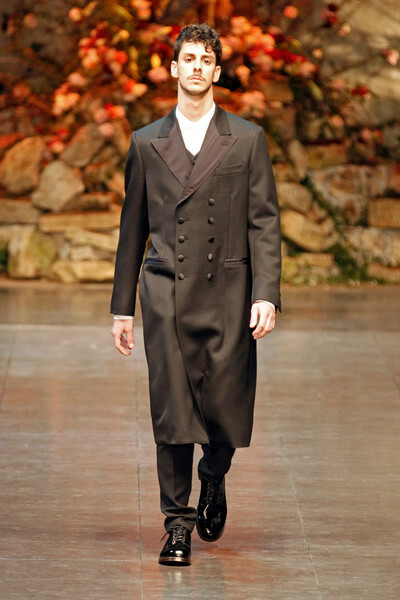 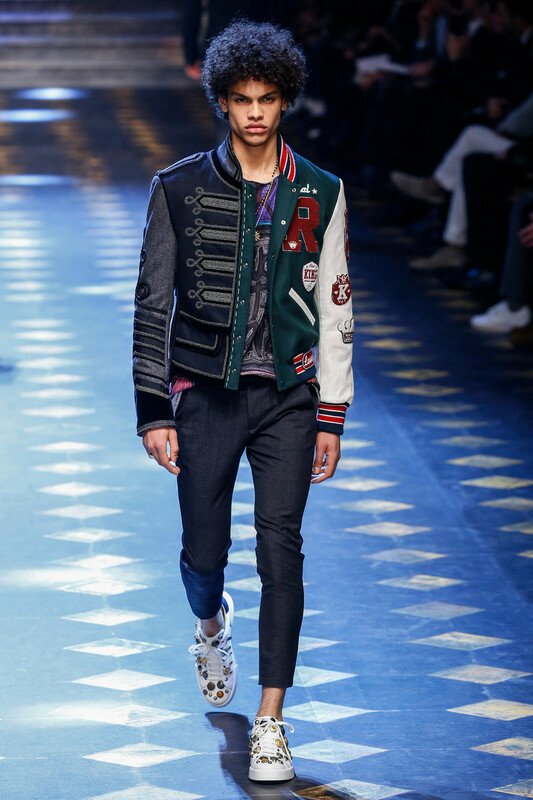 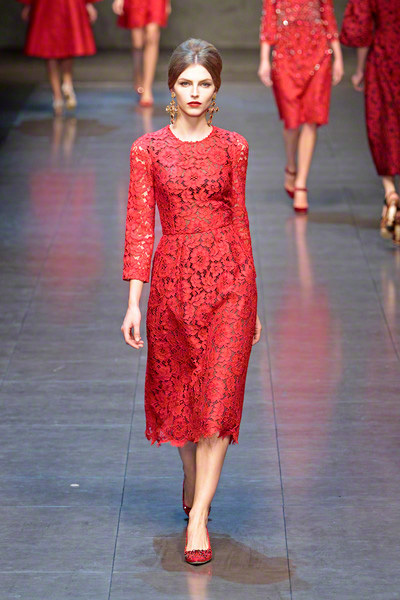 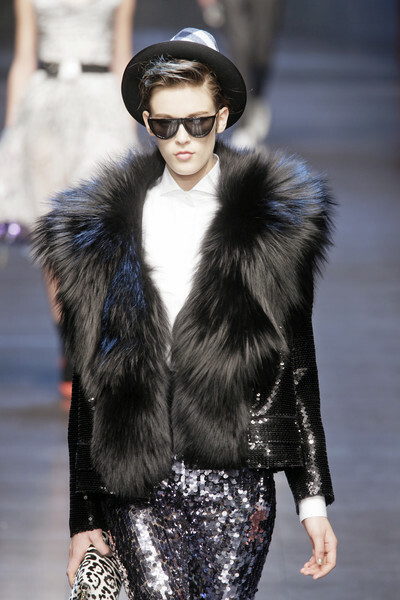 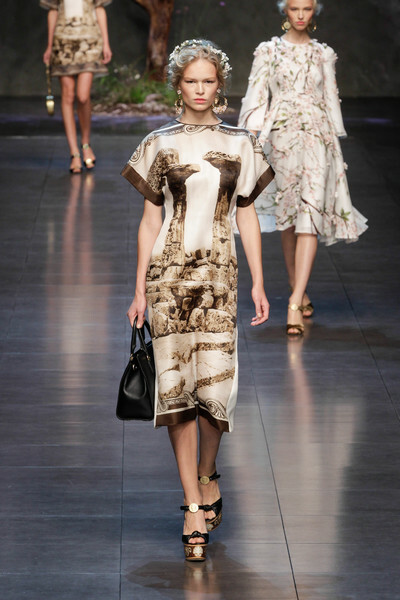 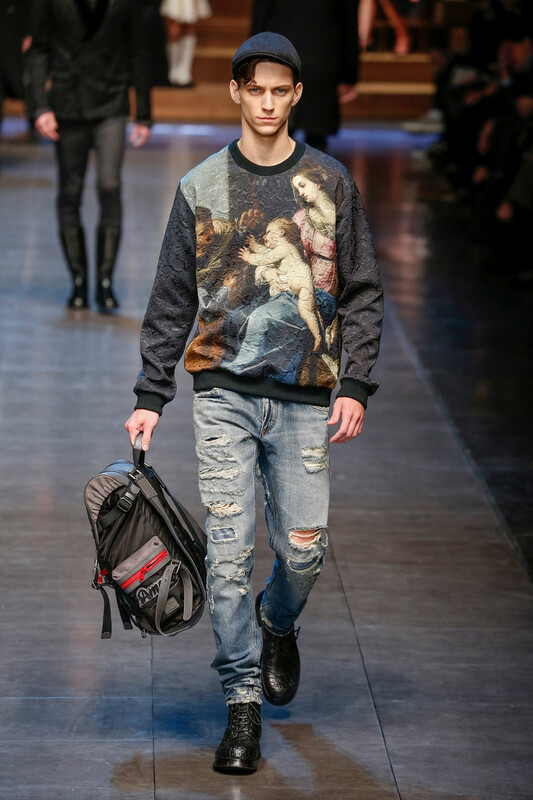 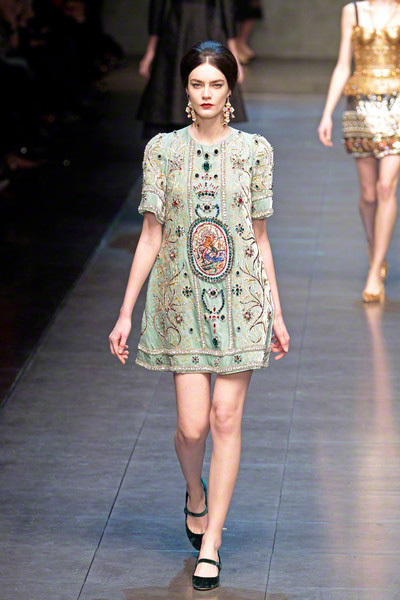 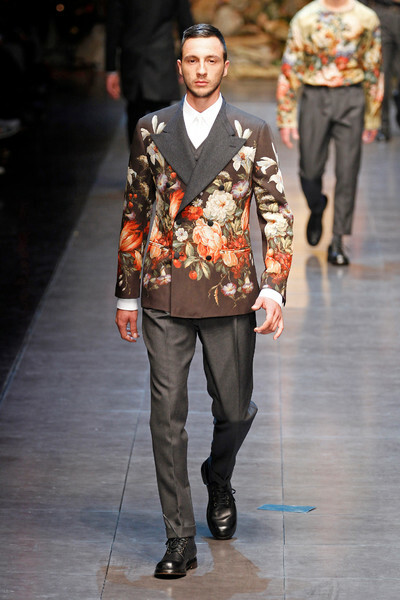 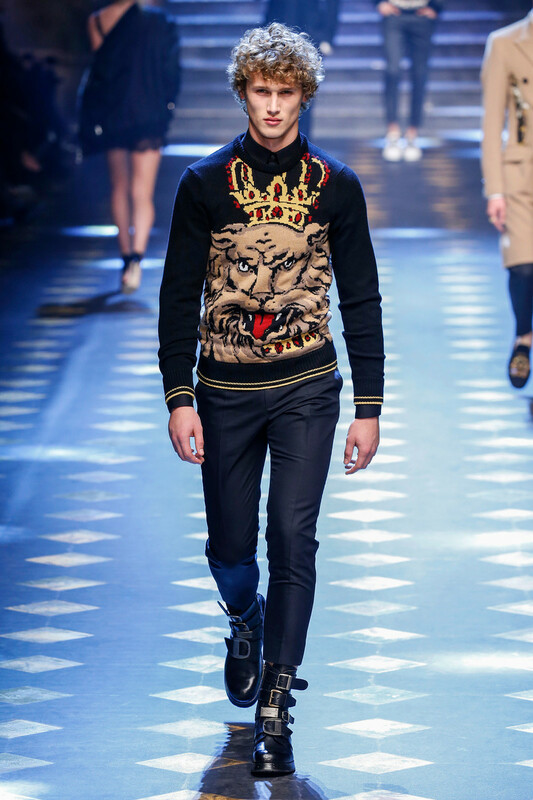 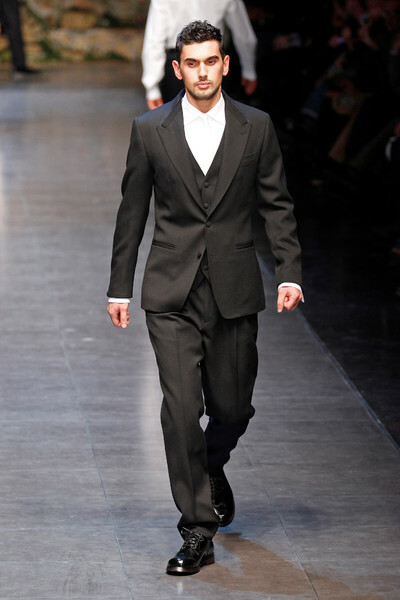 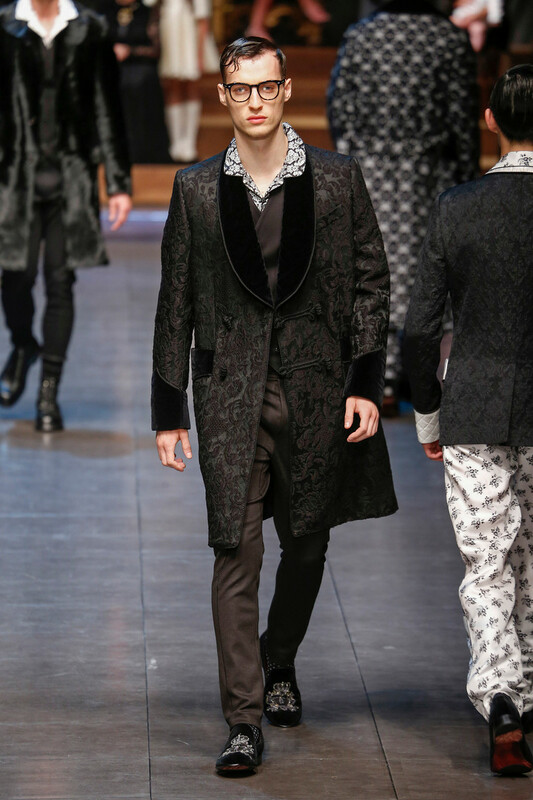 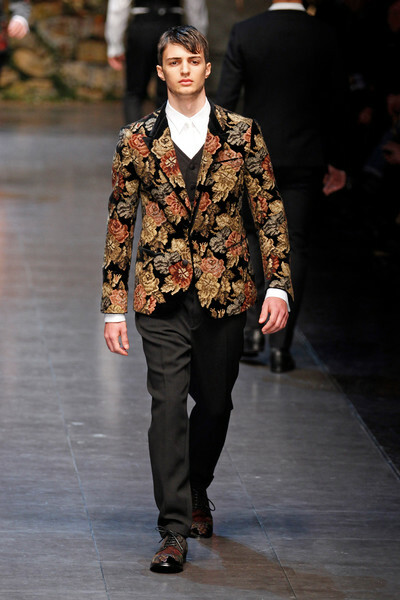 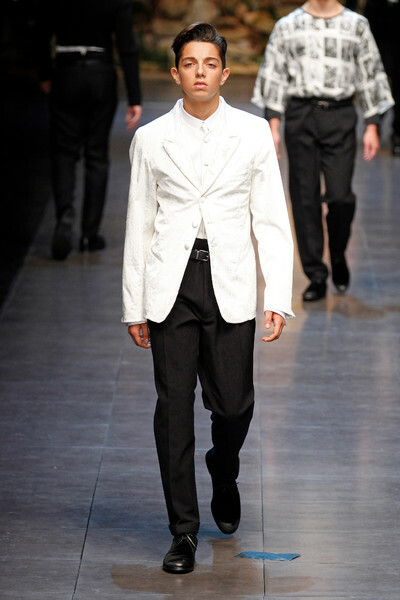 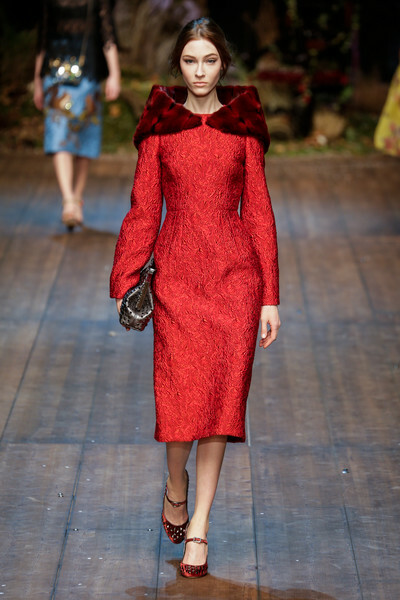 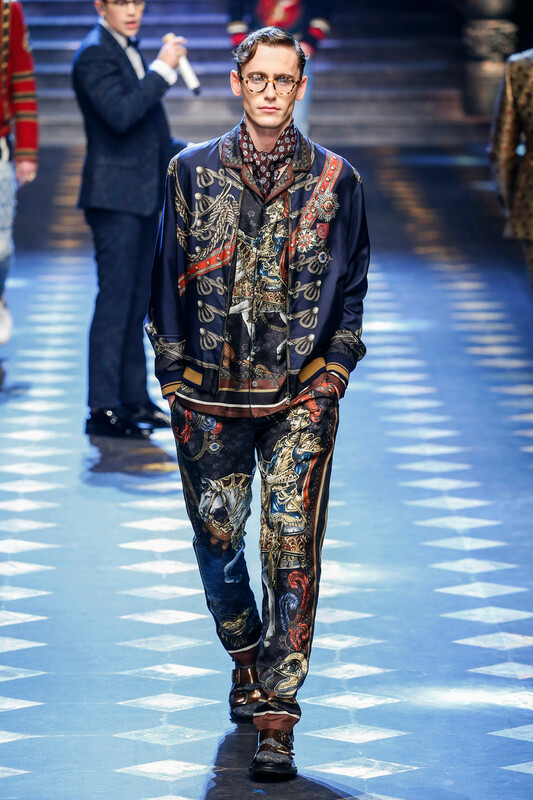 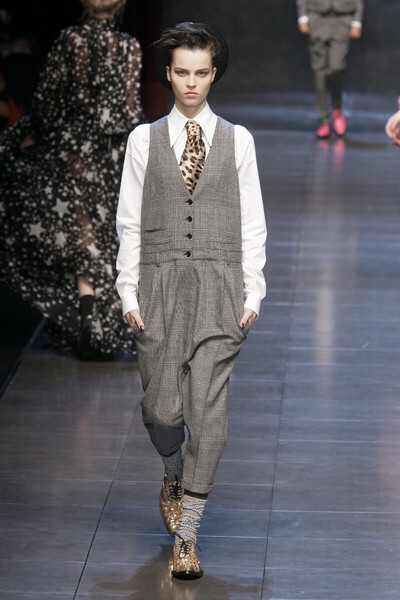 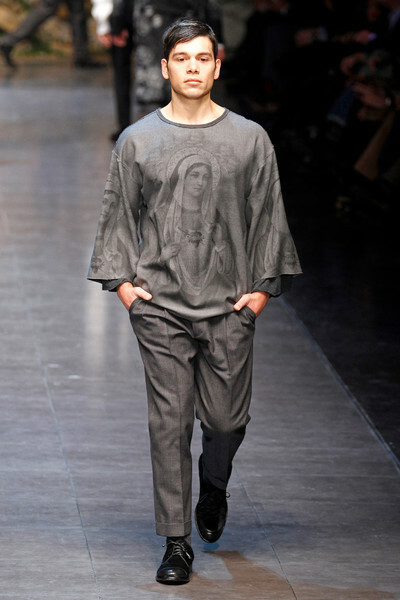 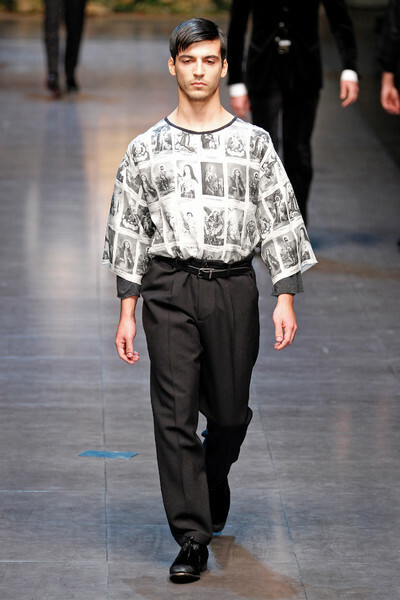 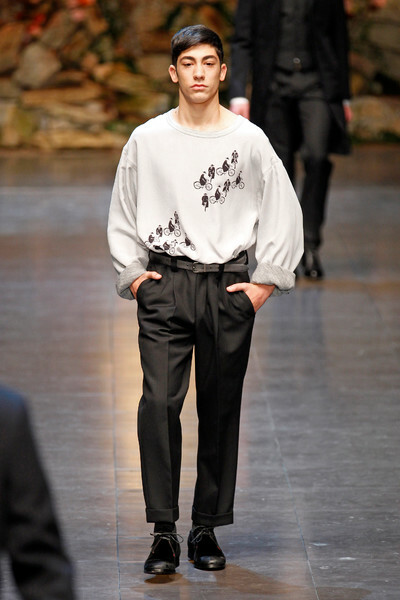 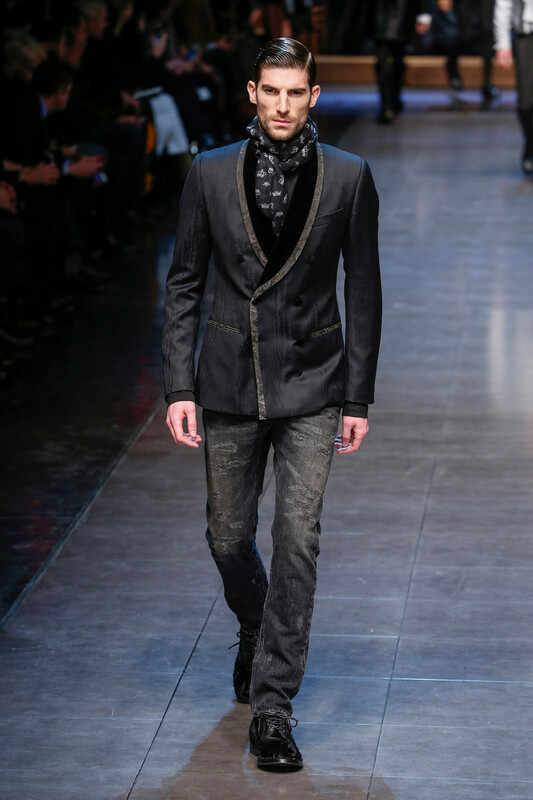 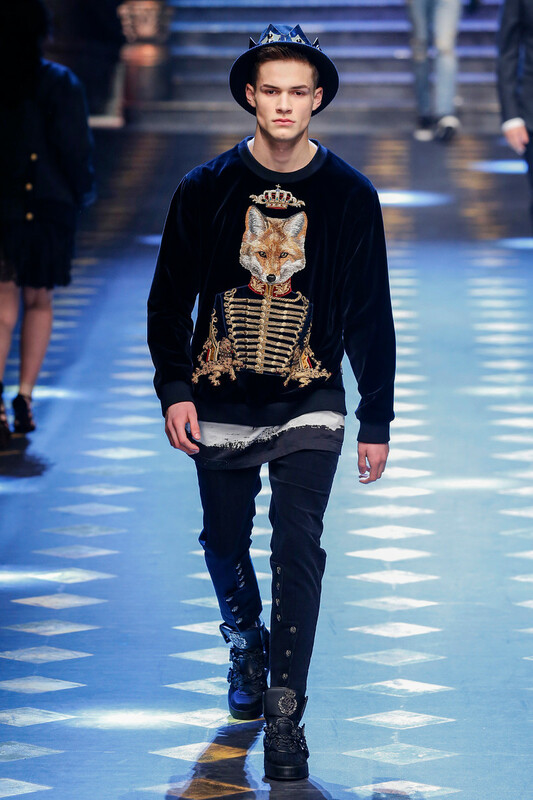 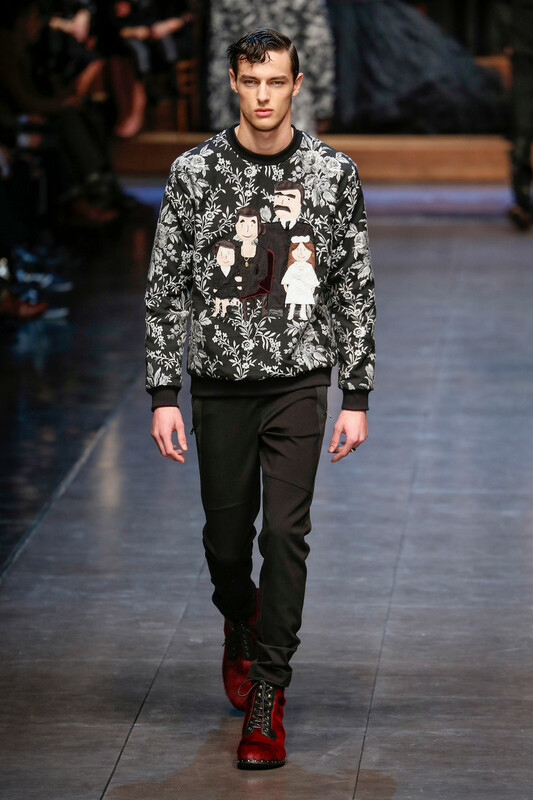 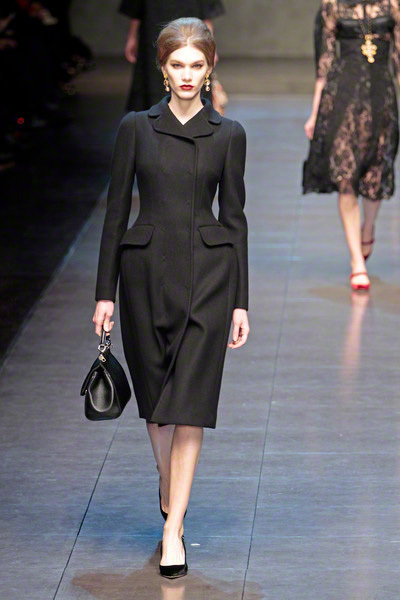 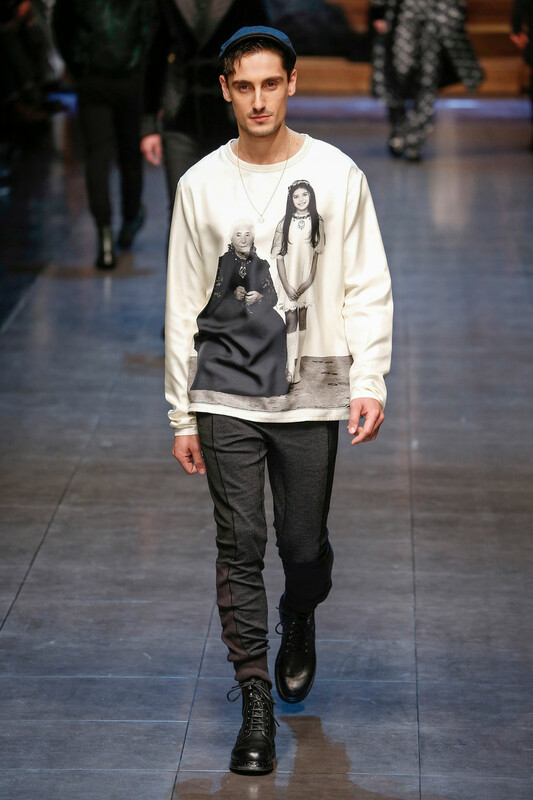 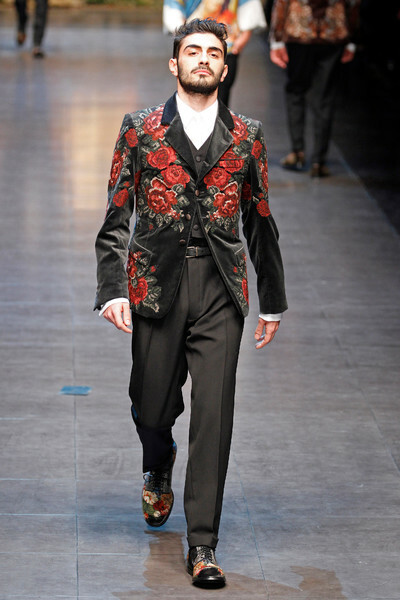 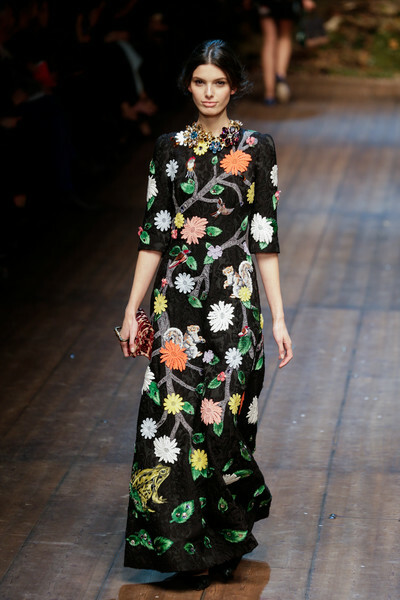 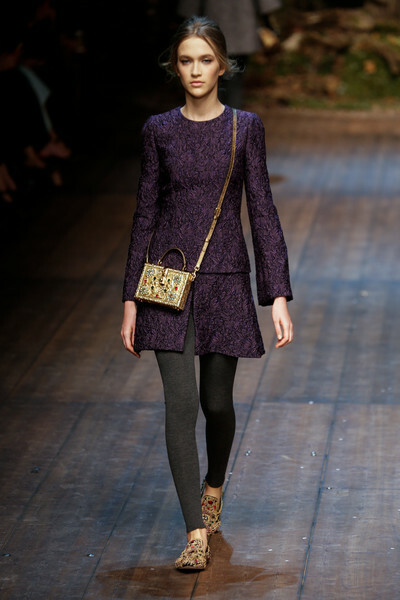 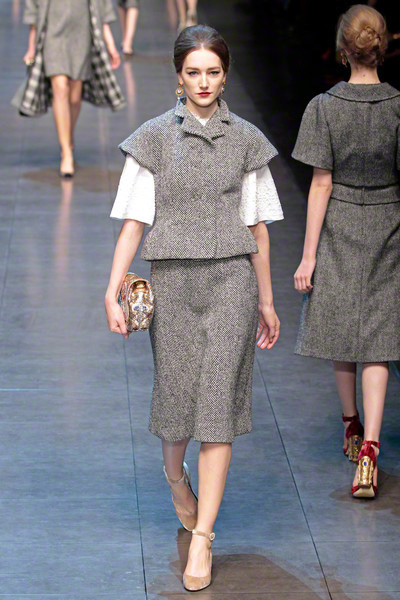 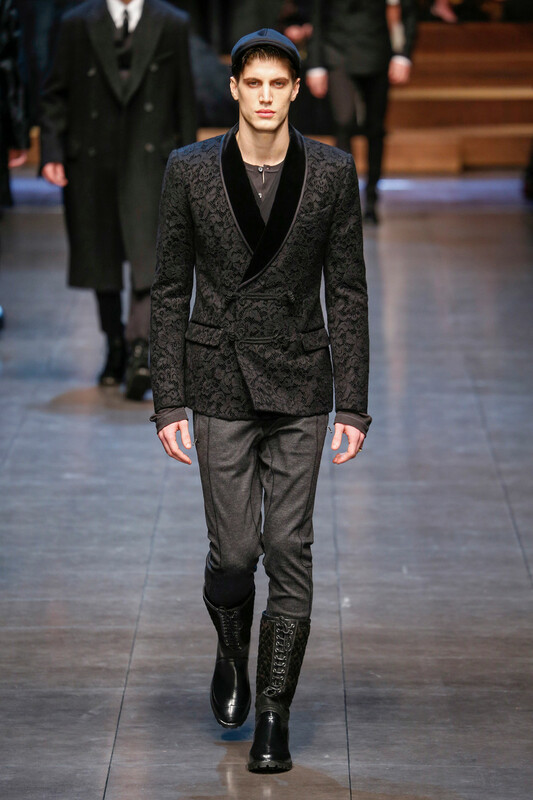 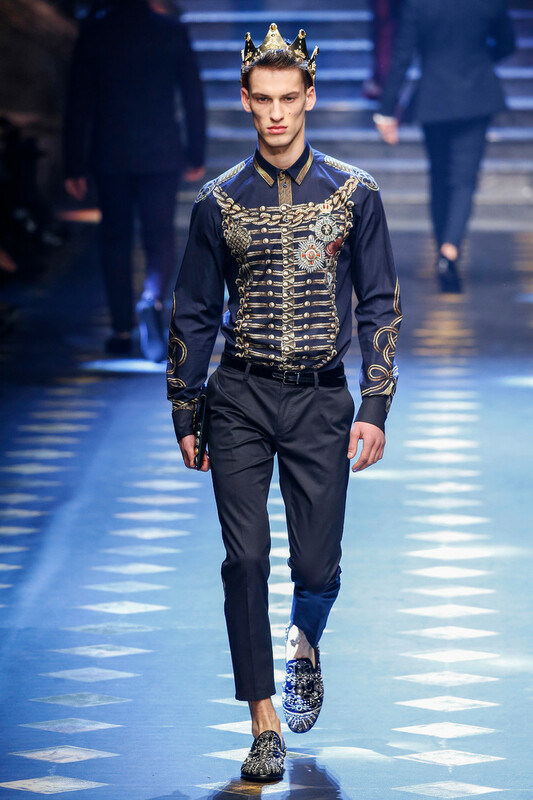 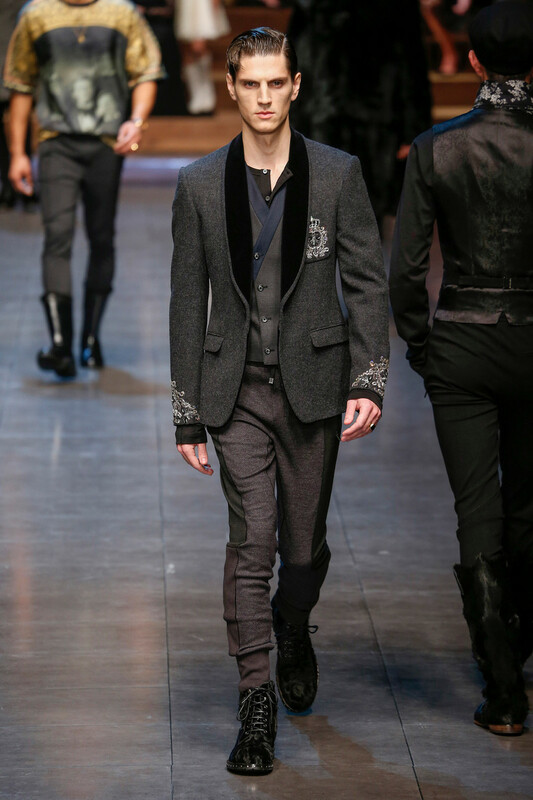 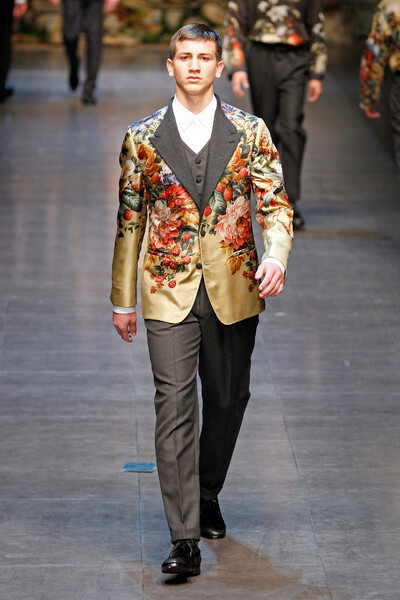 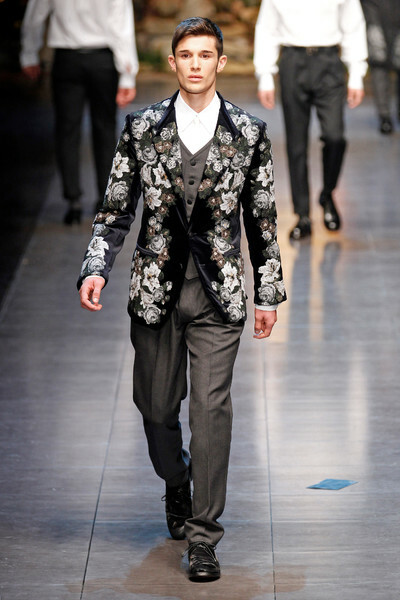 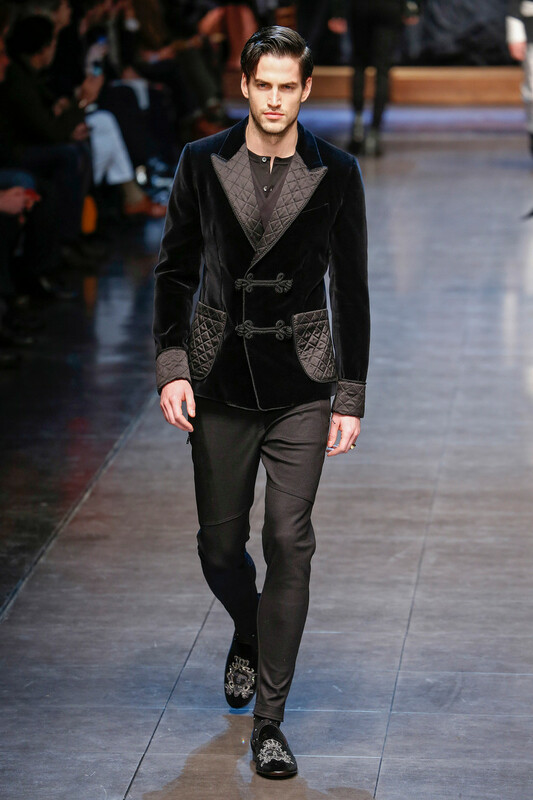 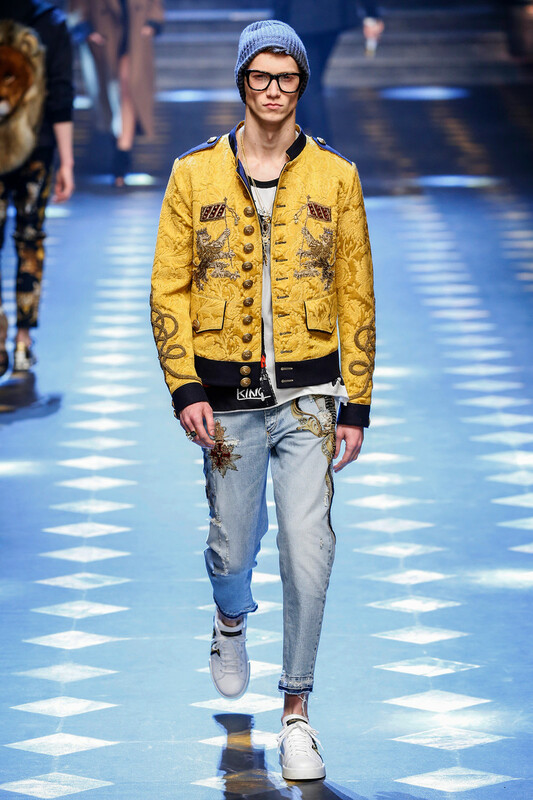 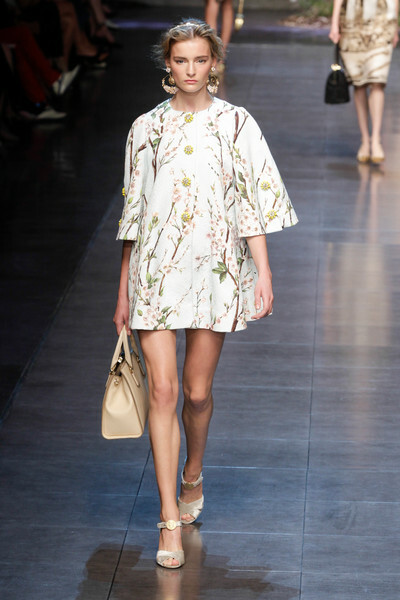 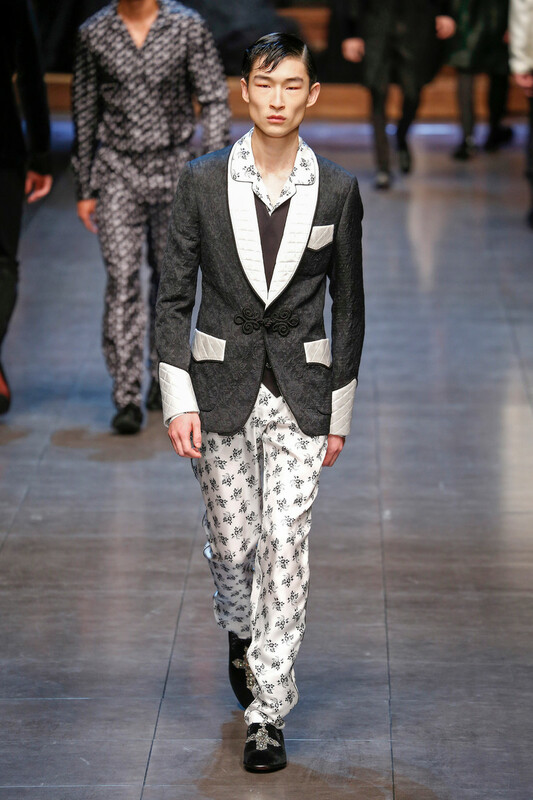 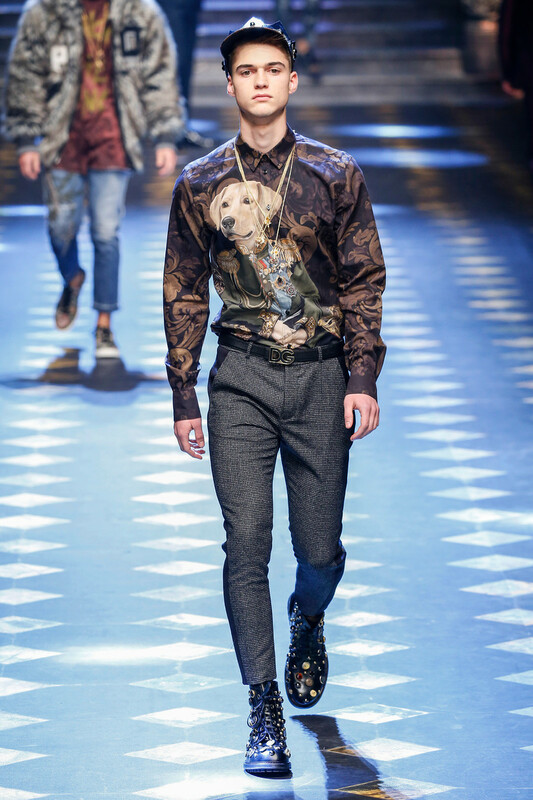 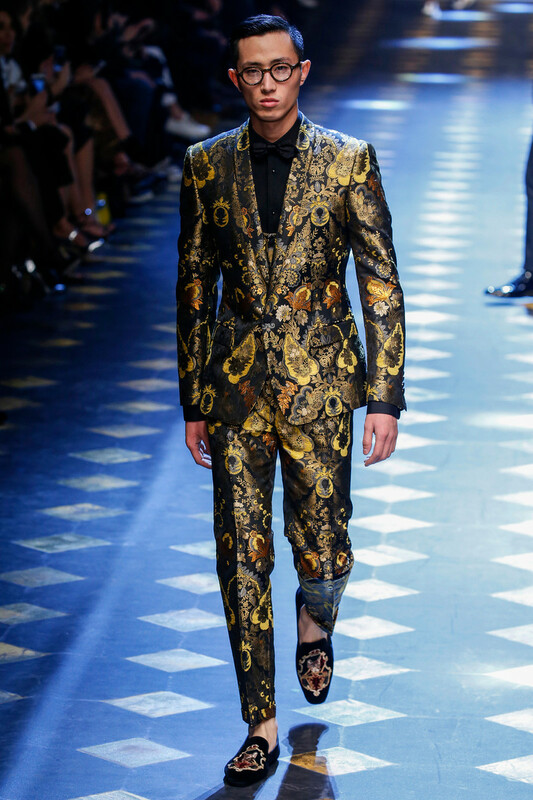 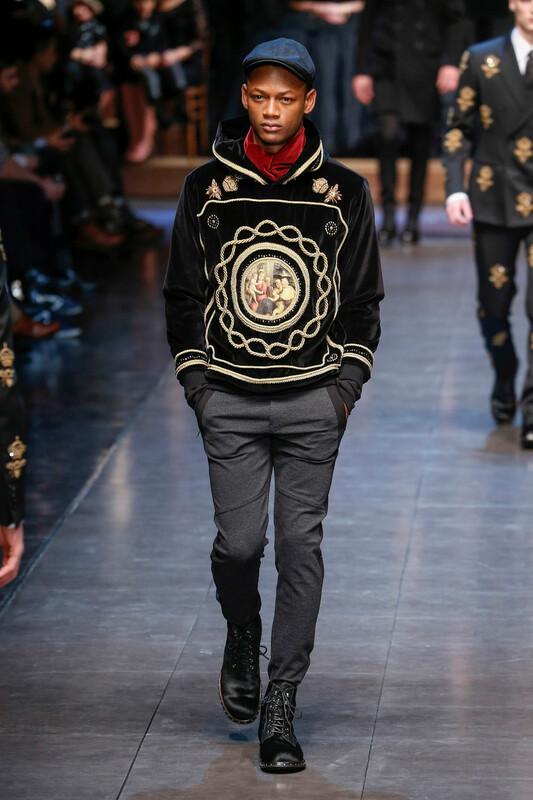 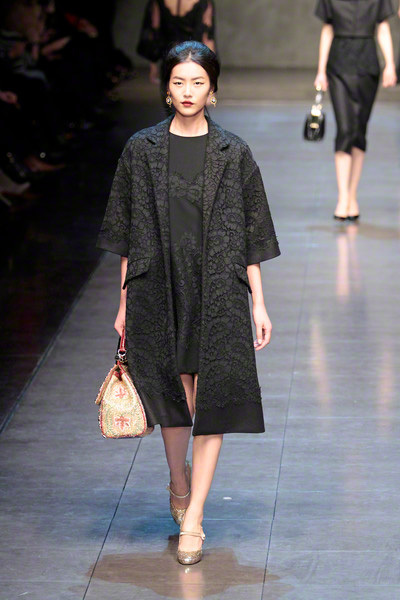 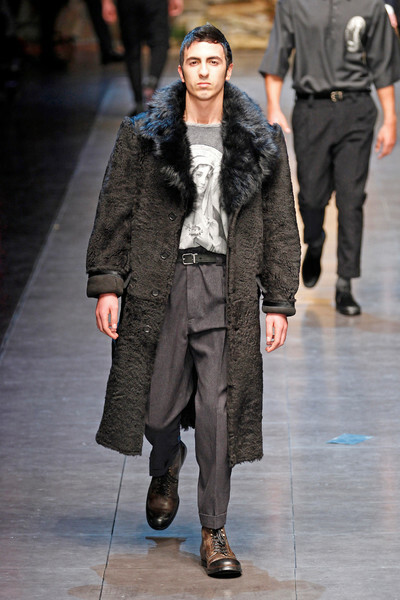 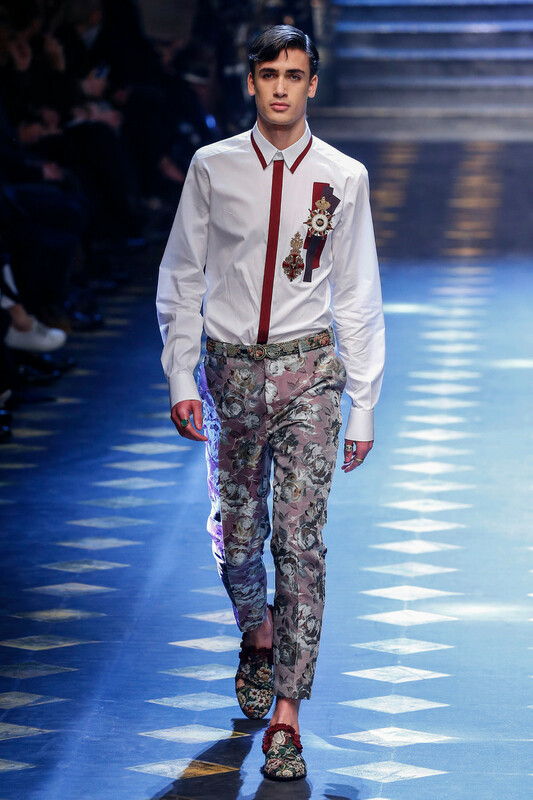 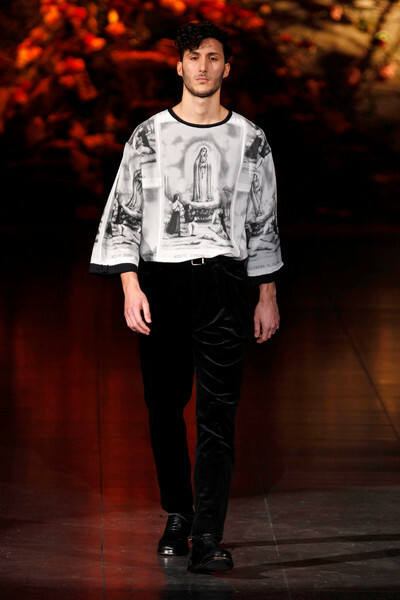 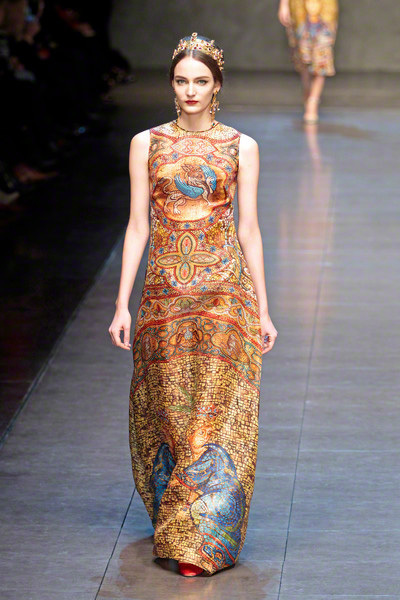 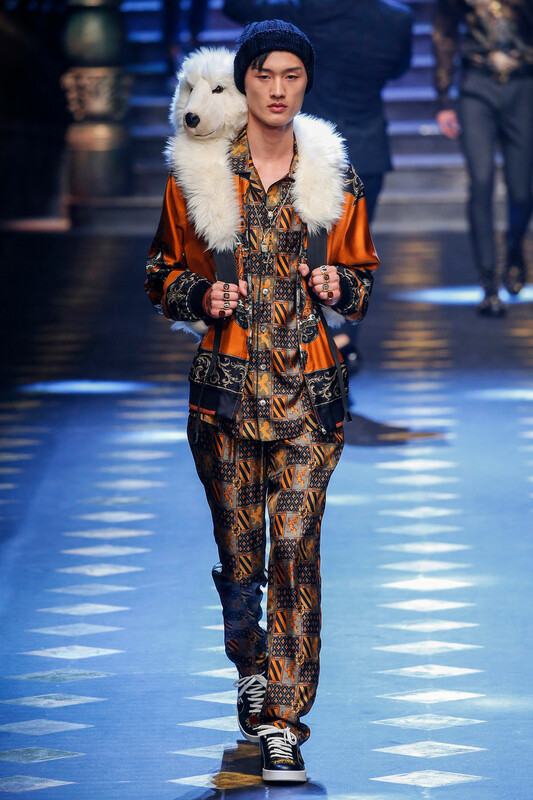 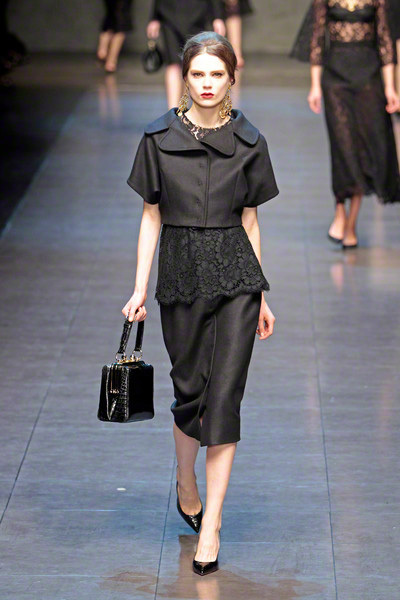 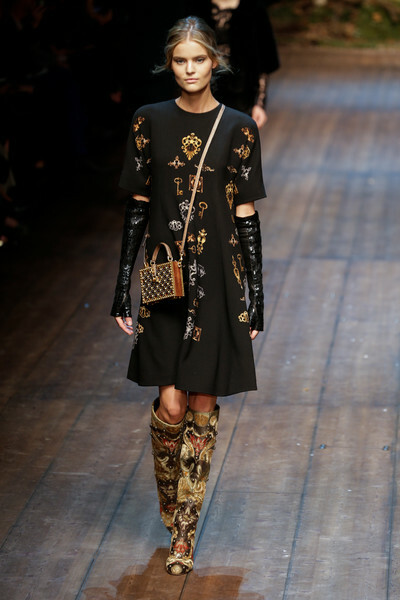 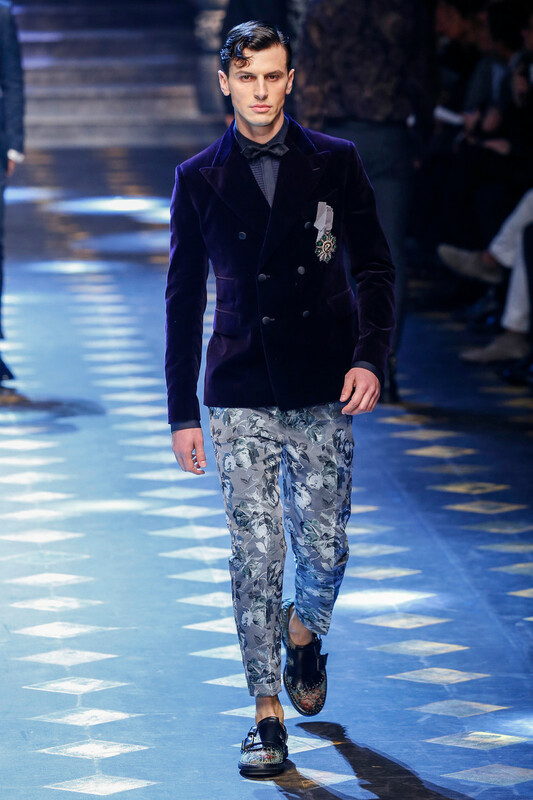 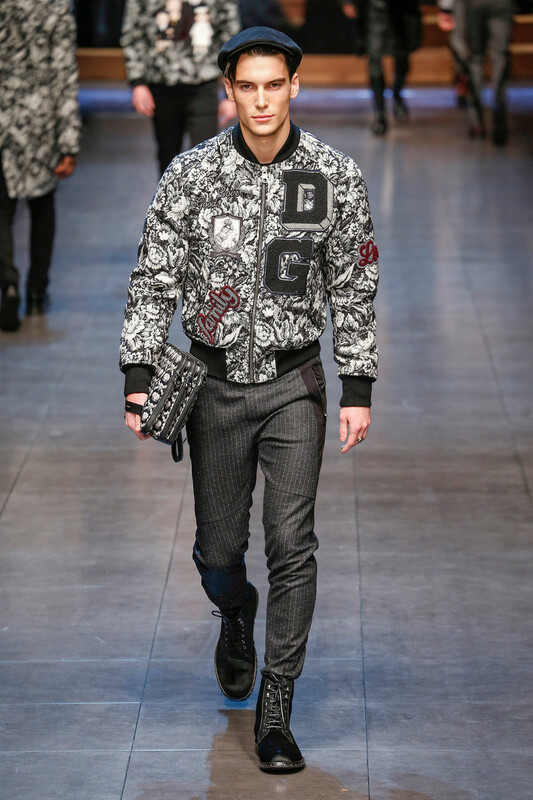 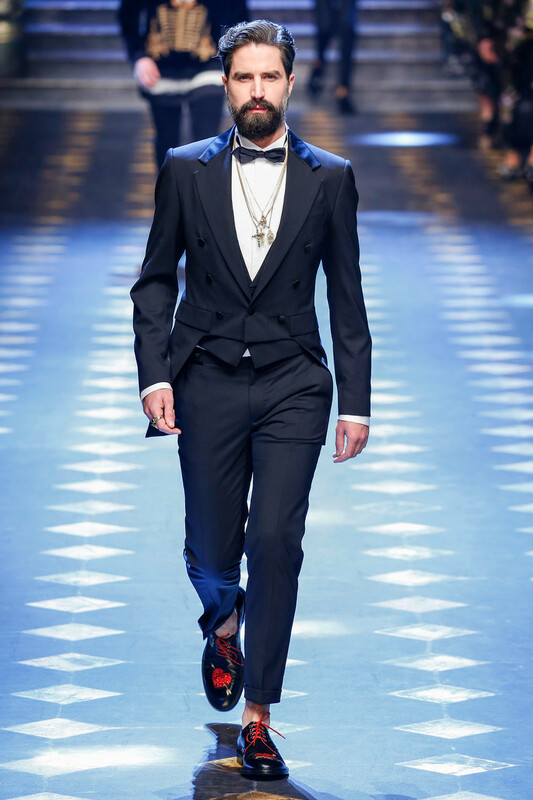 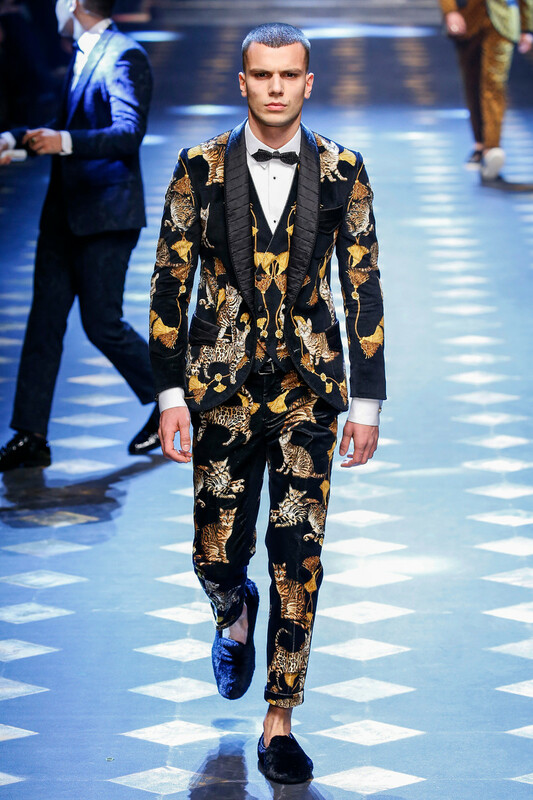 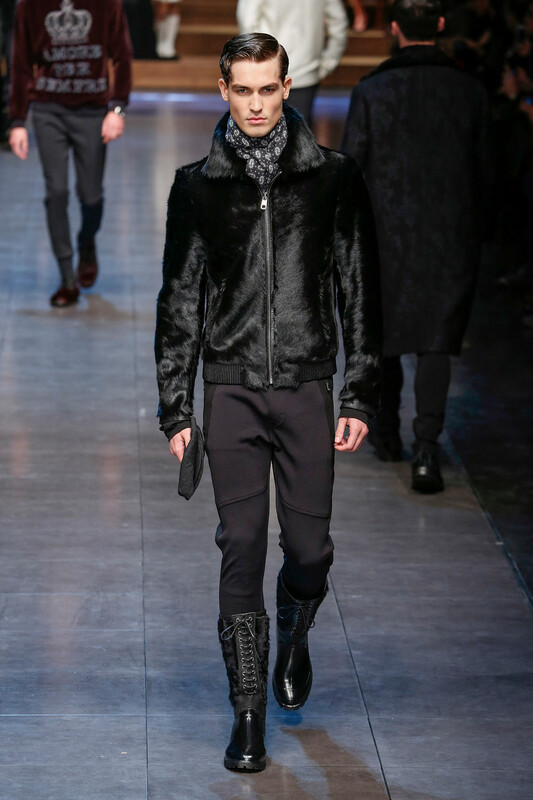 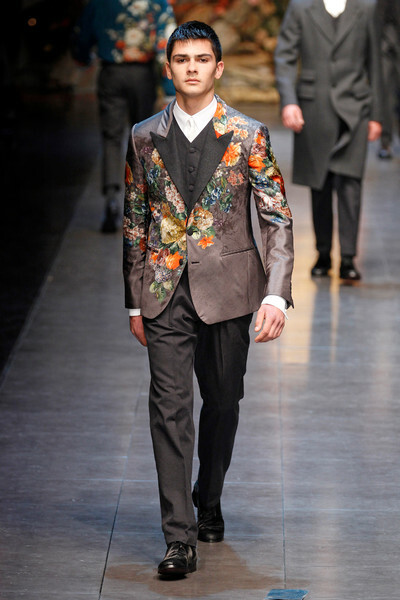 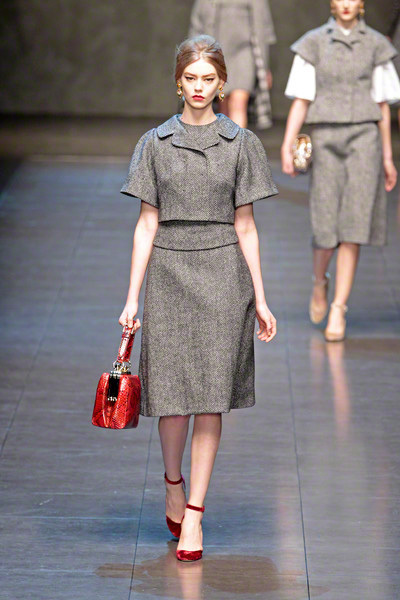 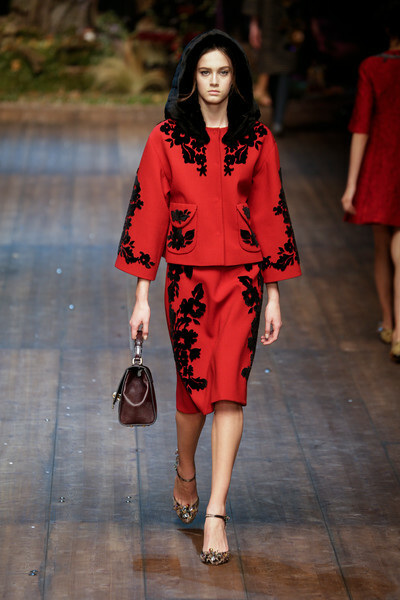 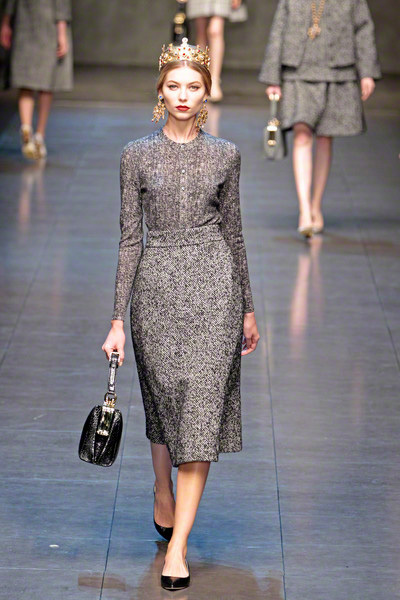 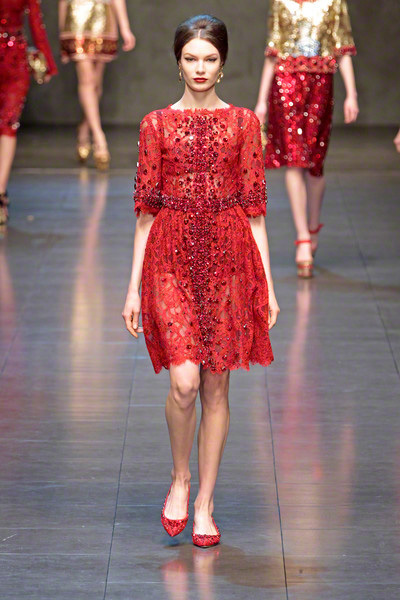 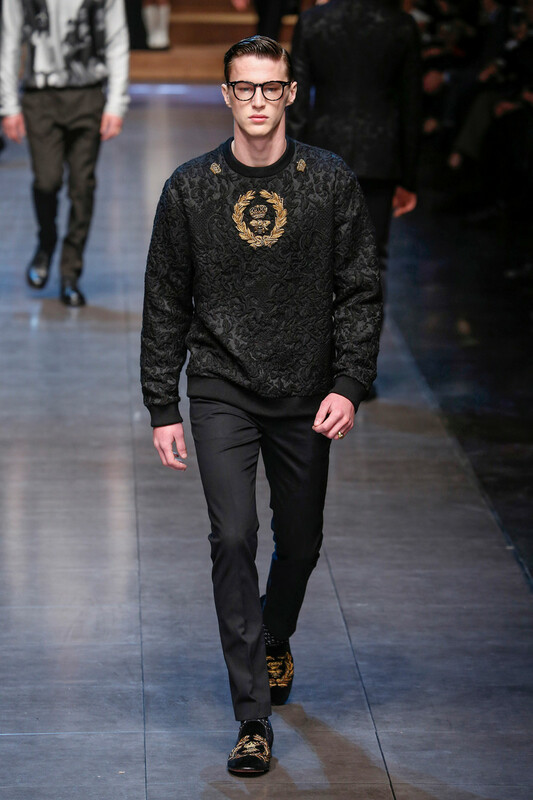 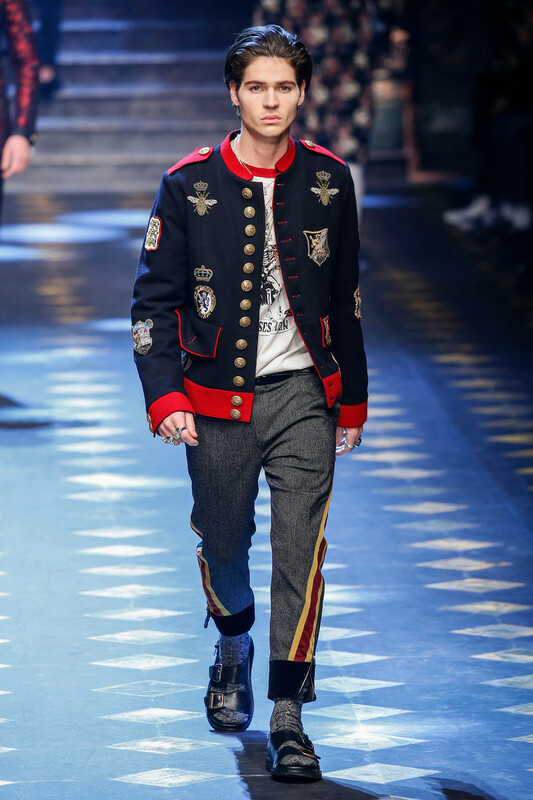 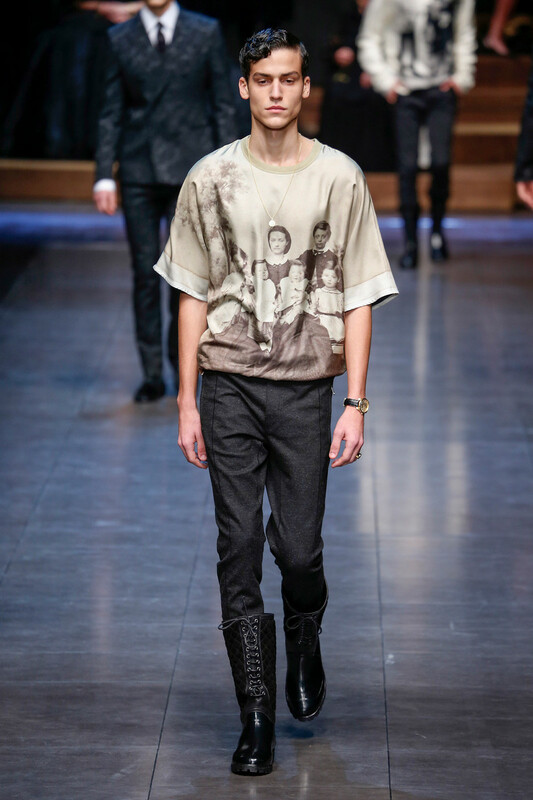 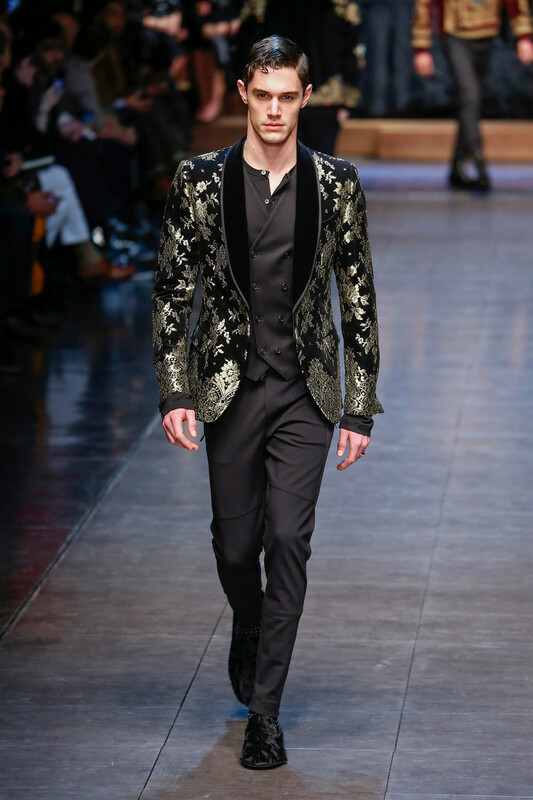 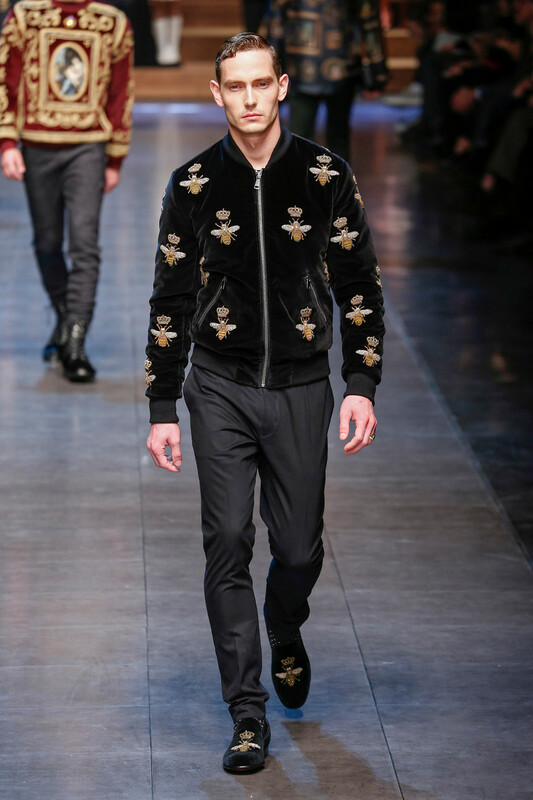 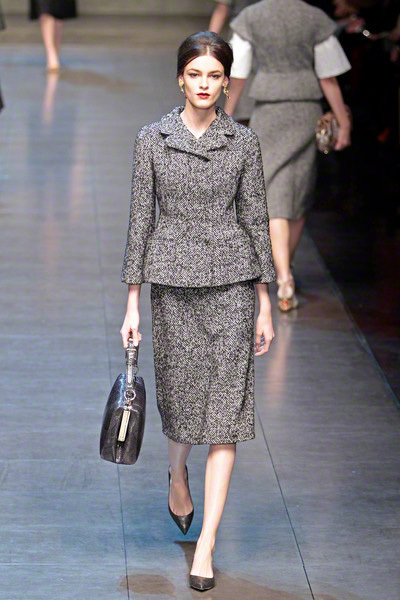 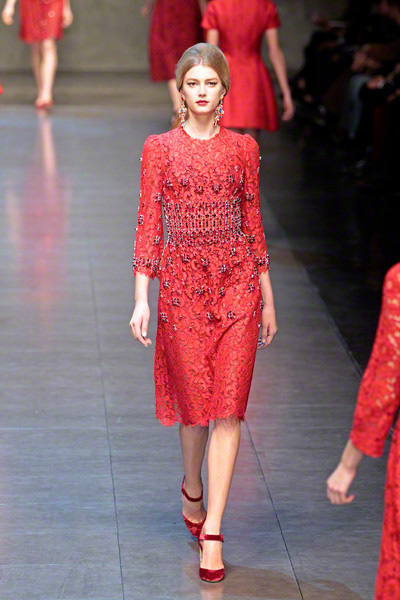 Dolce & Gabbana used all the elements of masculine and feminine dressing in one collection. 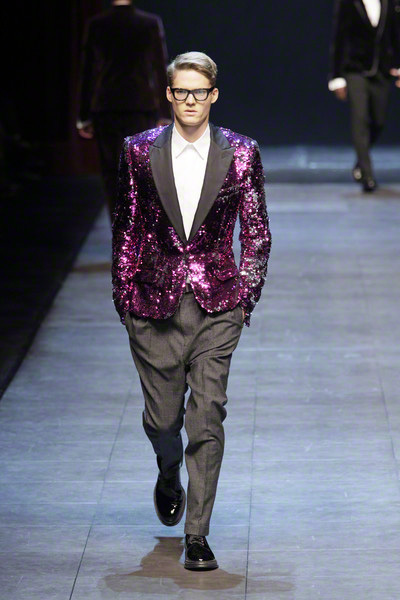 Black, grey and white were the main colors for both sexes, while yellow, pink, blue, gold and silver added energy. 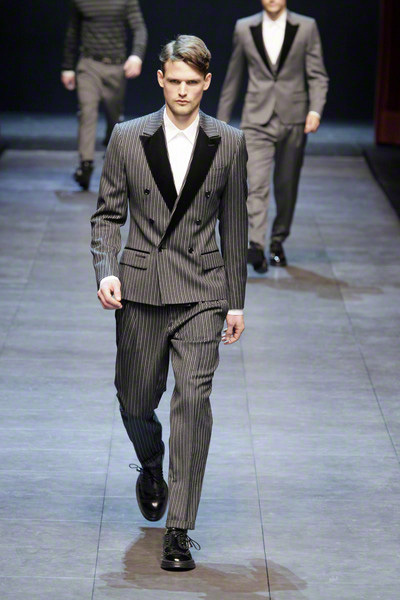 The masculine part of the collection contained slim cut tailored jackets and overcoats, lower-rise pants with slimmed down leg at calf. 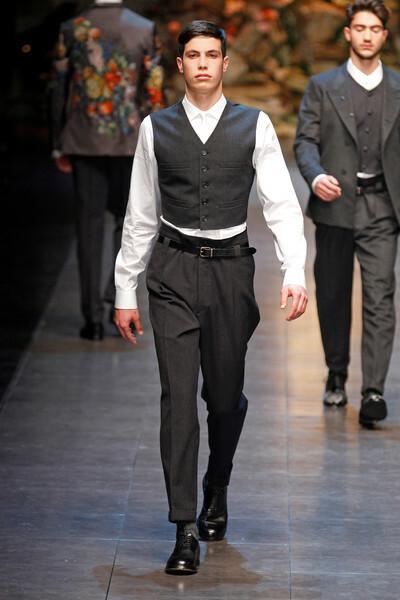 But also tuxedo shirts or shirts with large collars, jackets with cut off sleeves, vest jackets and vests. 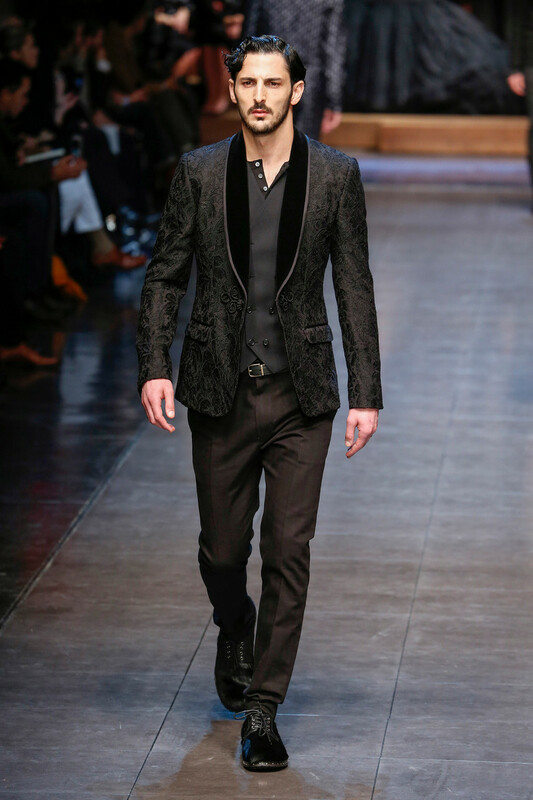 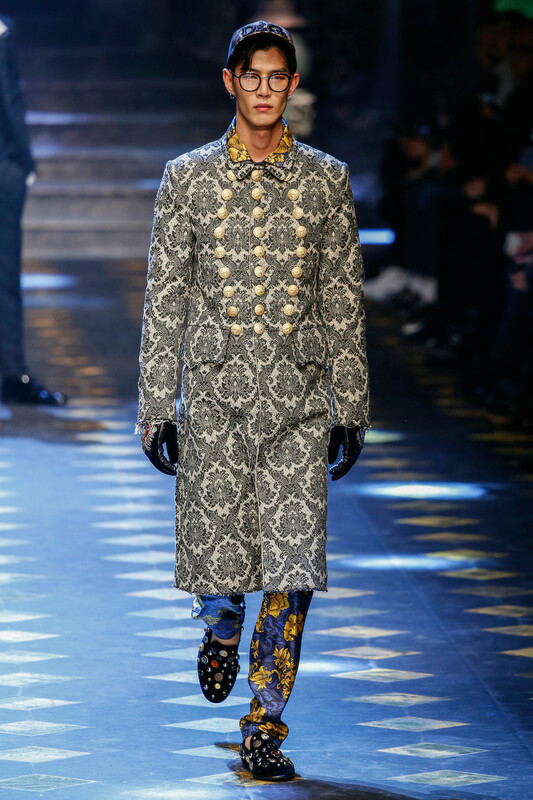 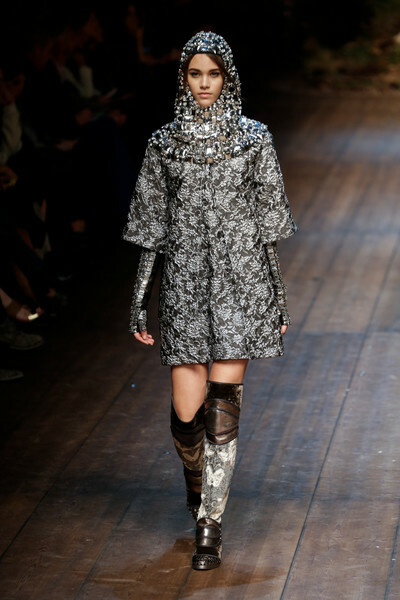 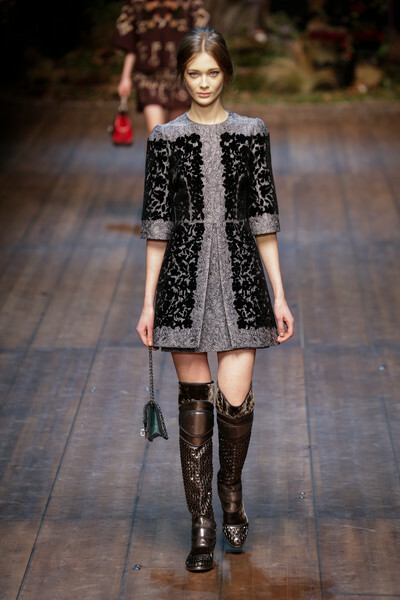 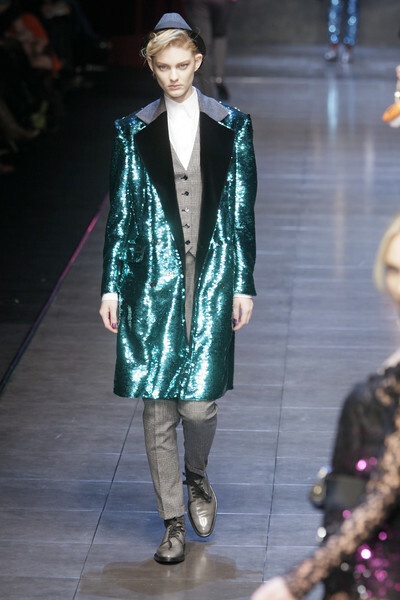 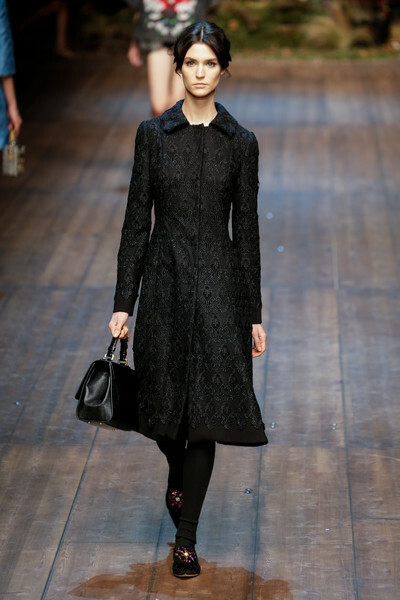 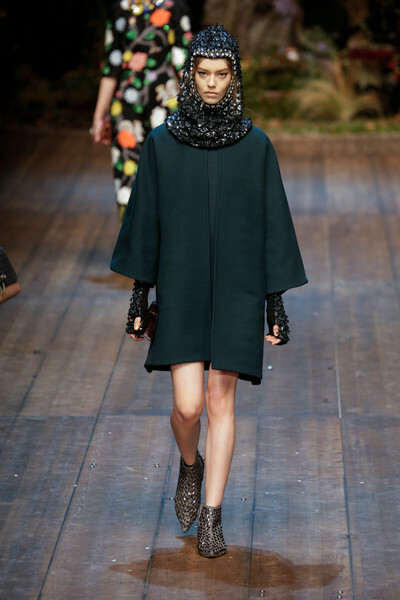 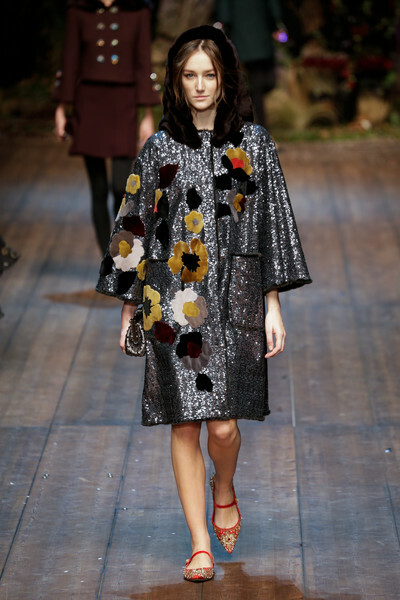 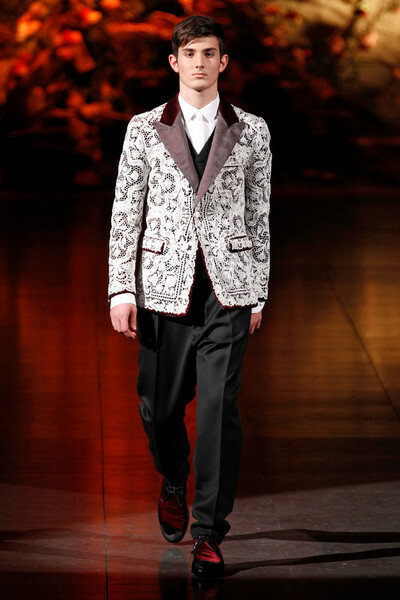 For evening coats and jackets were cut in lace, paillettes, herringbone and had with embroidered lapels. 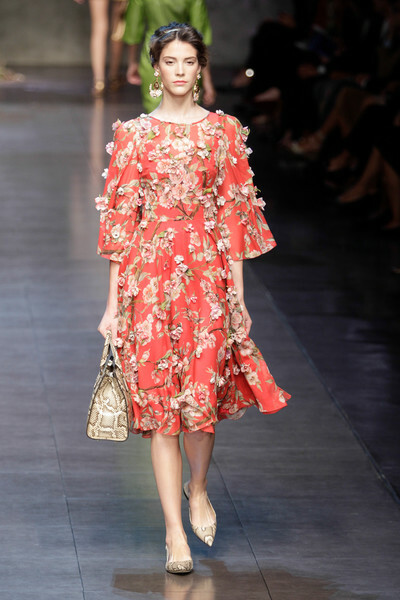 The feminine part was all about body-hugging shapes, loose chiffon printed dresses with star motifs or musical notes, lace, paillettes, jewelled embroidery and touches of fur. 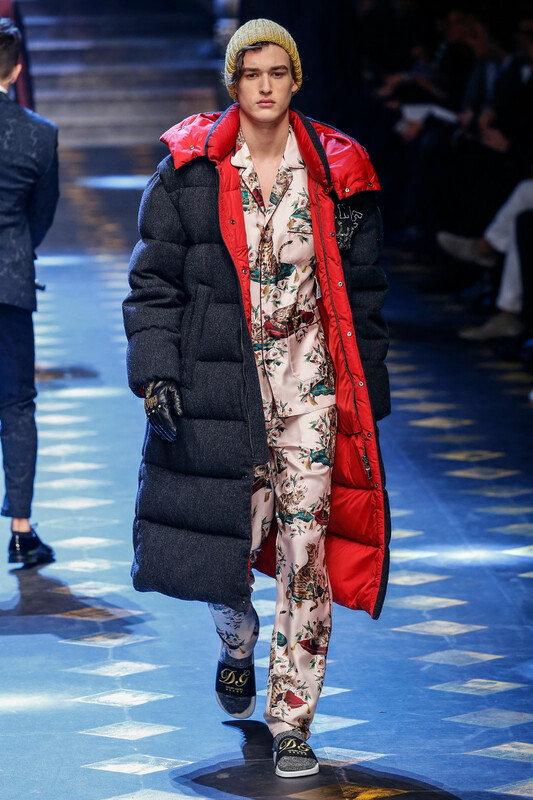 The result was an energetic collection, thanks to the music and colorful, shiny accessories, but it didn’t reach the high level of the anniversary-collections the designduo presented the last two season, where they focused at the quality of their fabrics and design. 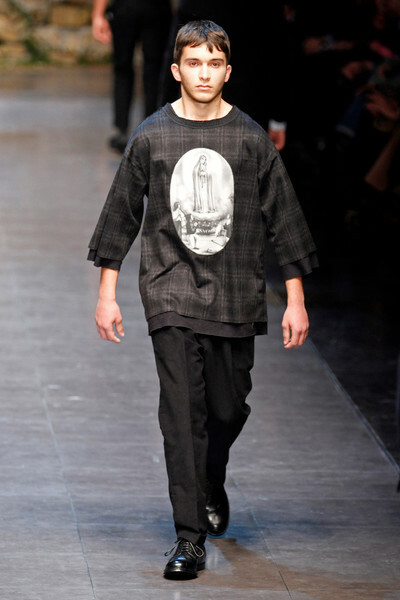 This collection sometimes reminded too much of their second line. 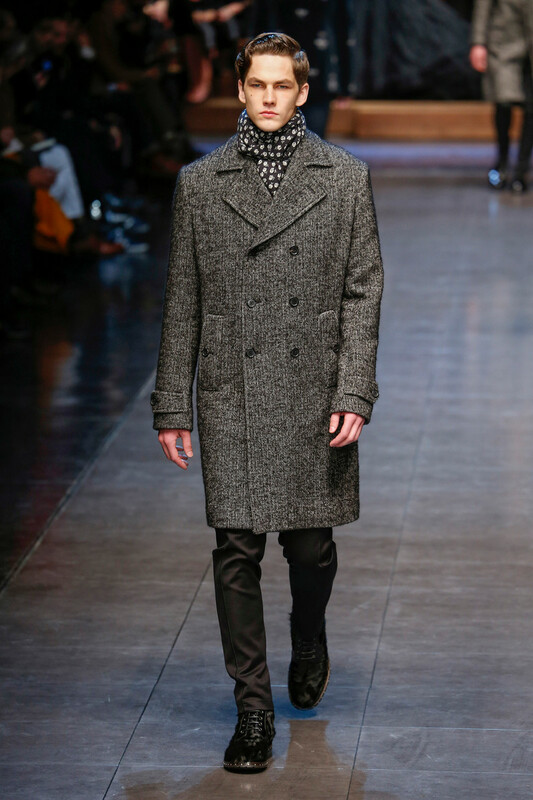 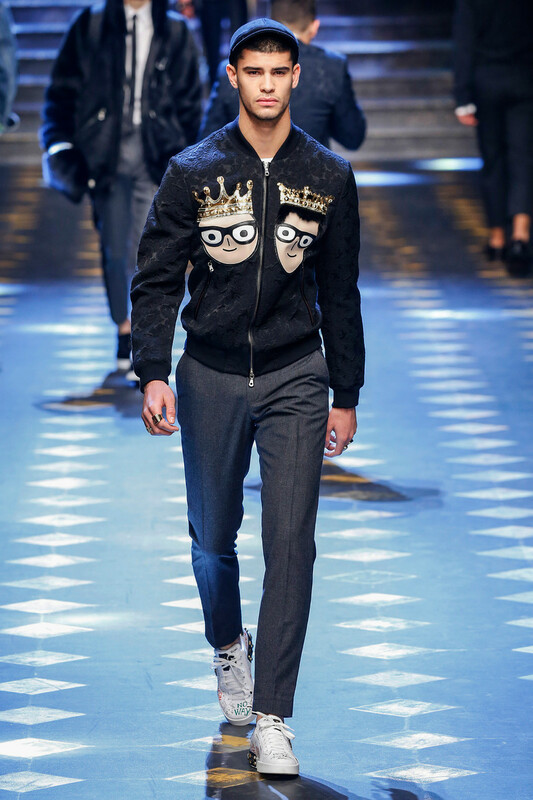 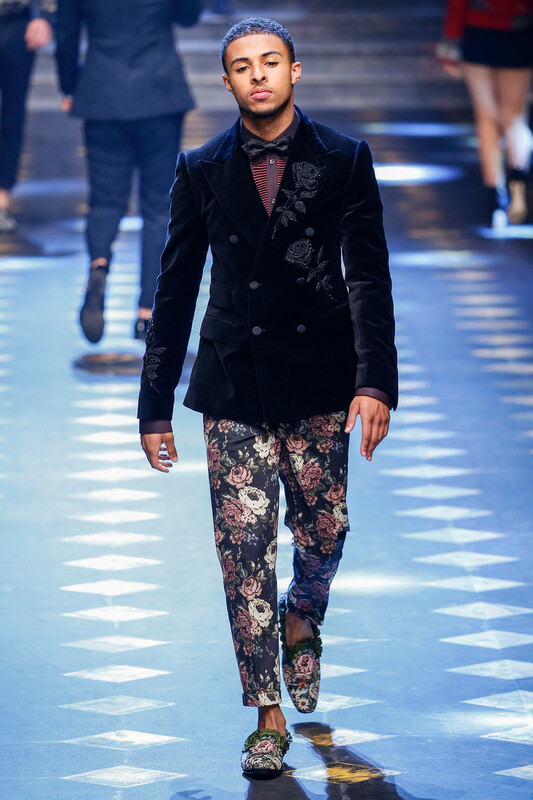 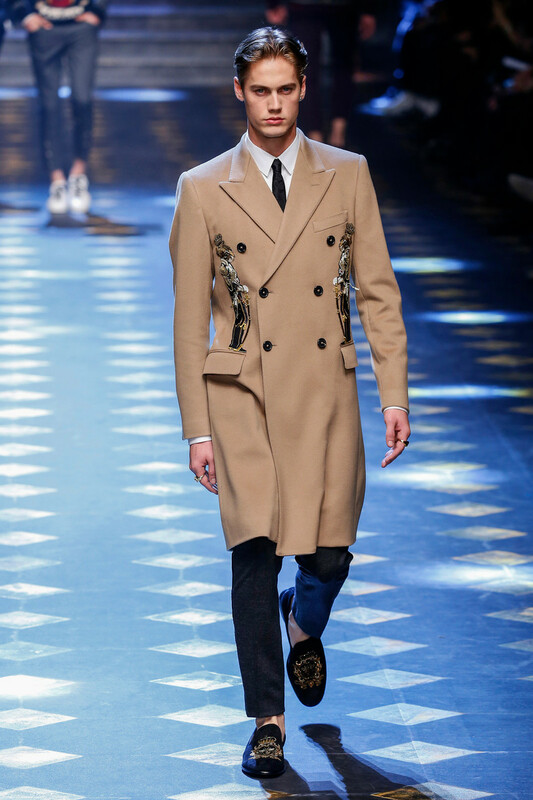 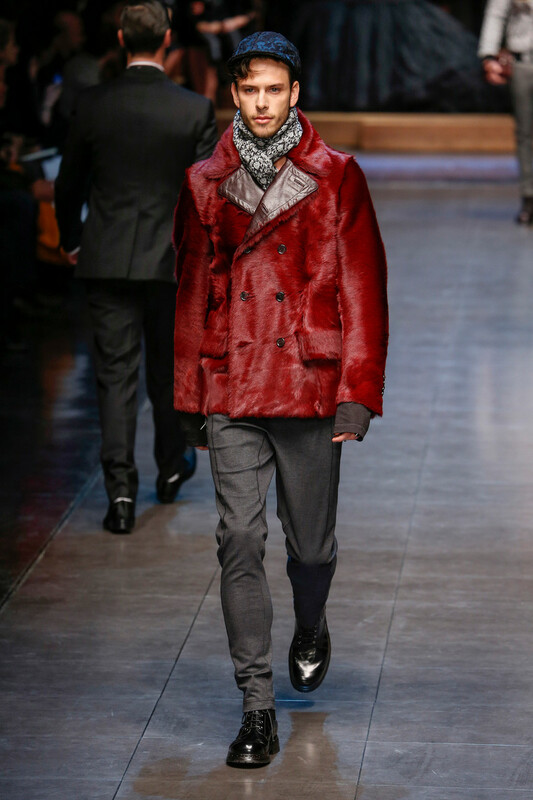 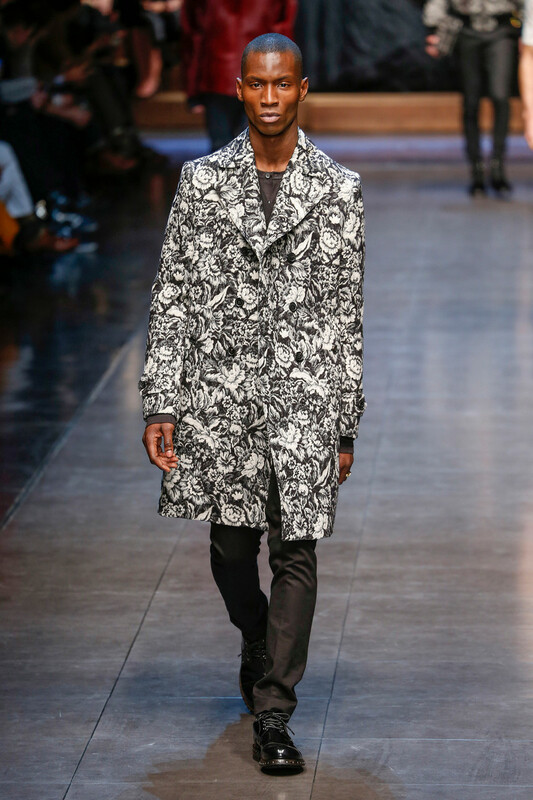 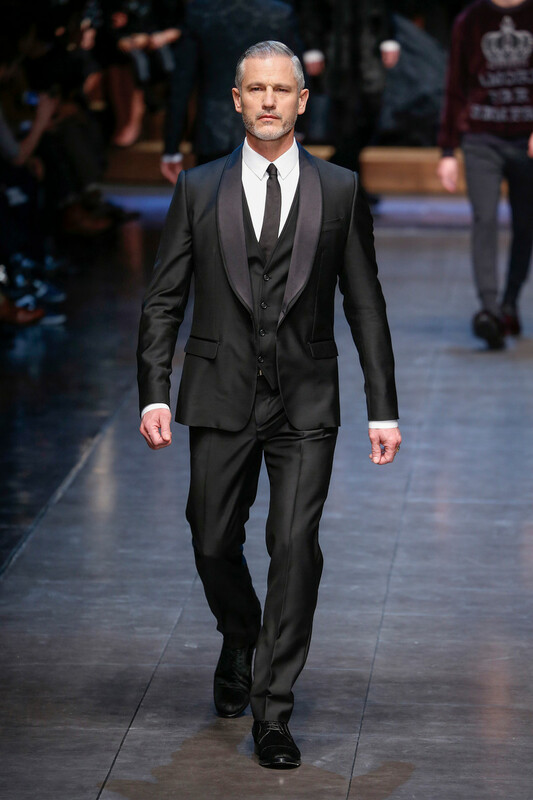 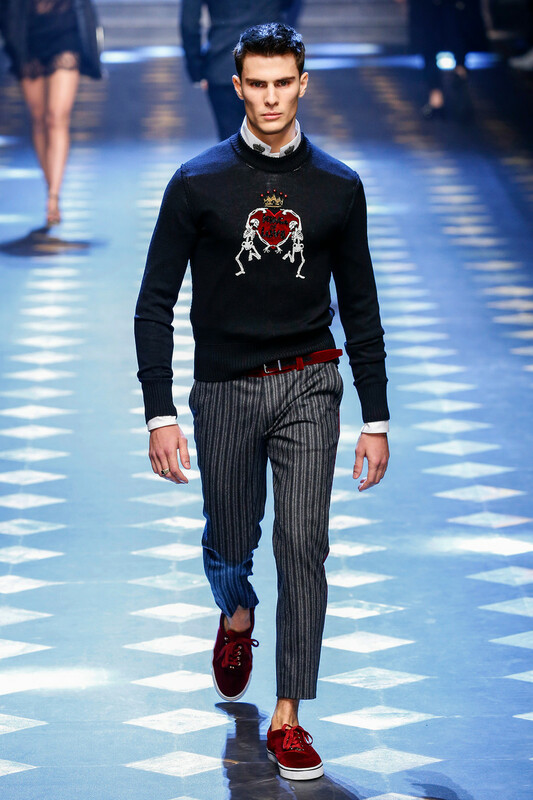 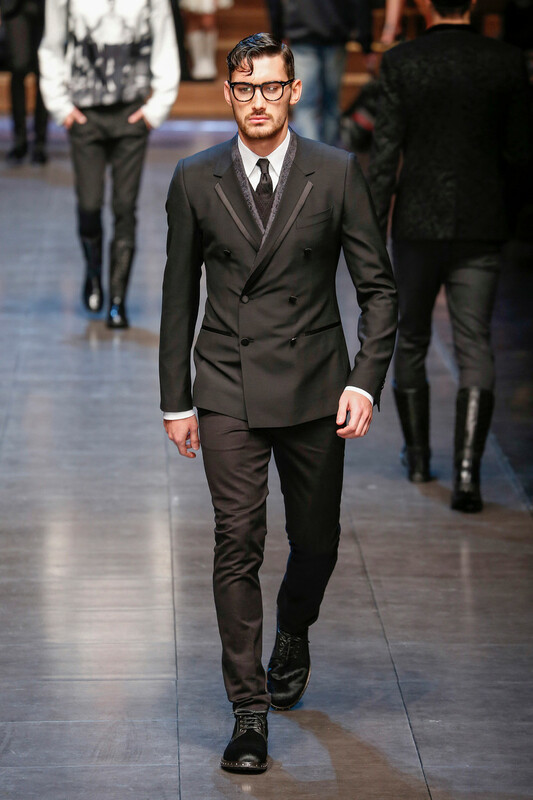 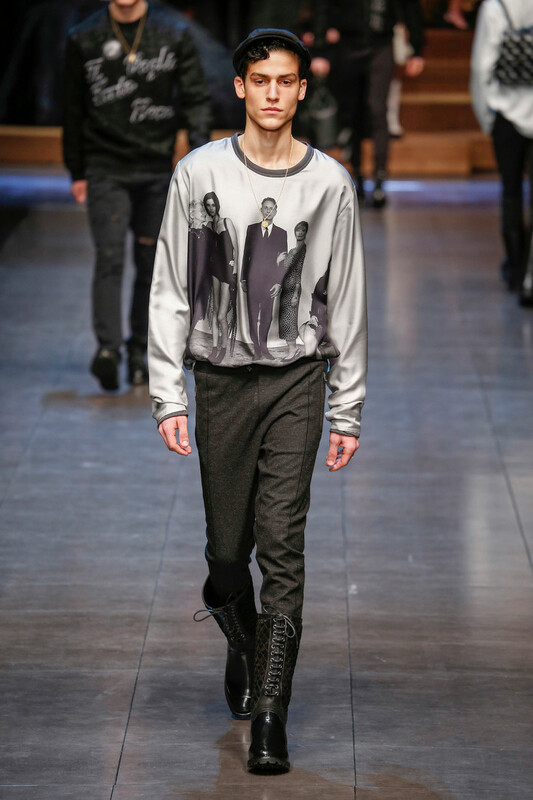 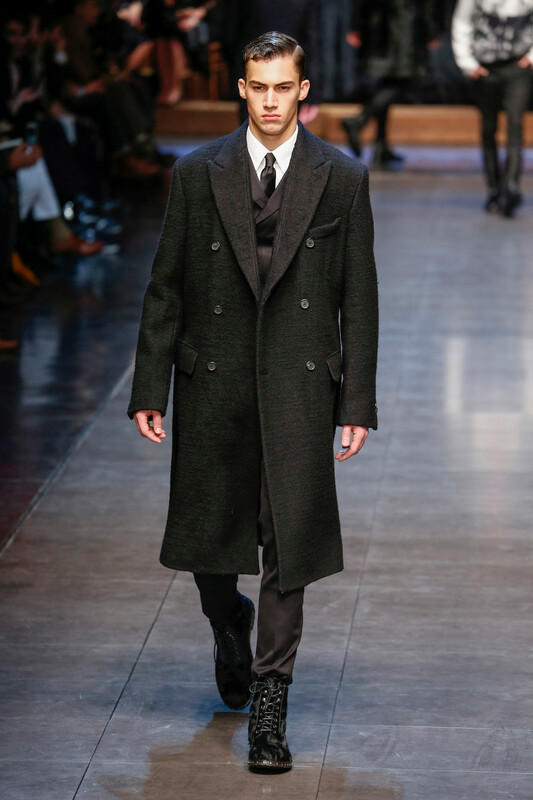 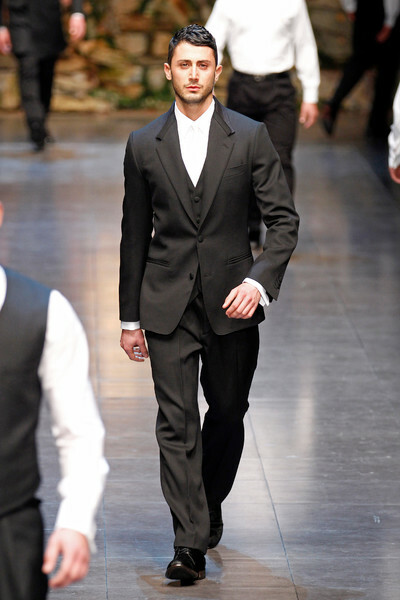 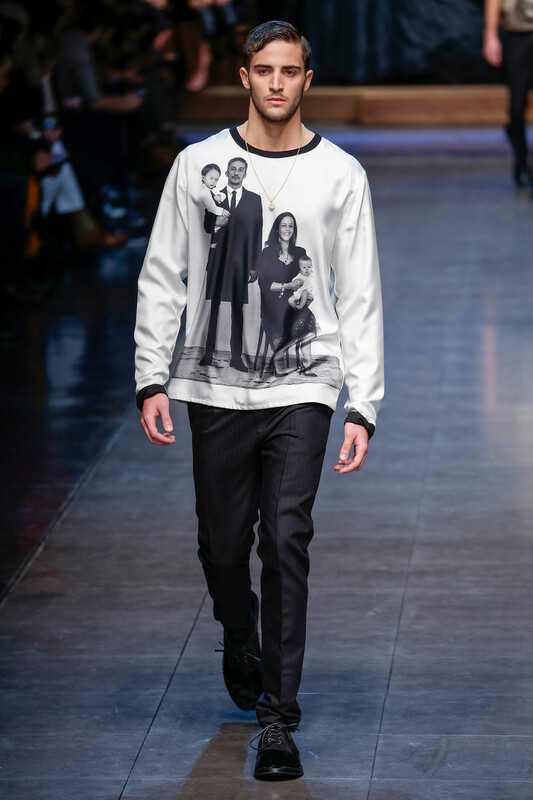 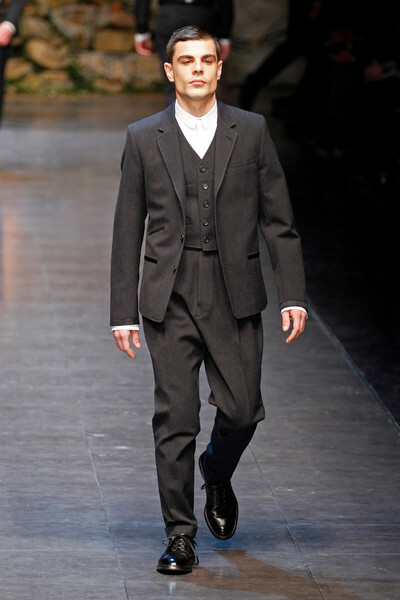 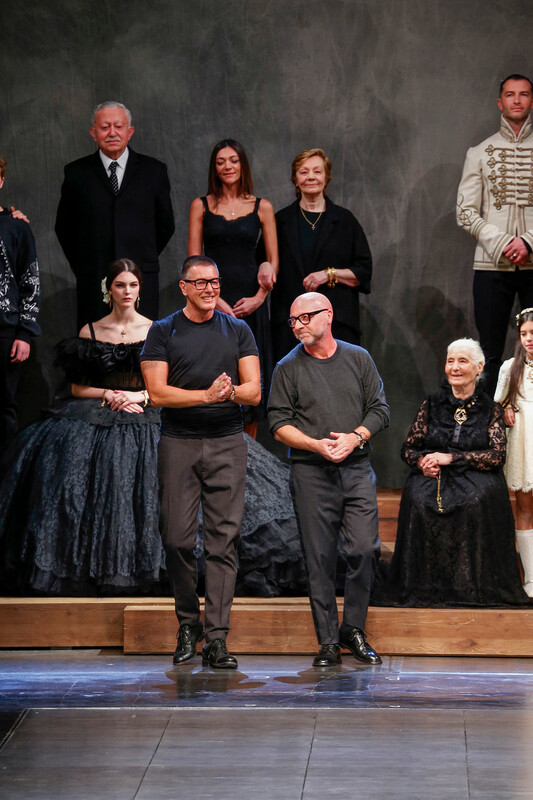 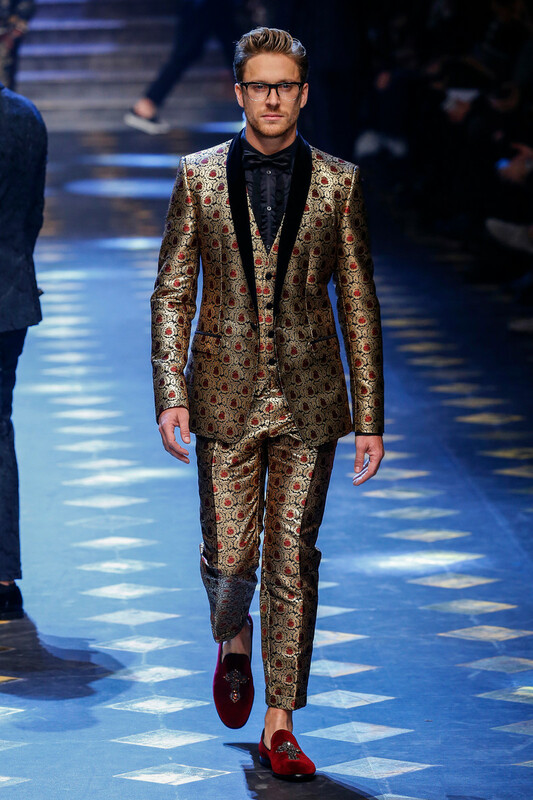 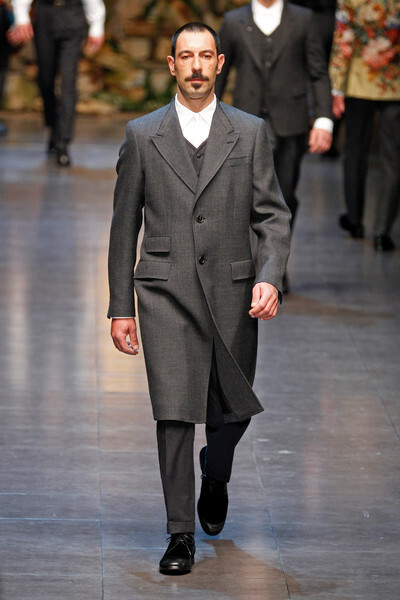 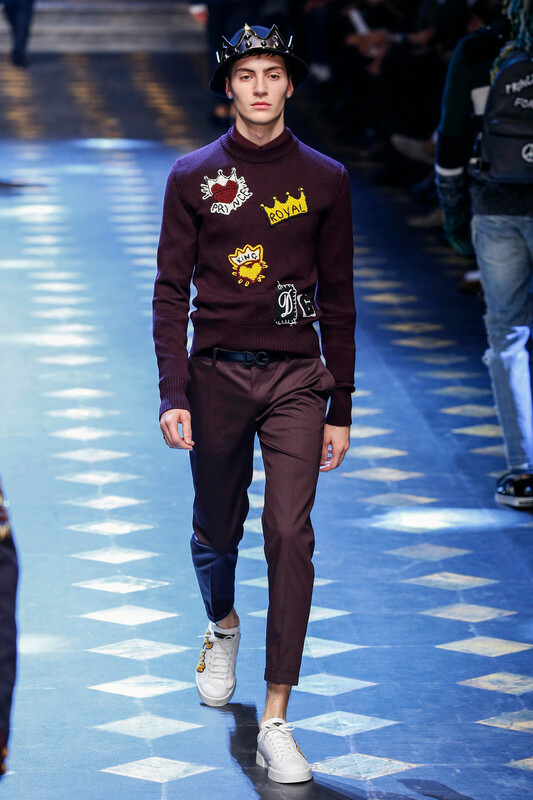 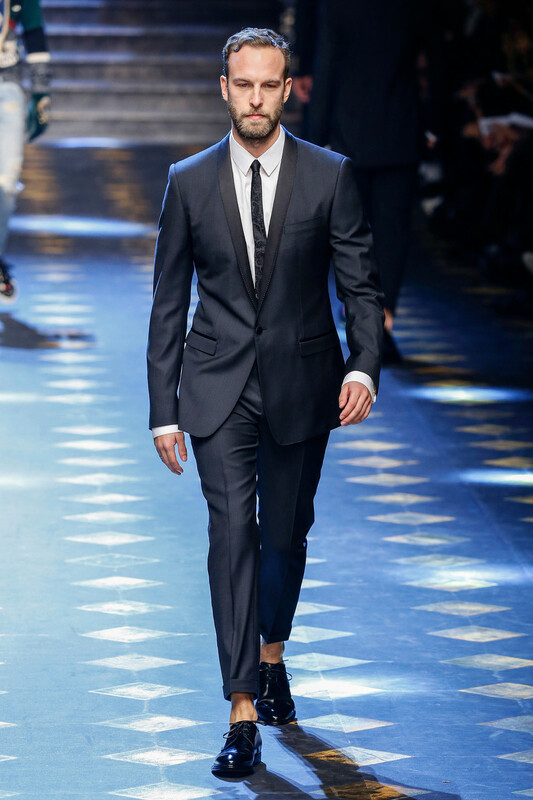 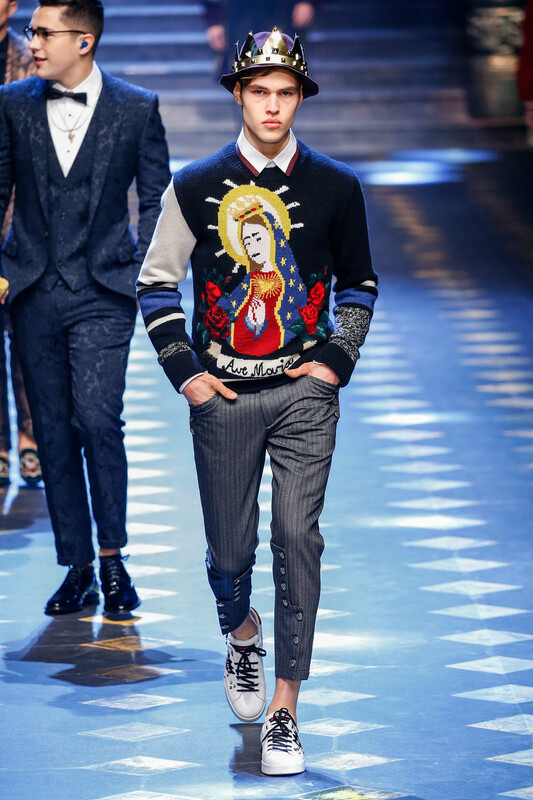 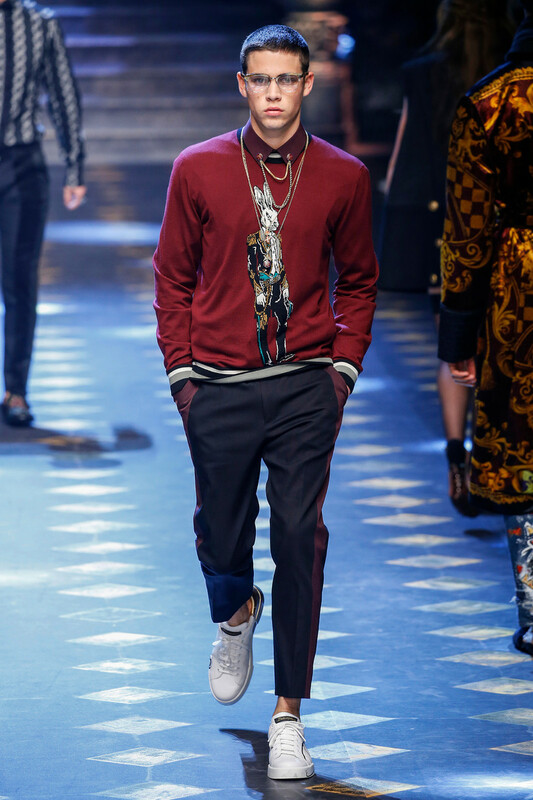 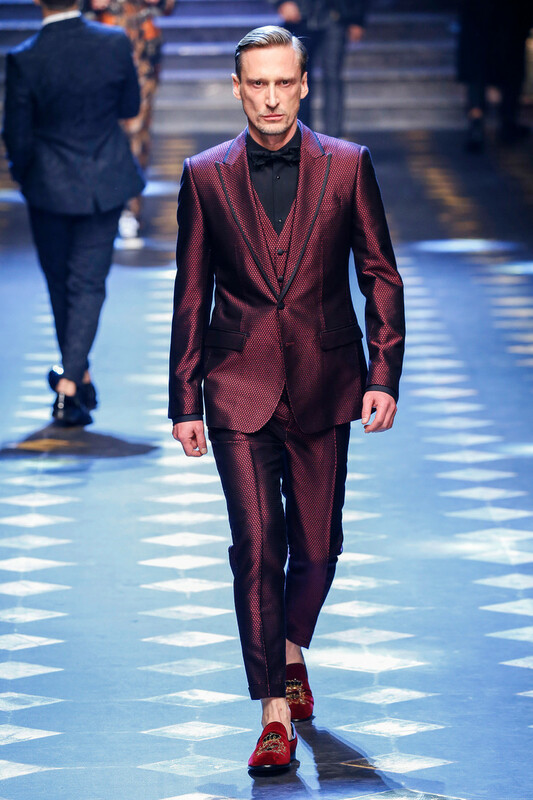 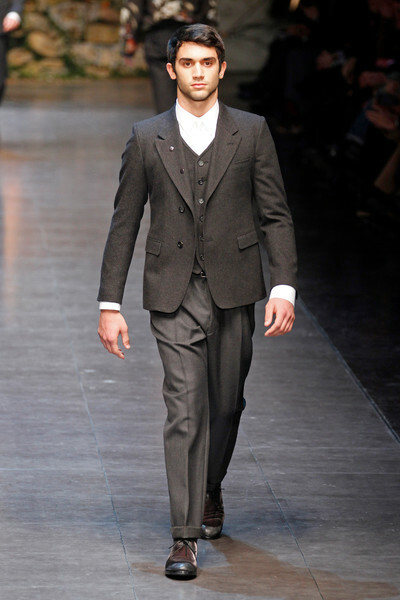 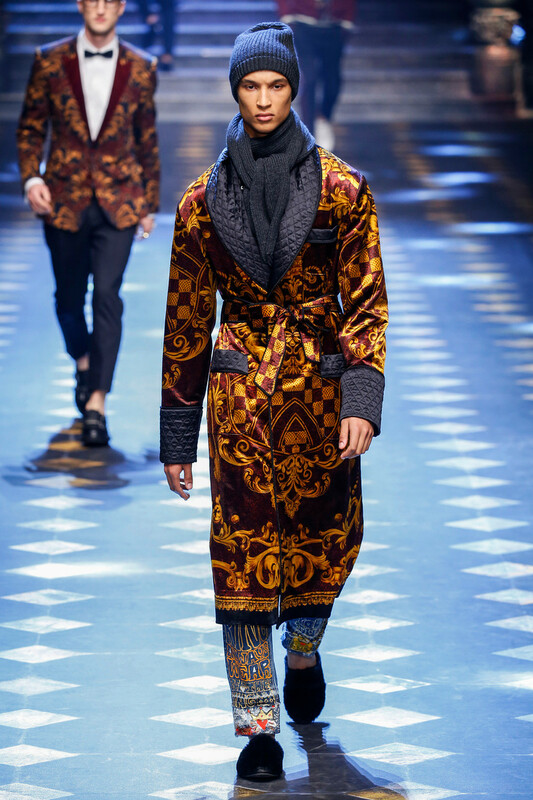 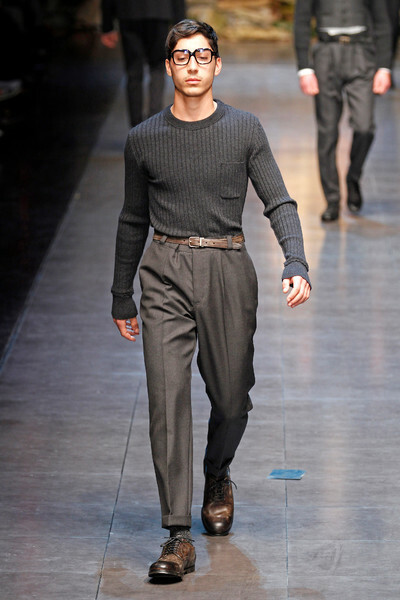 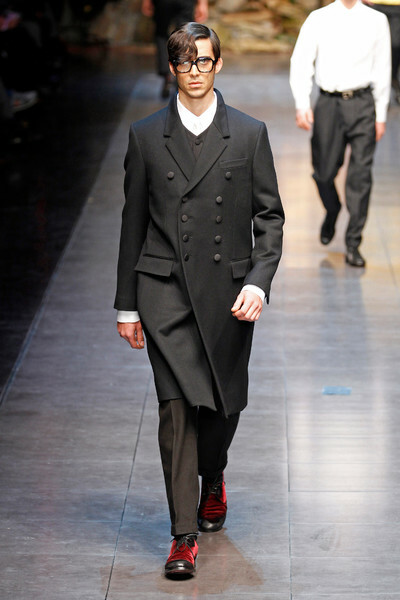 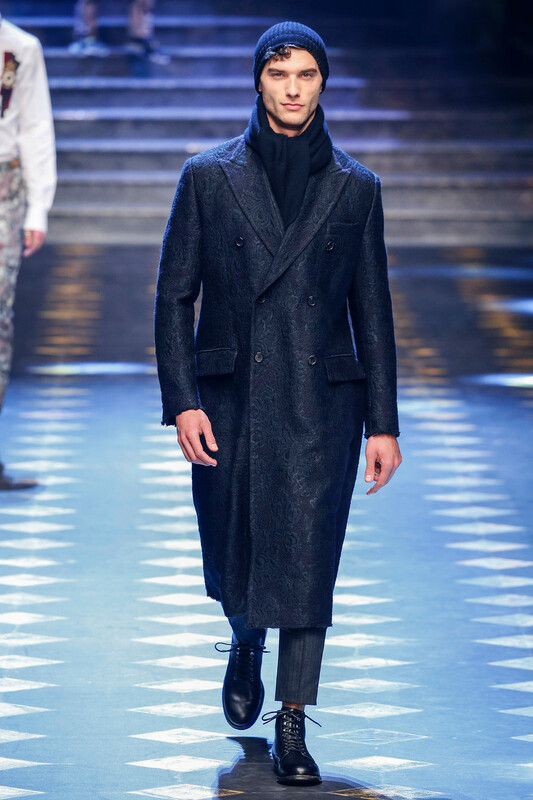 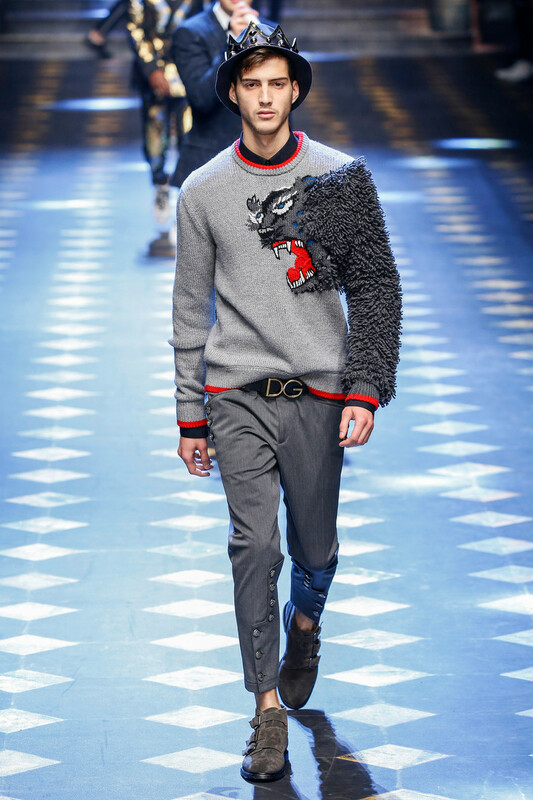 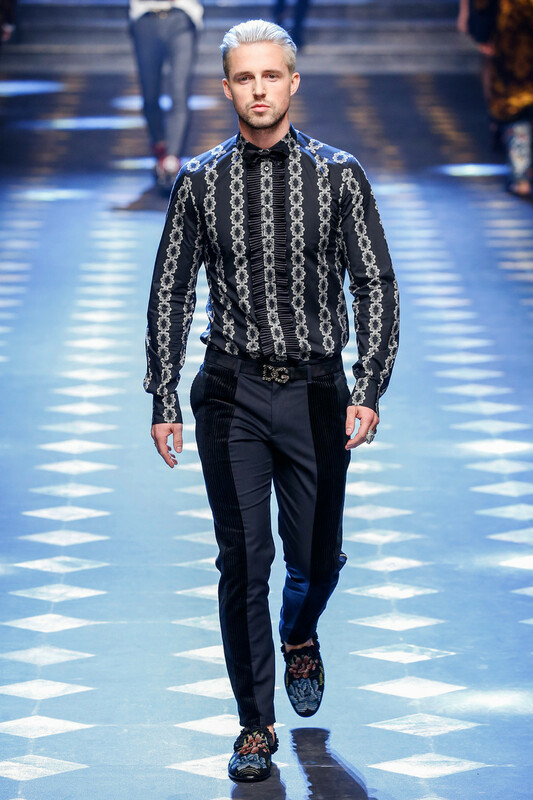 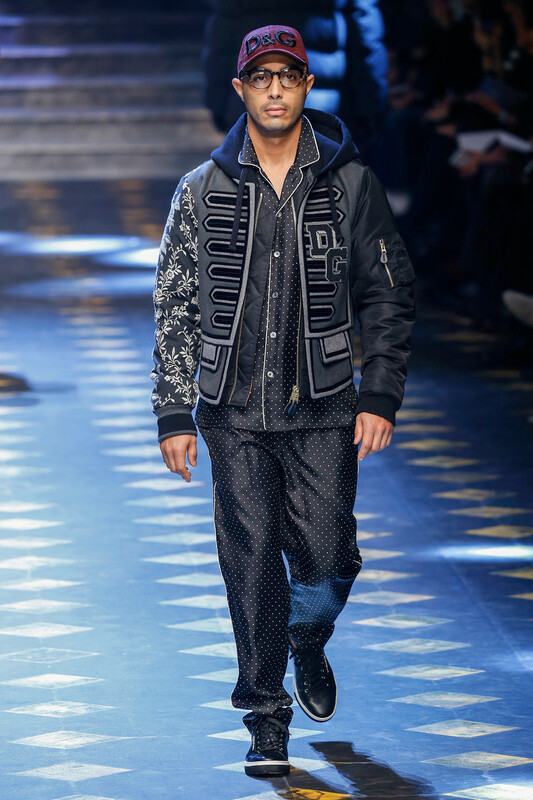 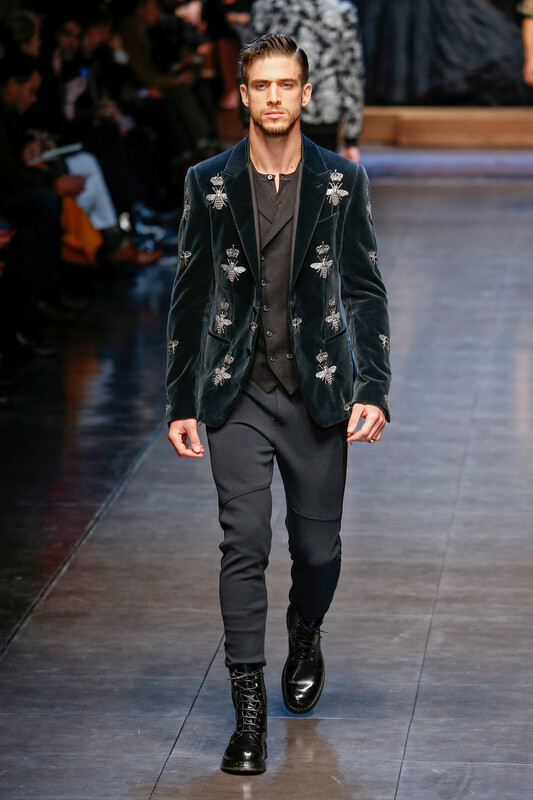 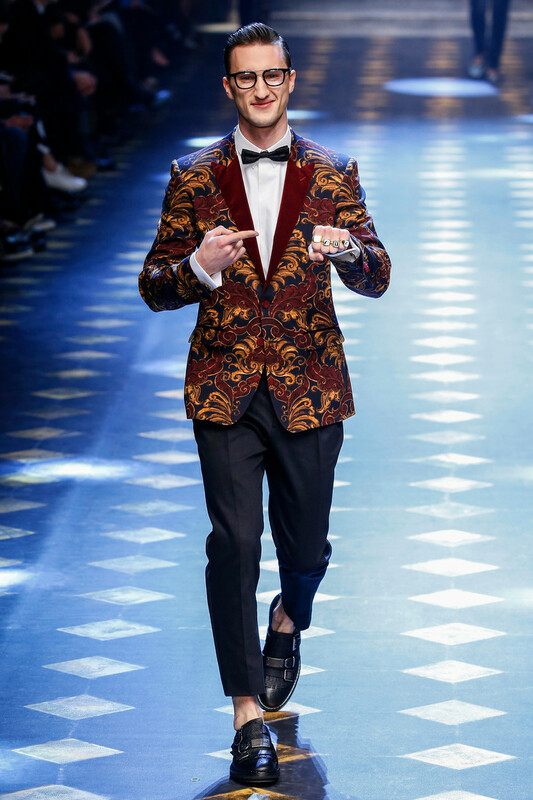 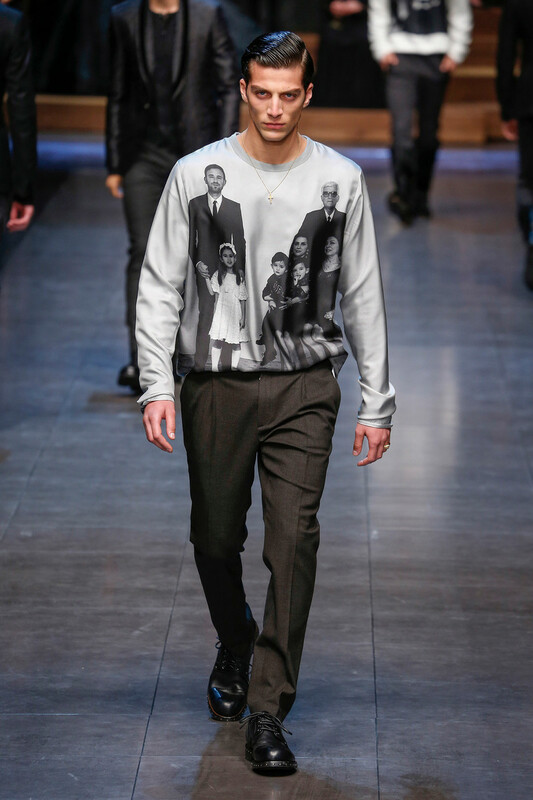 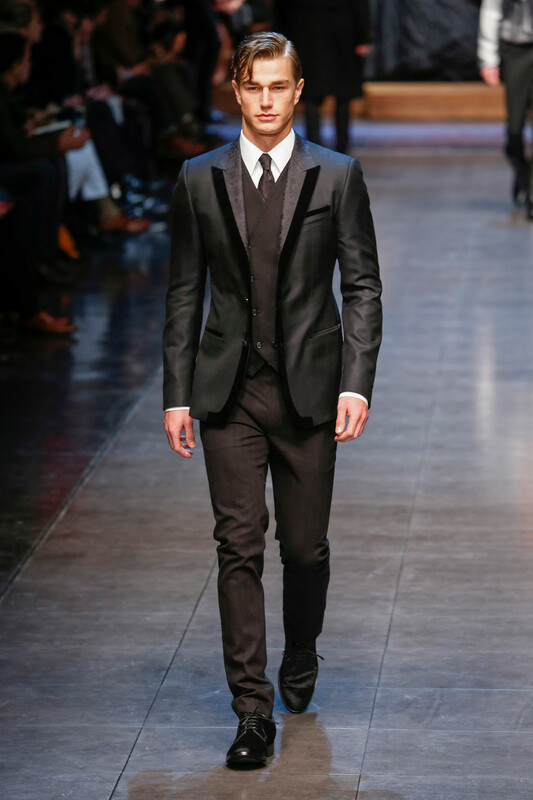 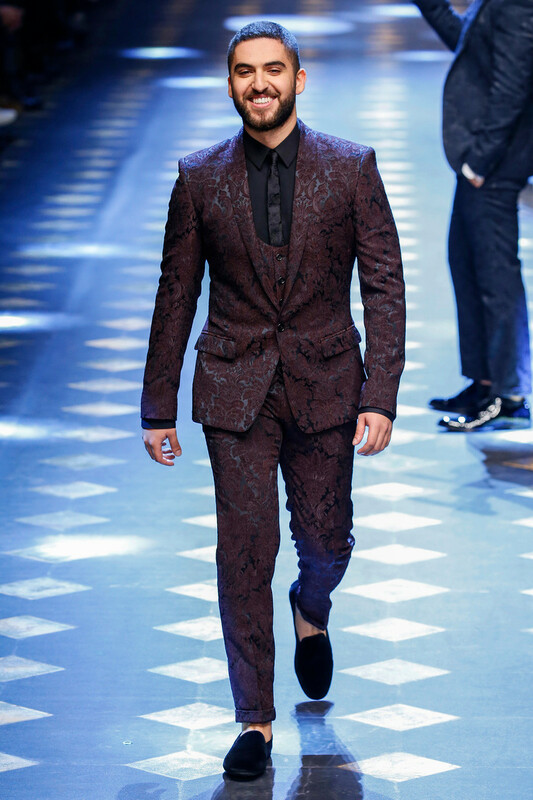 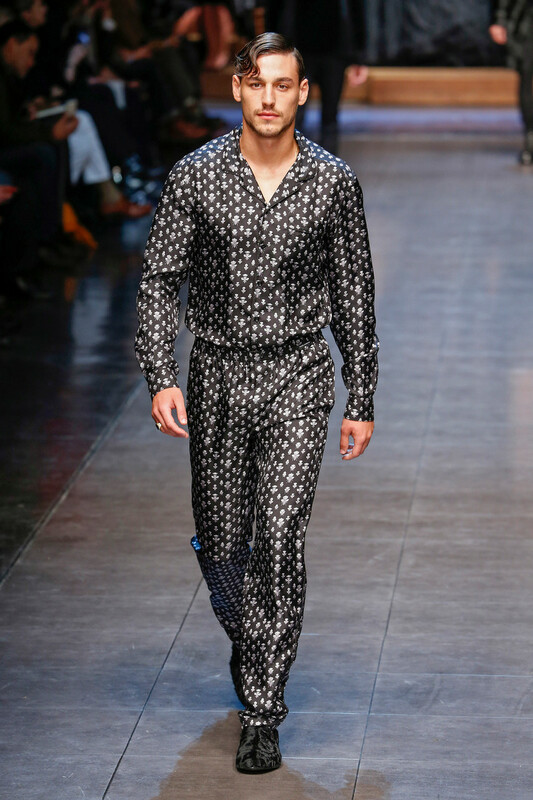 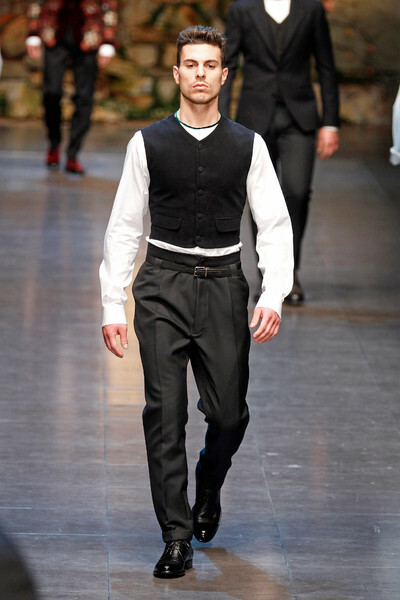 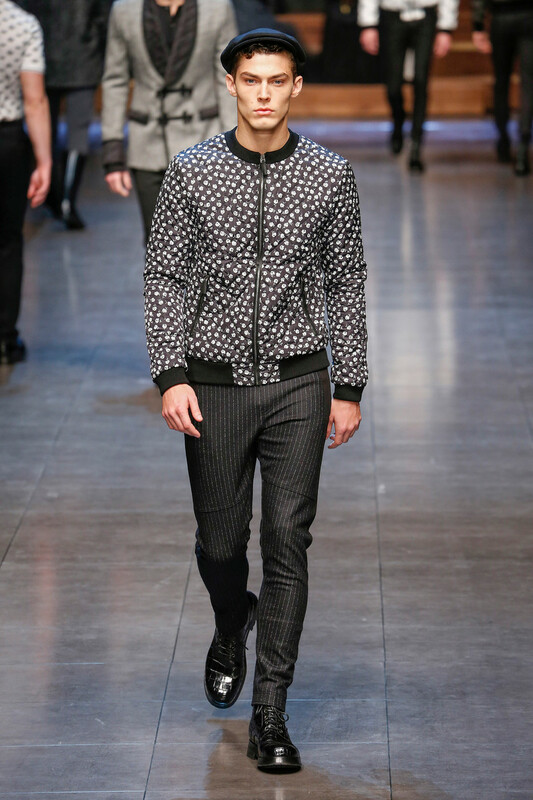 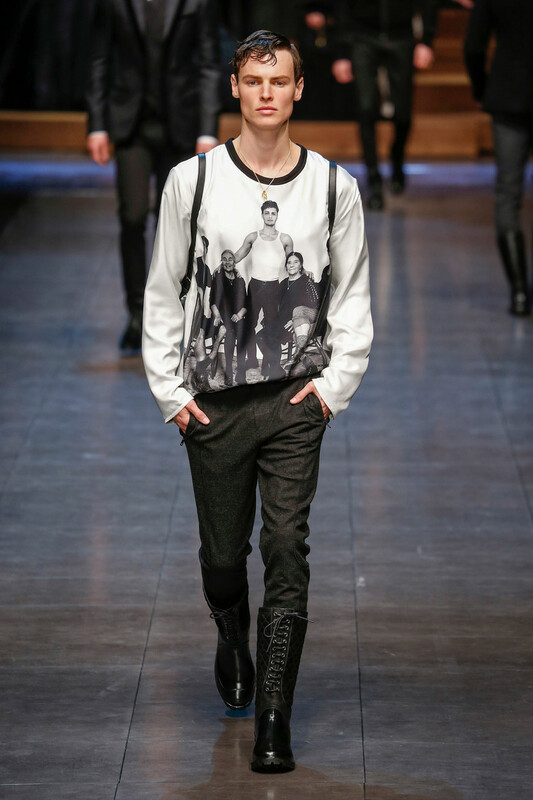 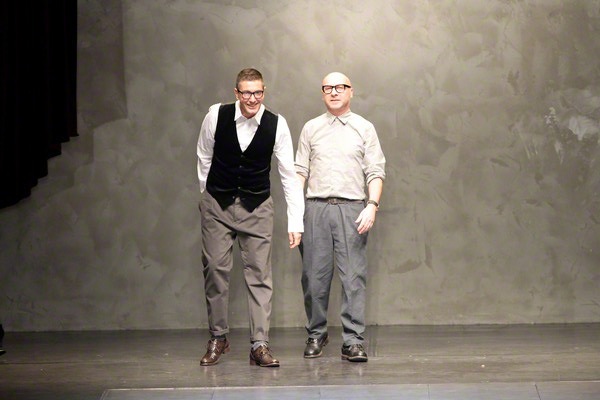 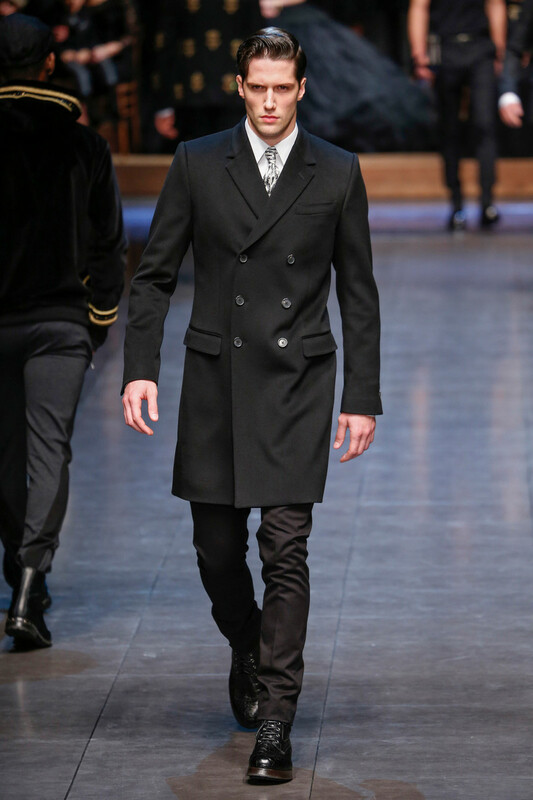 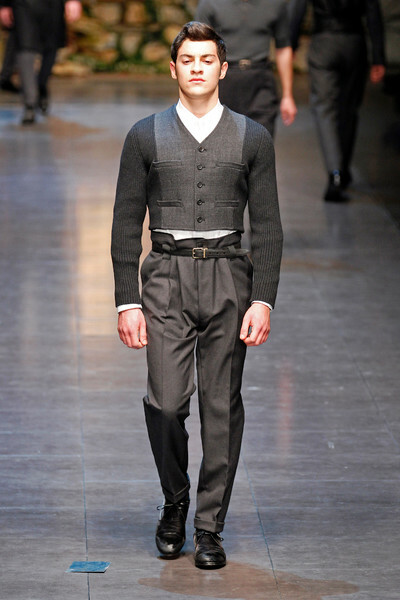 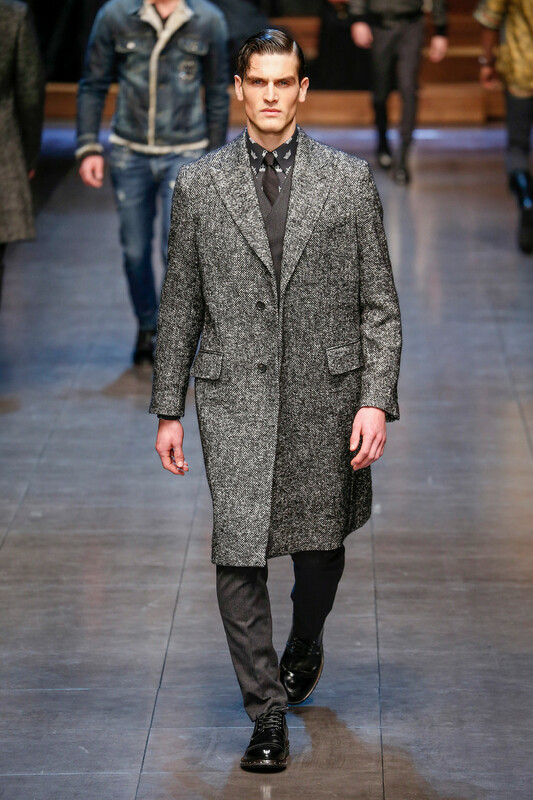 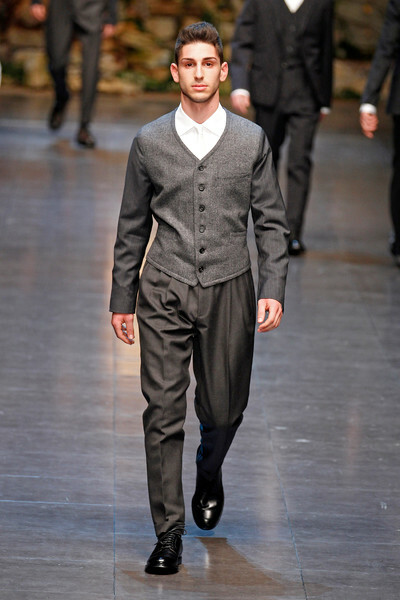 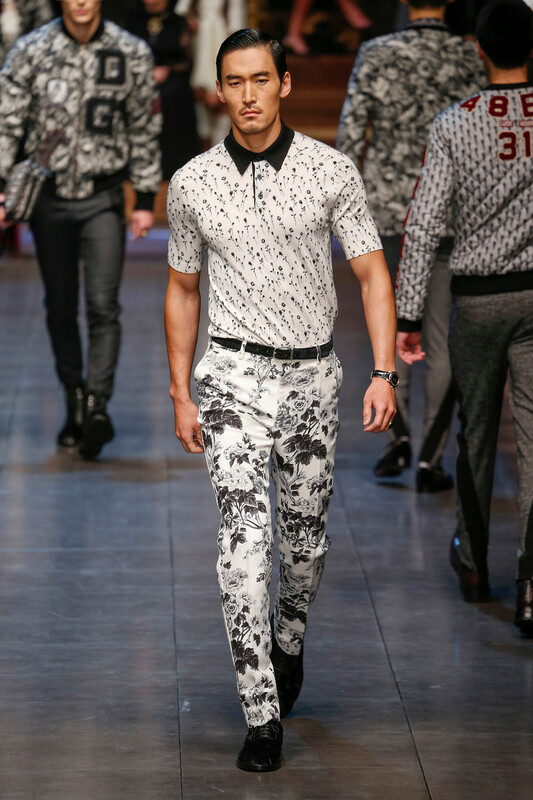 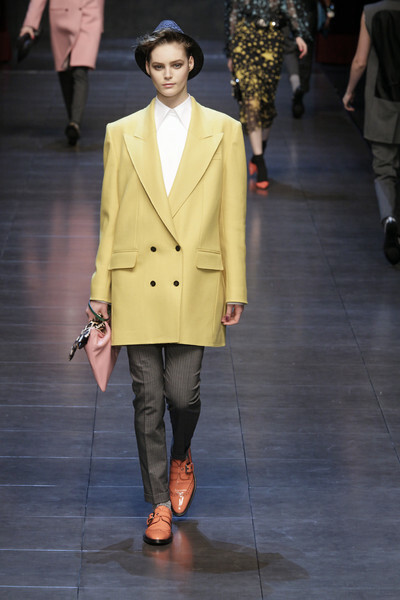 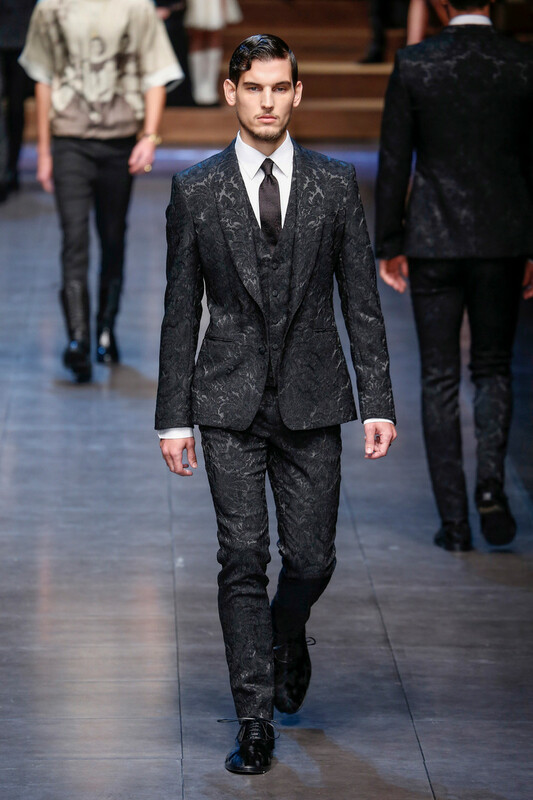 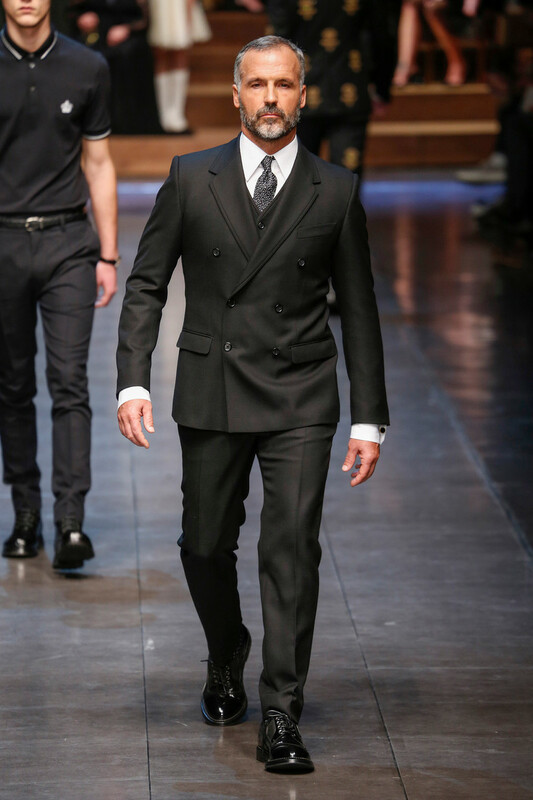 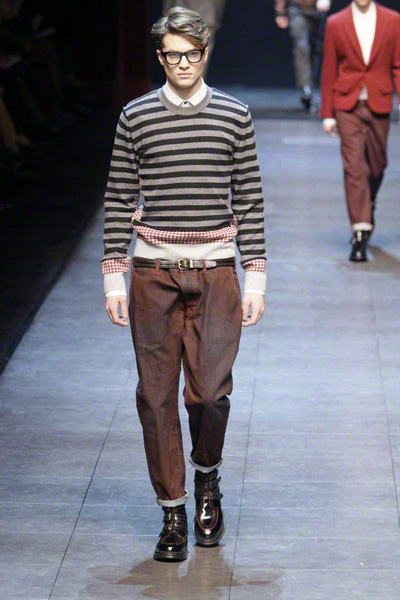 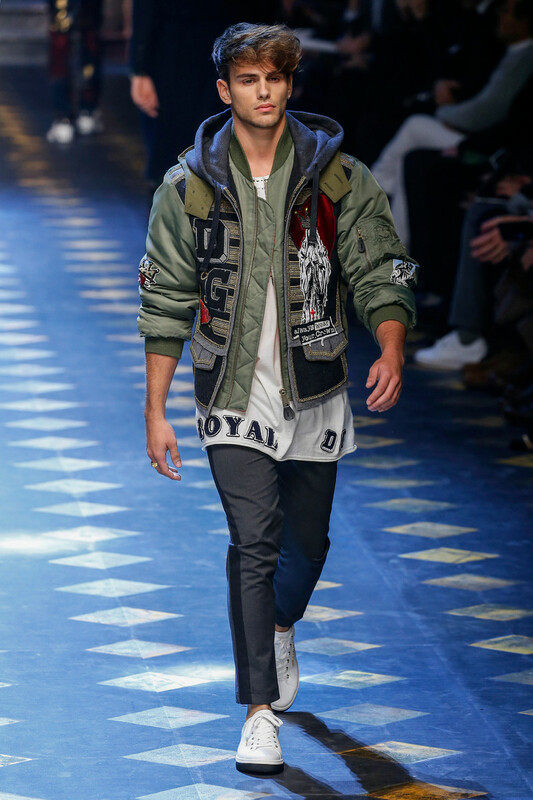 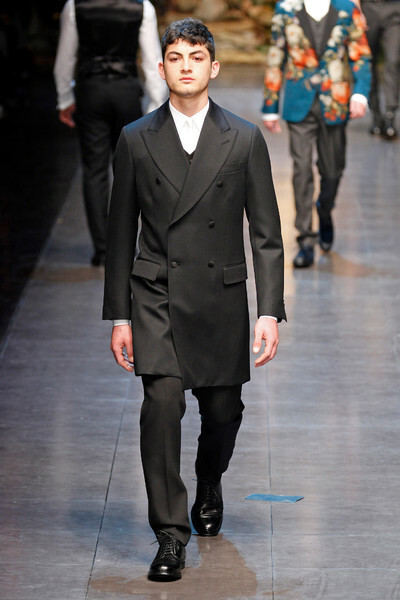 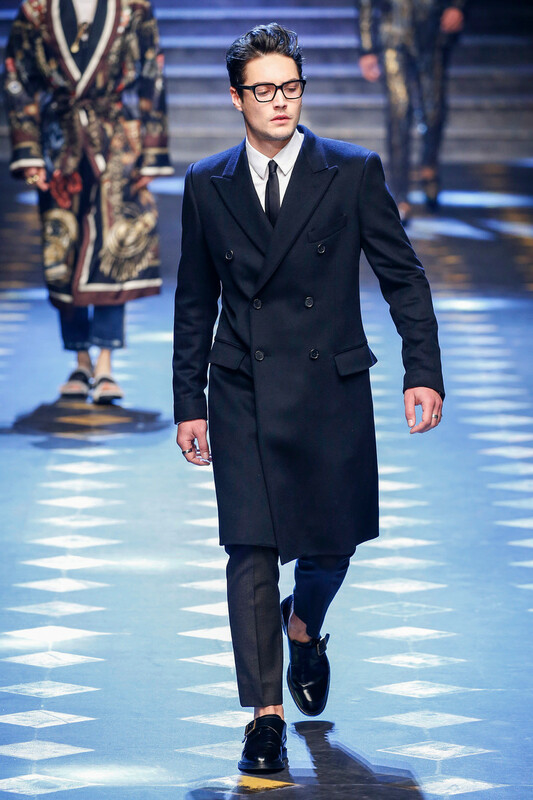 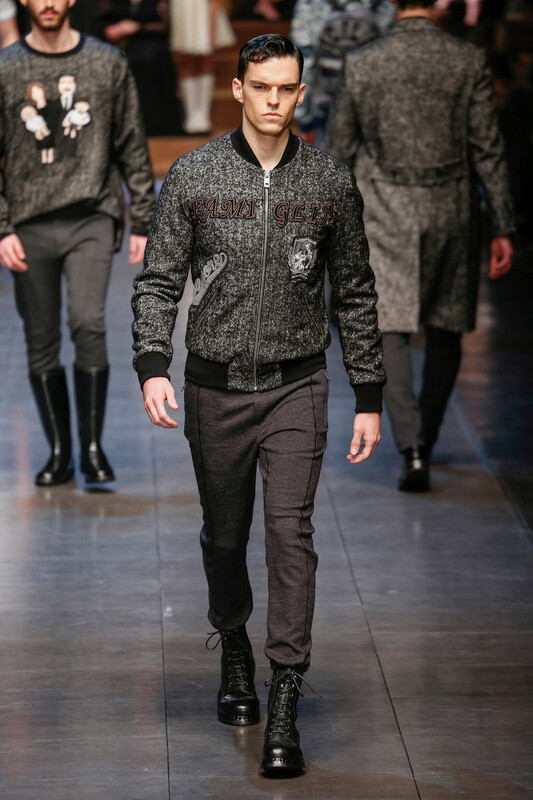 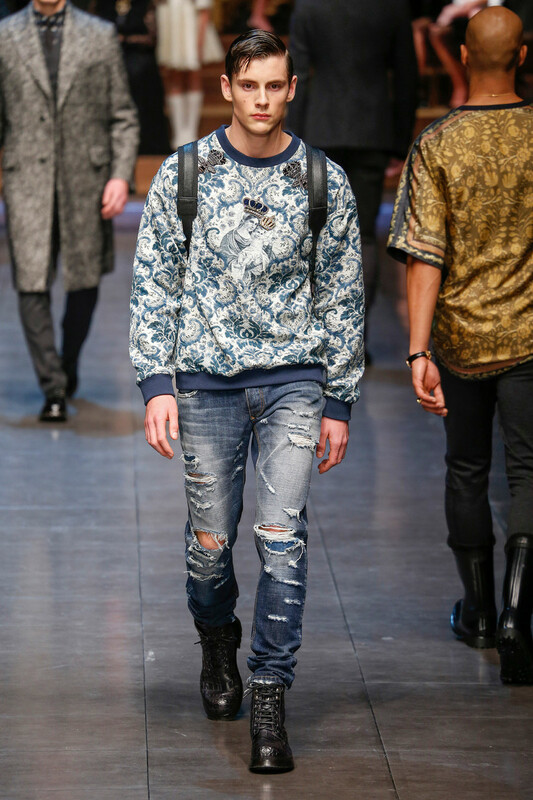 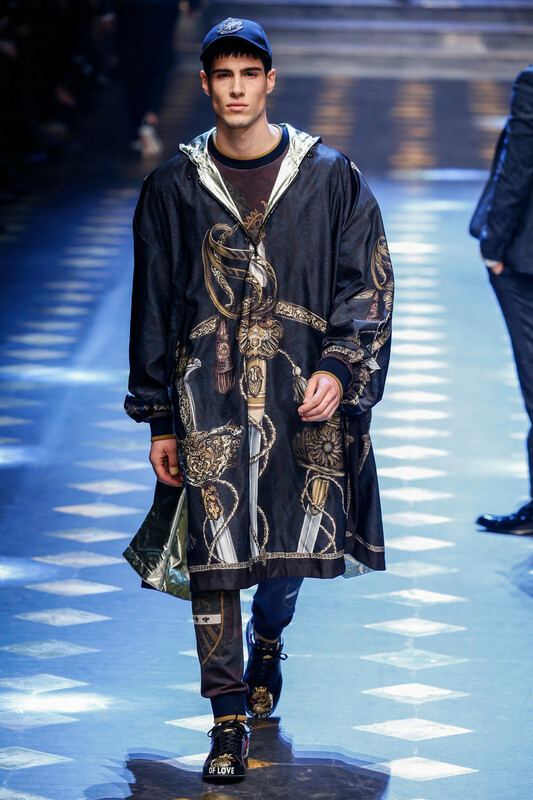 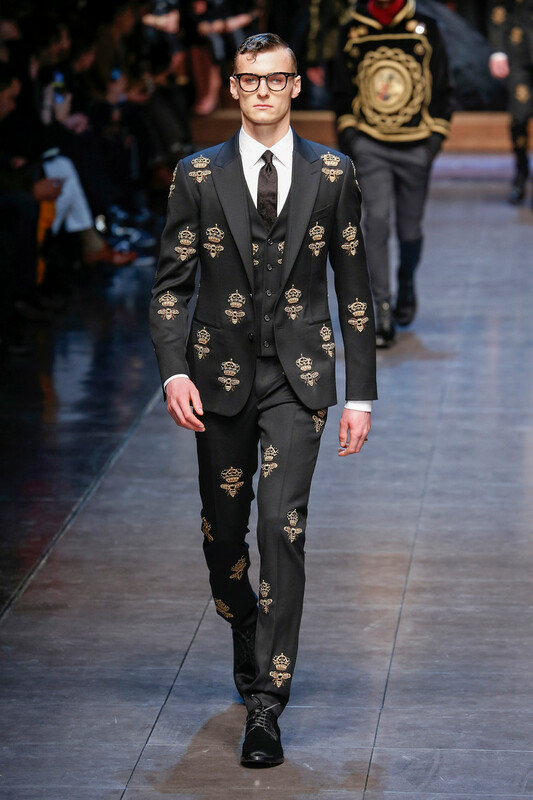 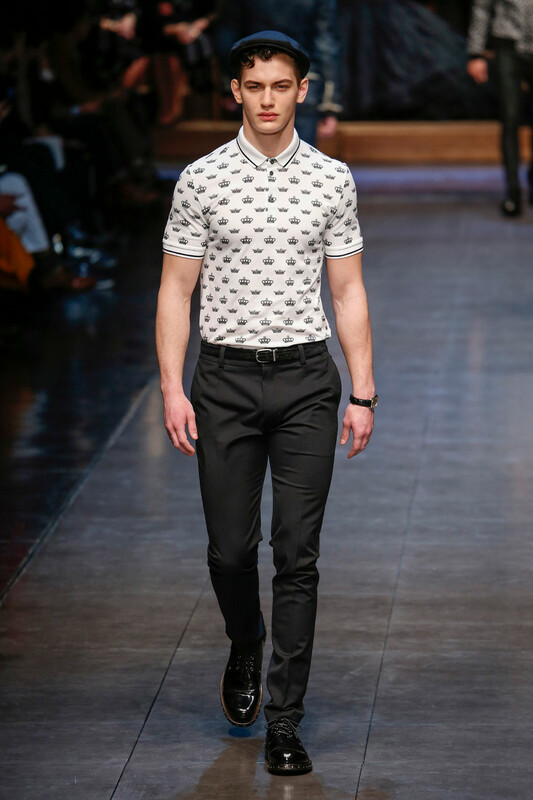 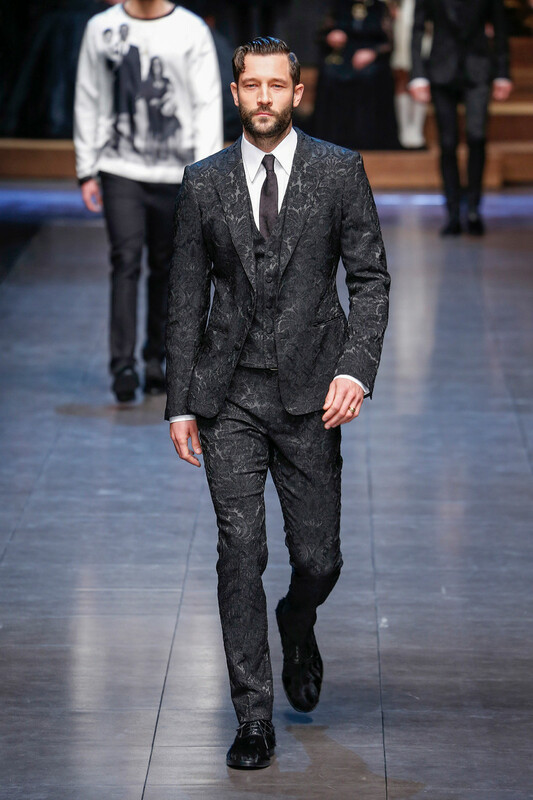 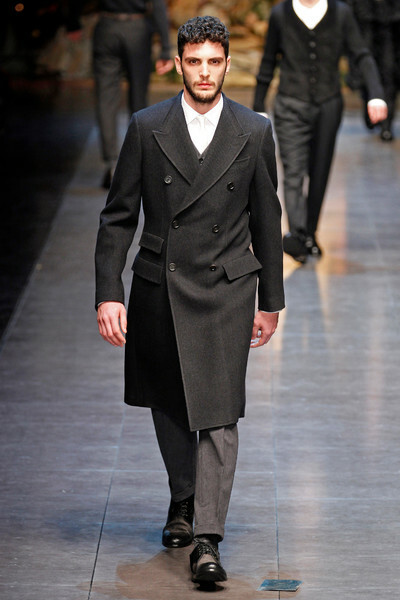 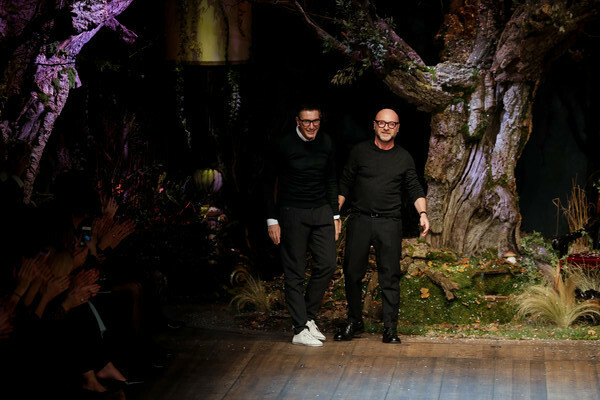 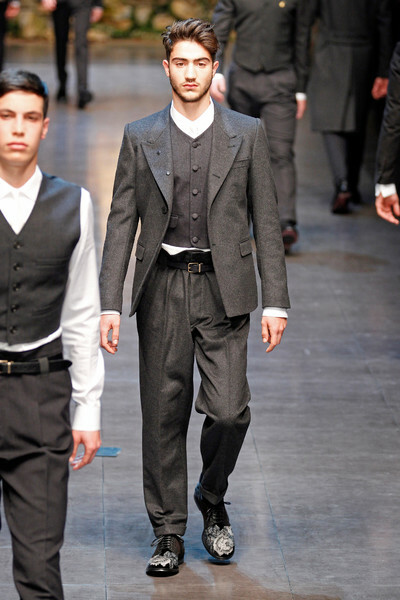 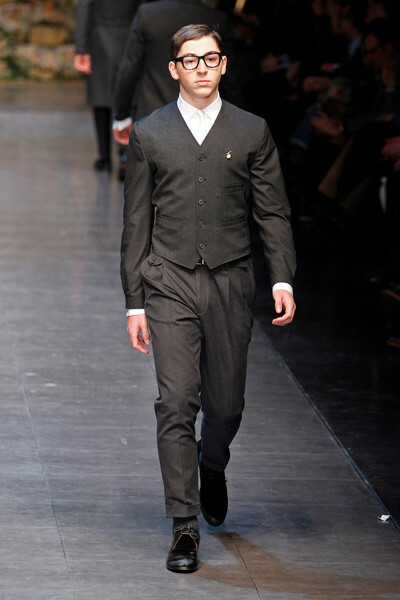 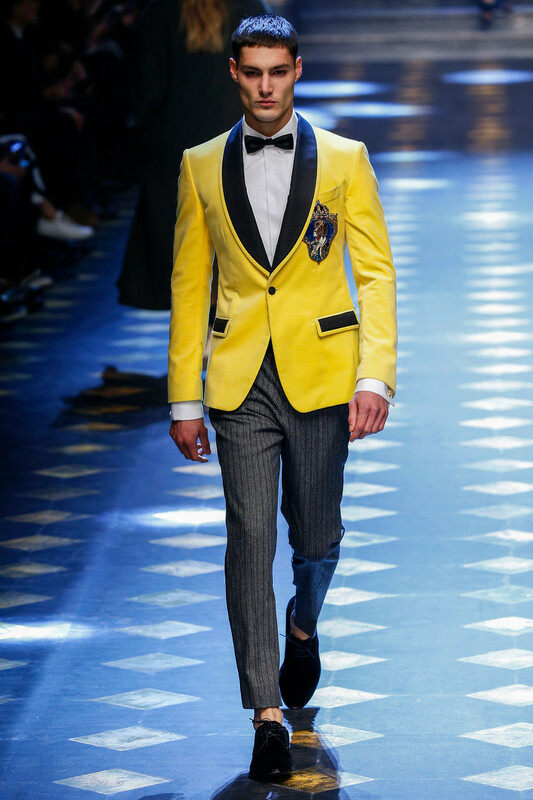 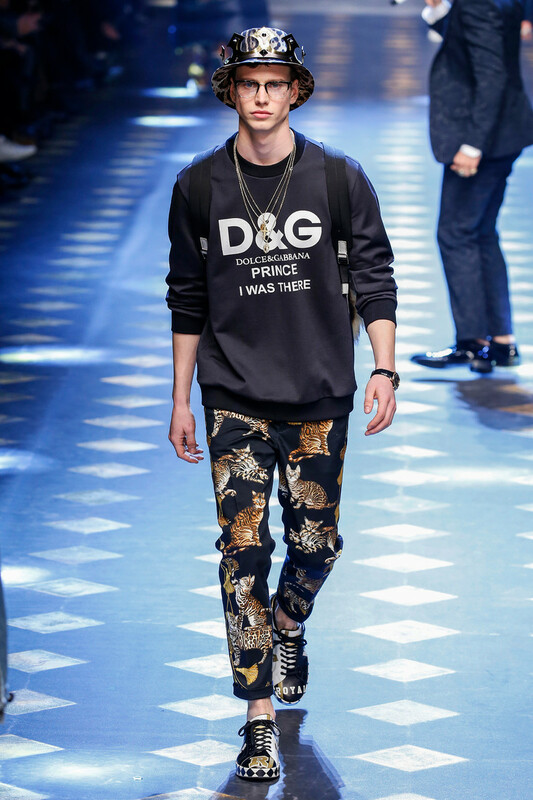 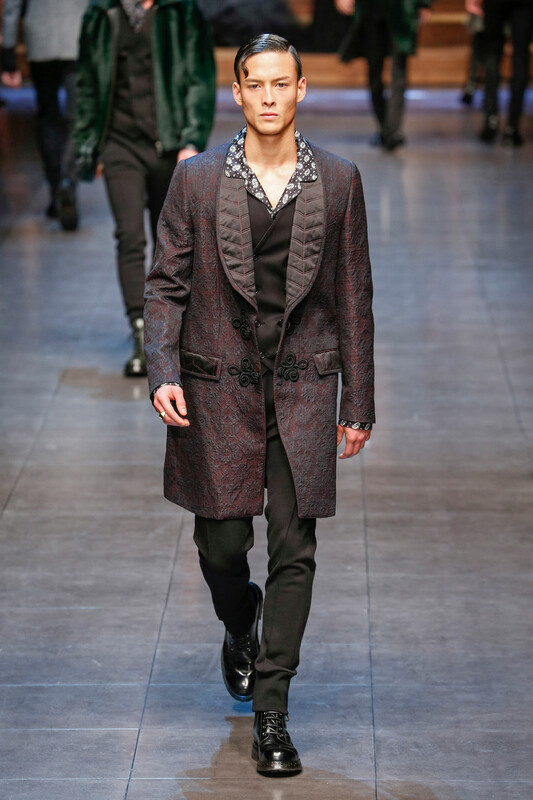 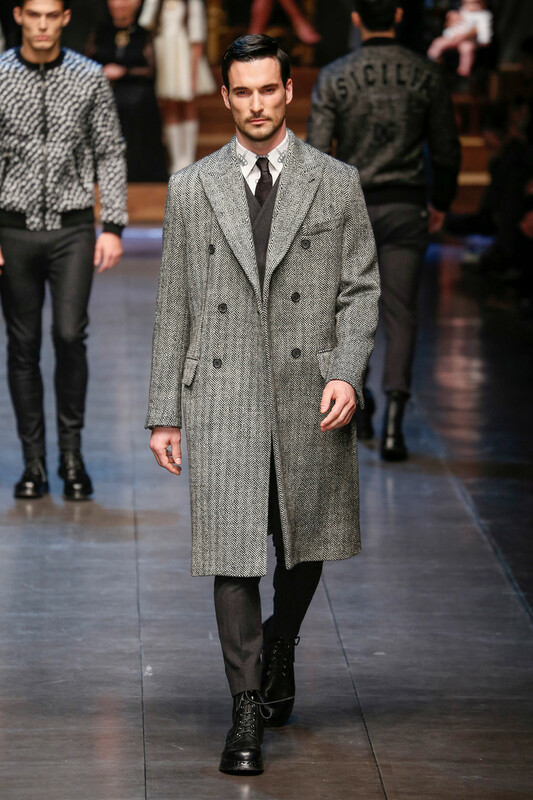 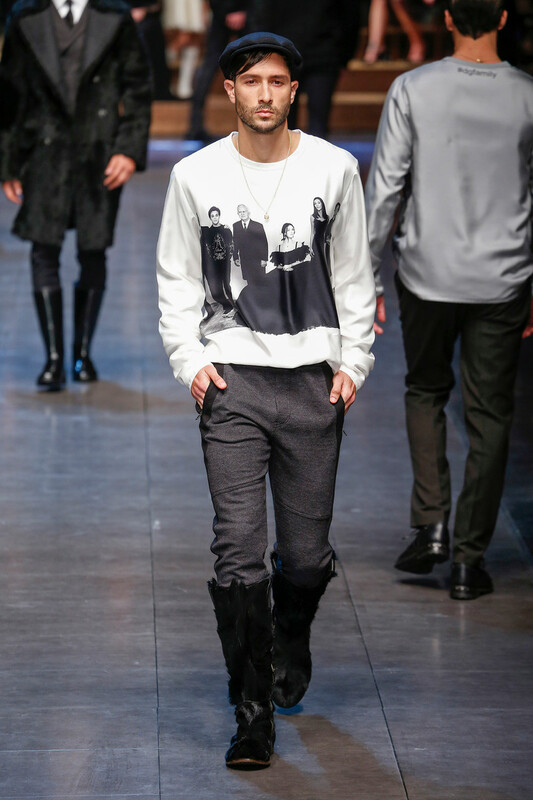 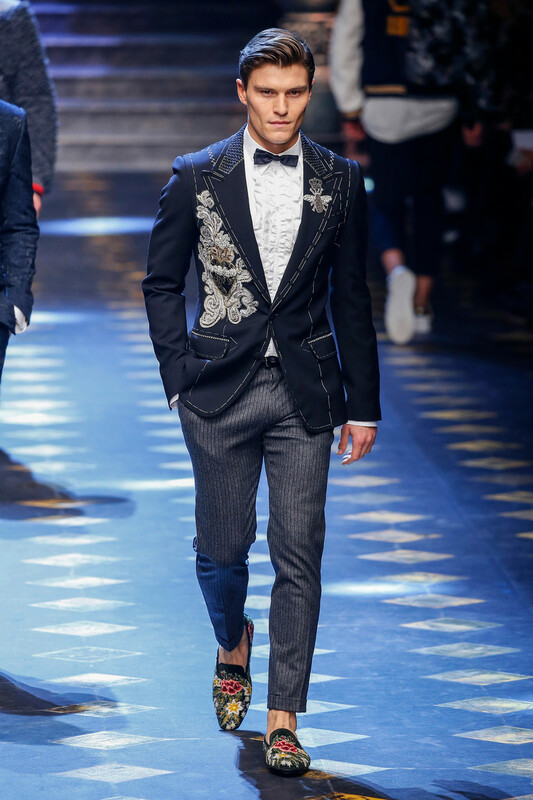 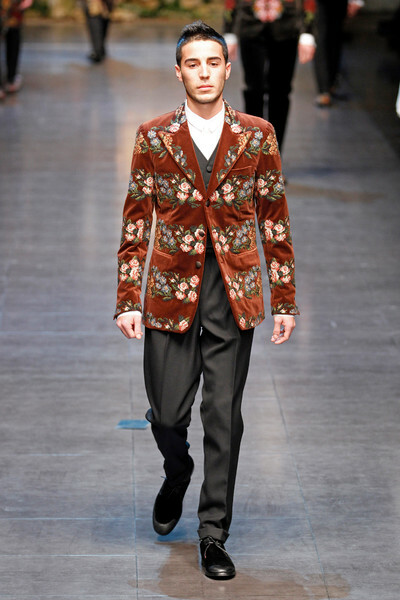 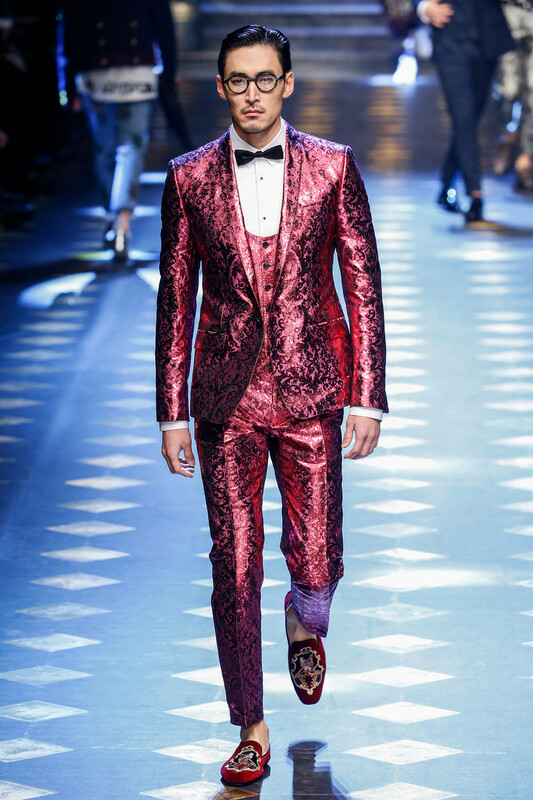 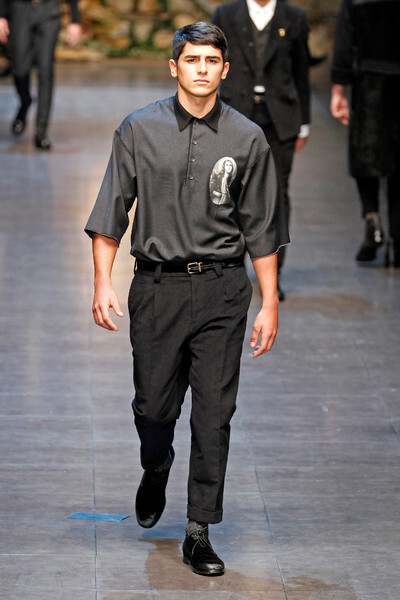 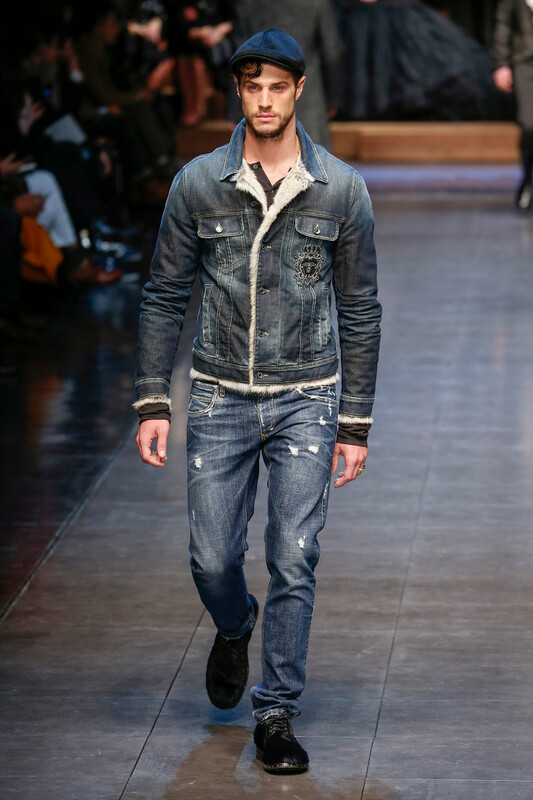 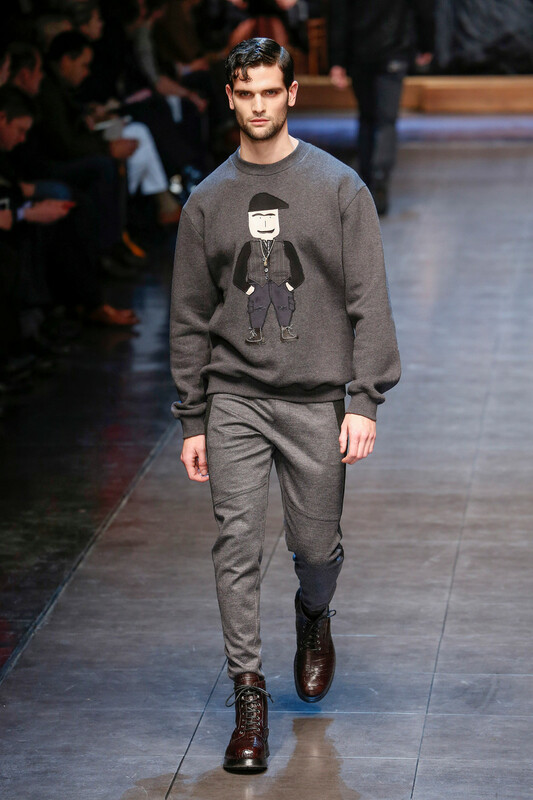 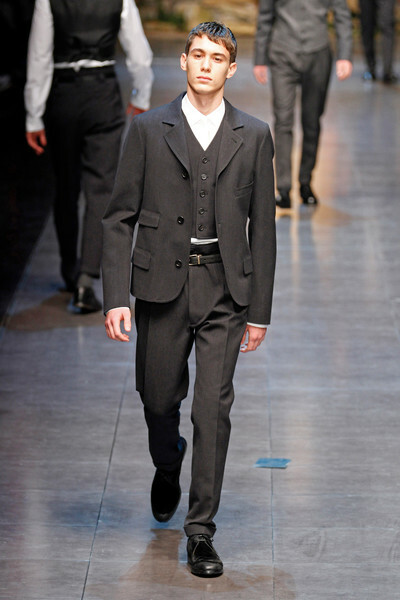 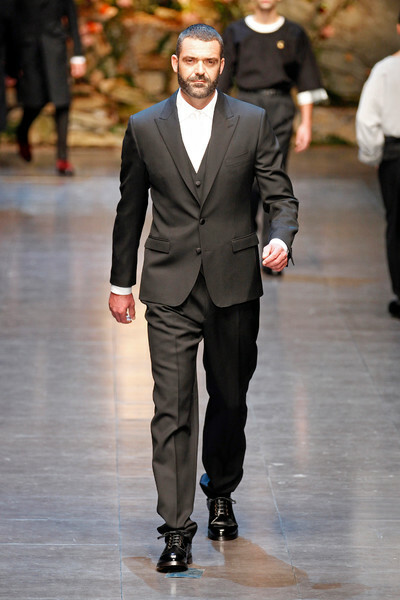 After a few strong menswear-seasons with the focus at Italian sartorial craftmanschip, Dolce & Gabbana moved on. 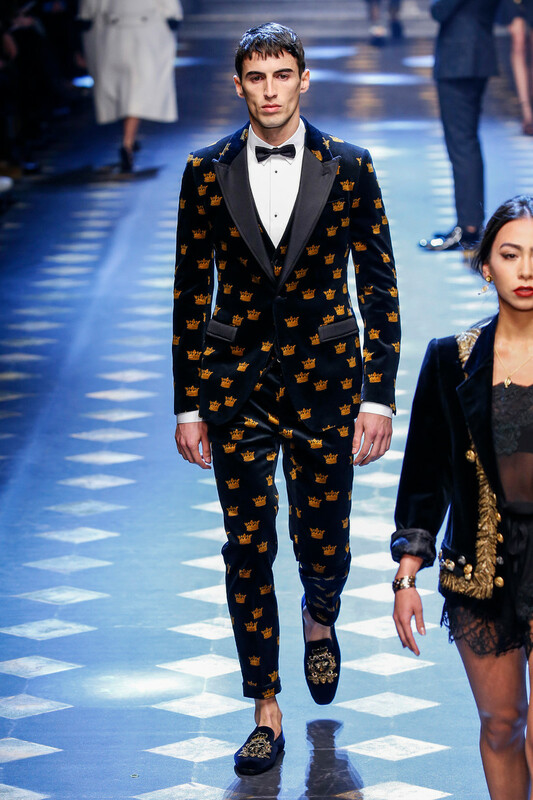 They looked at Britain and 80’s style-icon Bryan Ferry, who’s slick style of shiny suits inspired a whole generation of young men back then. 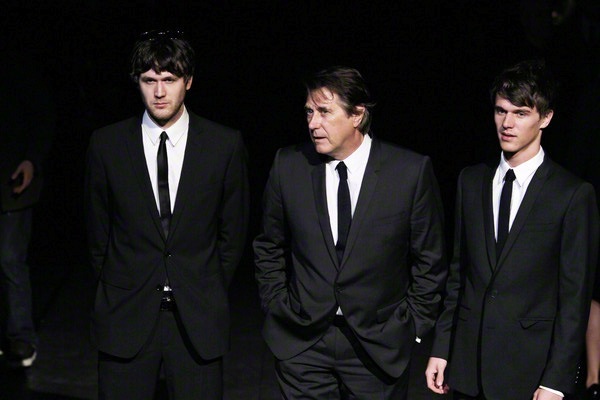 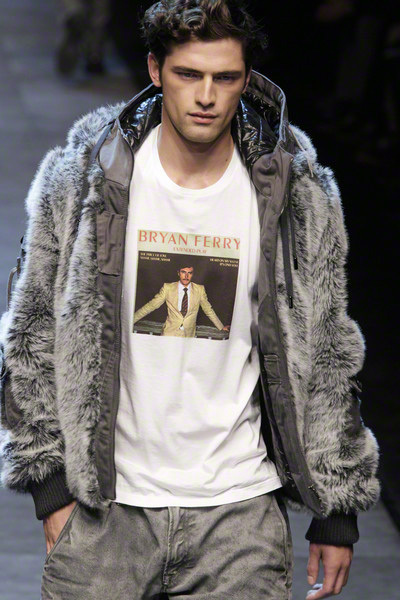 I guess Bryan Ferry was happy he grew out of that 80’s style of short, slightly squared jackets, wide lapels and tapered pants while watching the show in a slim suit and accompanied by two of his sons (who looked very smart too). 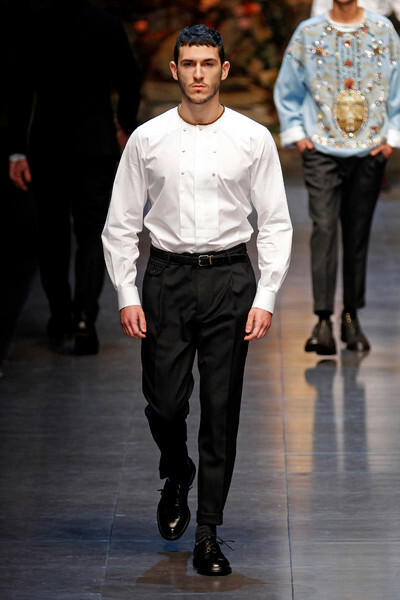 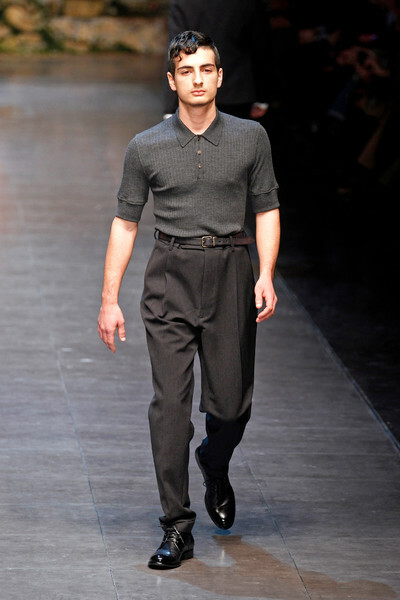 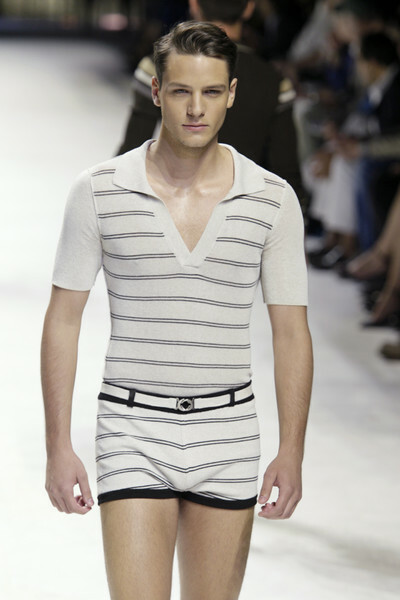 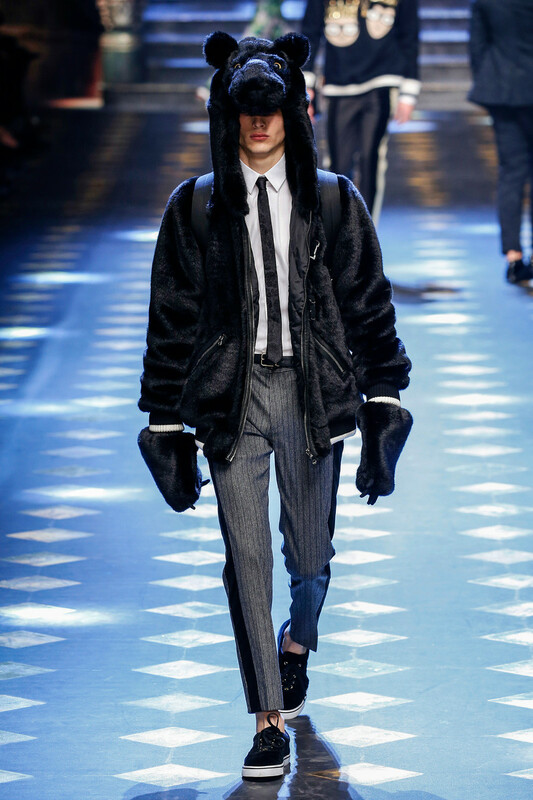 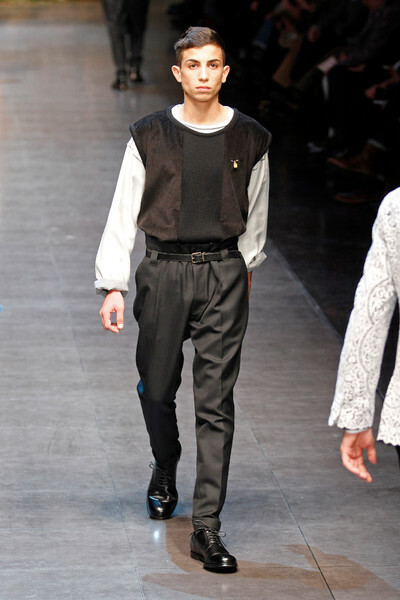 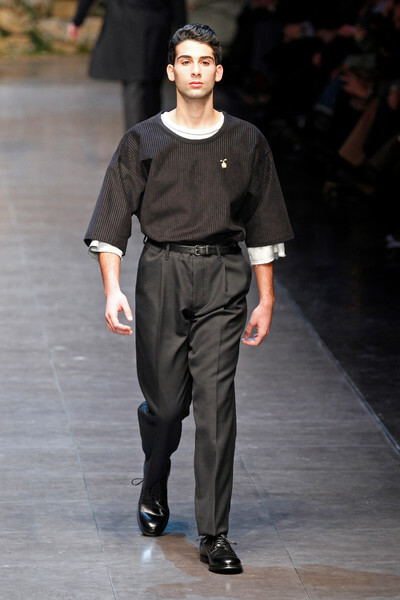 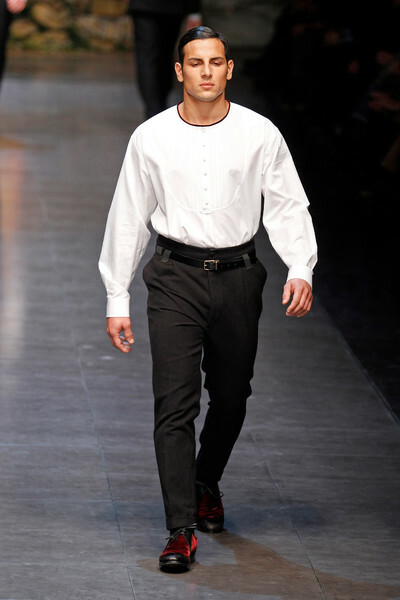 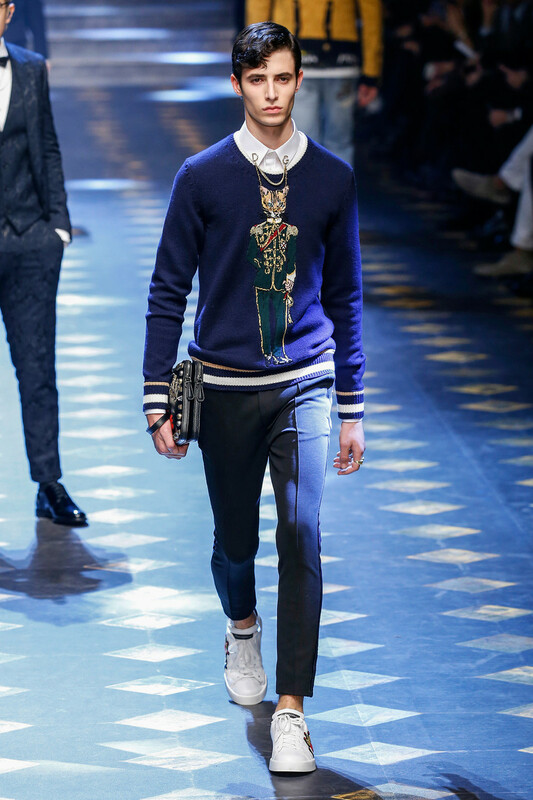 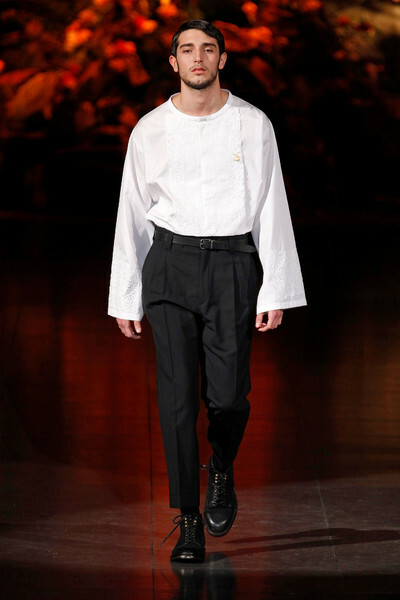 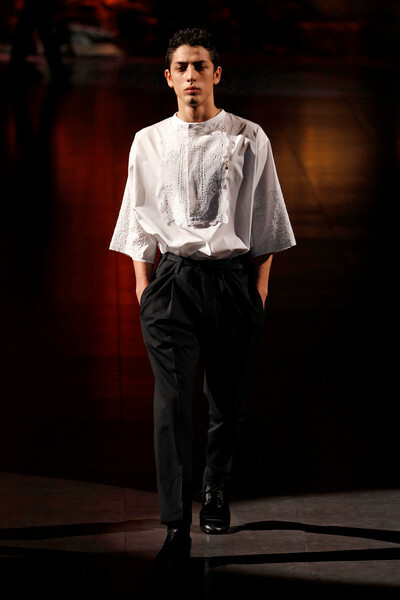 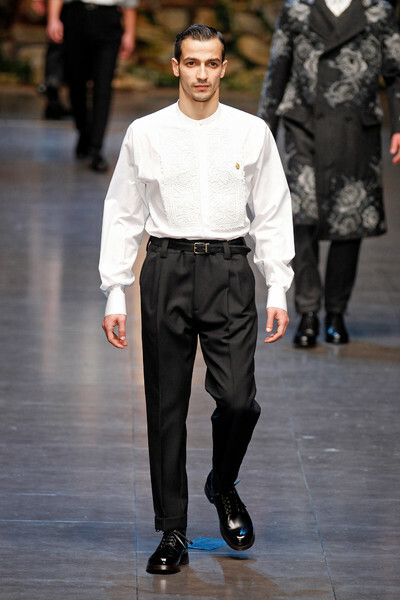 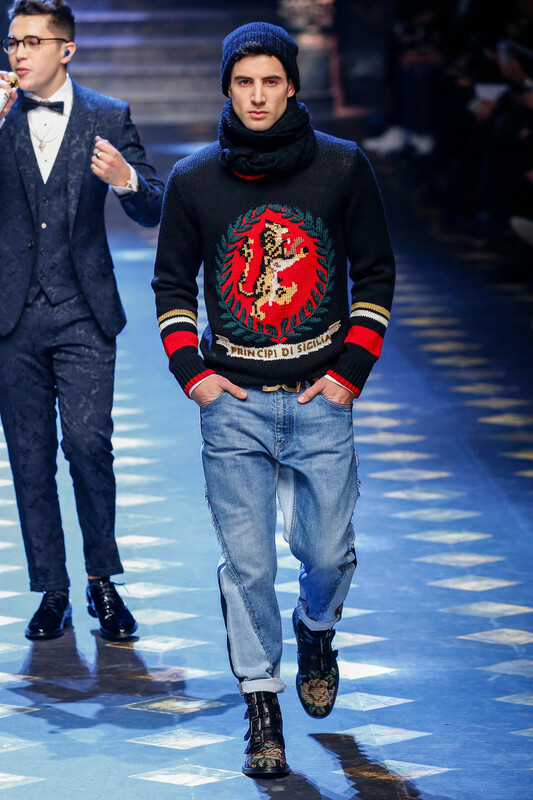 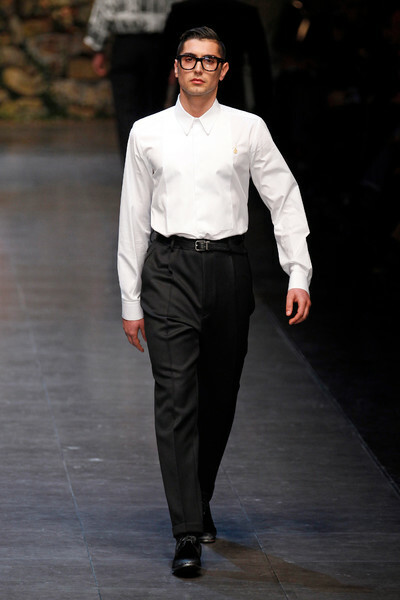 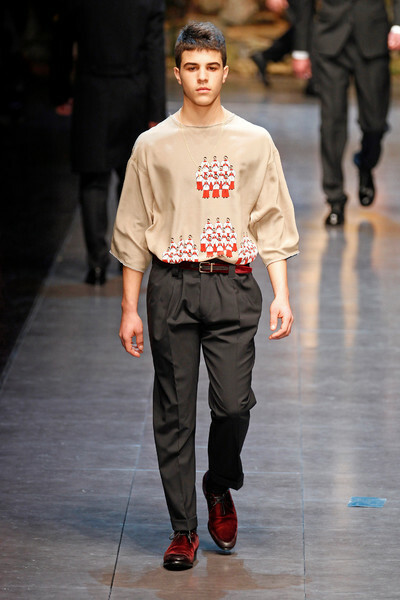 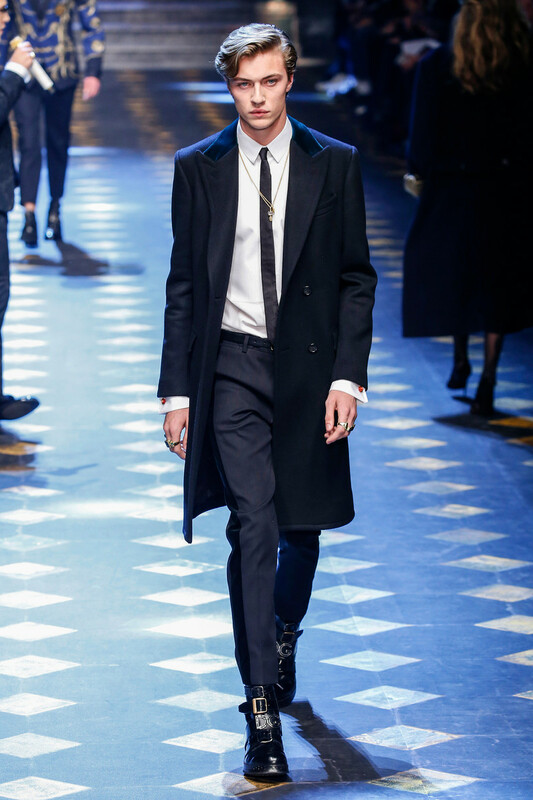 It’s a big step from the handsome and streamlined Italian style we’re used to see at Dolce & Gabbana. 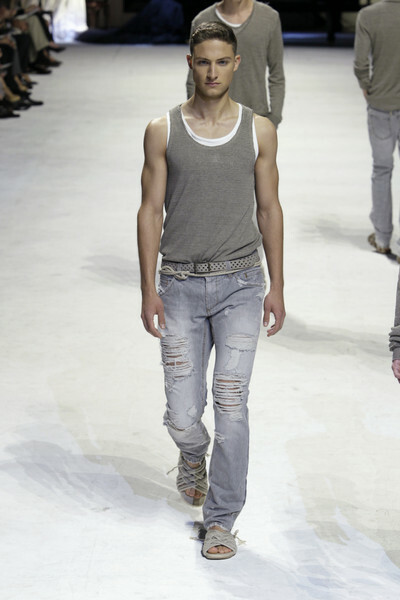 But maybe it’s just a matter of time. 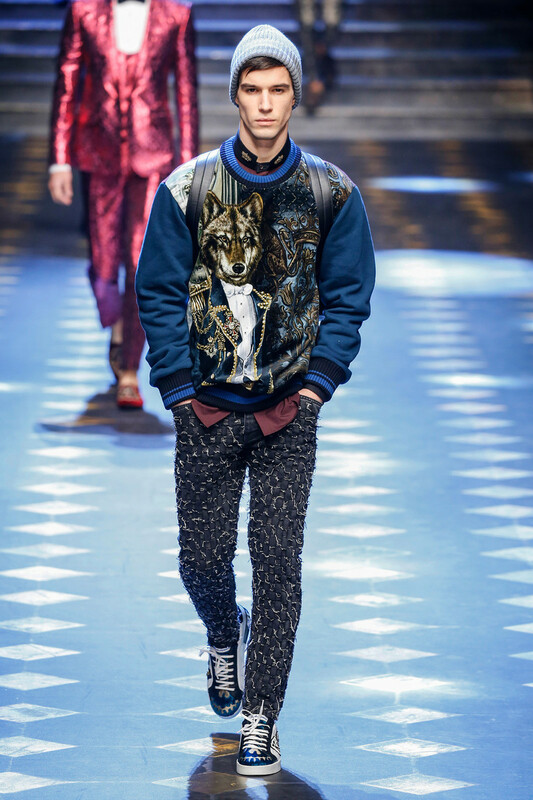 The look must seem bright new to a younger generation fed up with skinny pants and jackets. 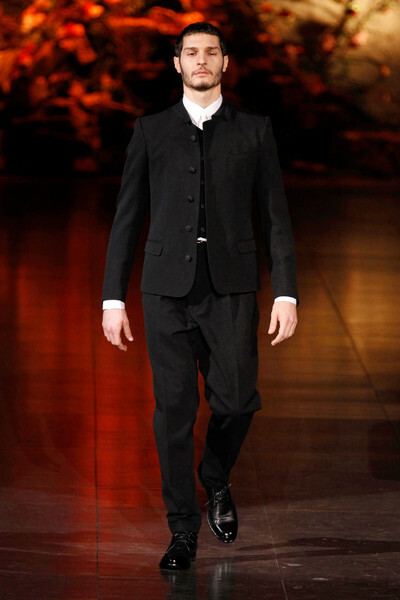 The new silhouette is more square and non fitted, jackets are much shorter and pants got low crotches. 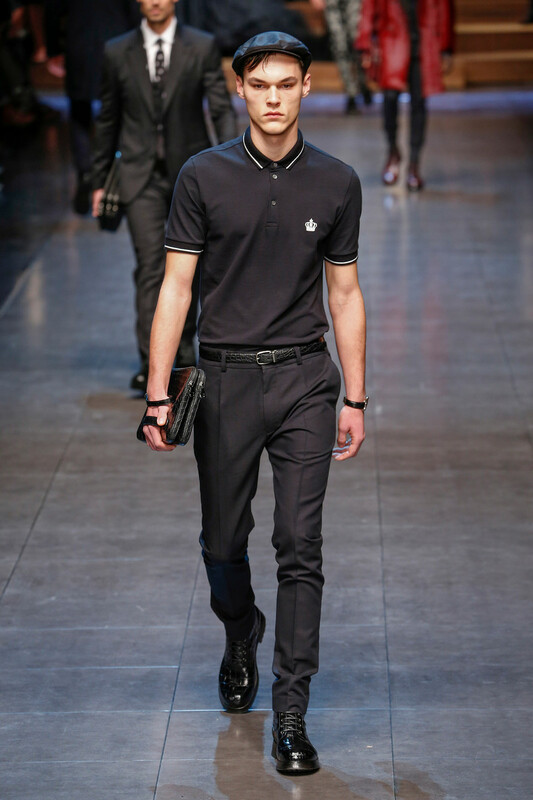 For the streetwise styling the designduo looked at British ska’s, with their hats, black and white, suspenders, short pants and shoes. 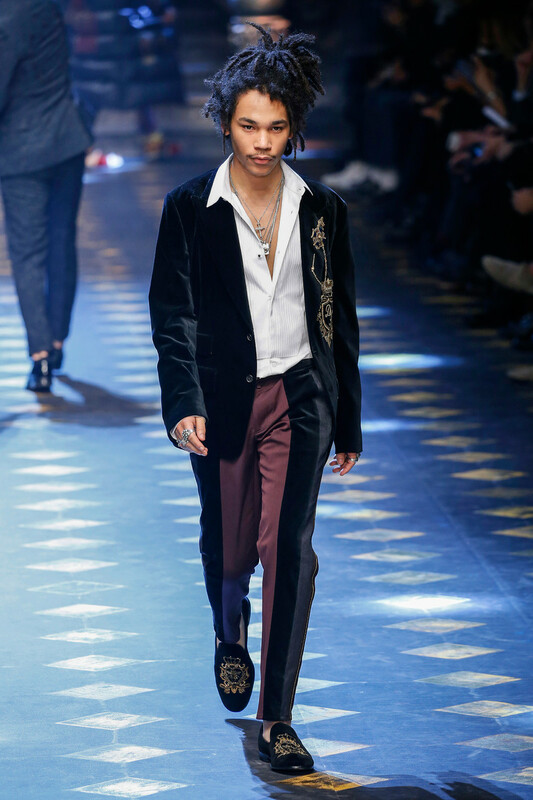 The formal suit was mixed, a jacket with jeans, the pants with striped sweater, velvet with denim, faux fur with wool, pinstripes with pied de poule. 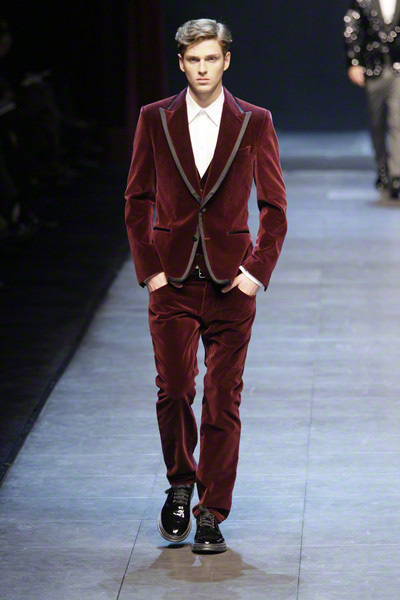 There was even a hint of color next to the black and grey, red and bordeaux played a major role. 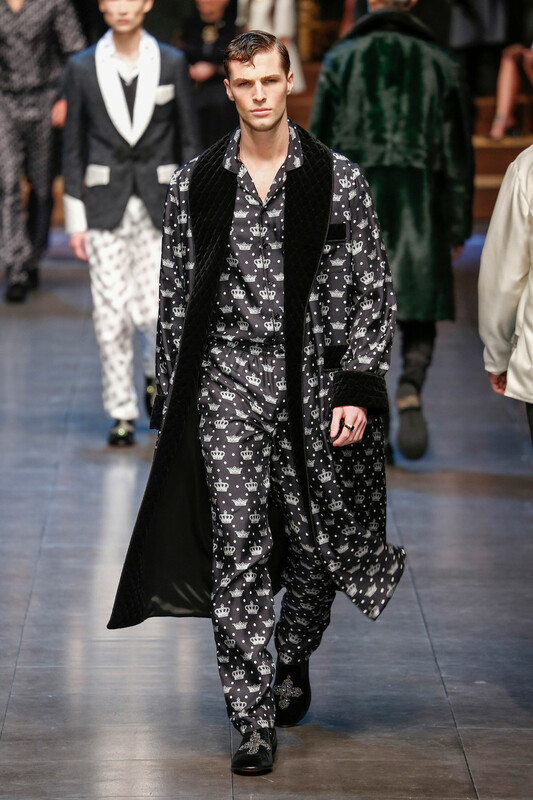 The collection deserved the name Eccentric Tailoring – only for those who dare. 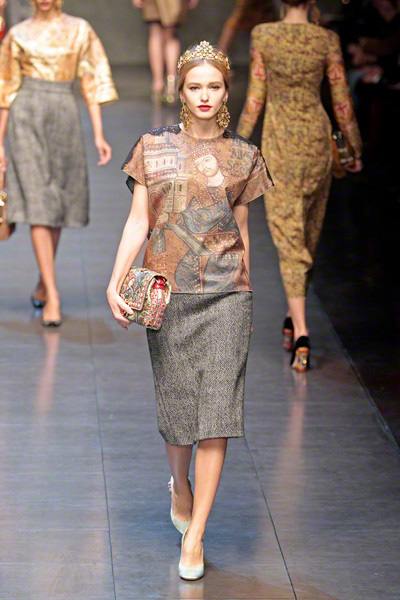 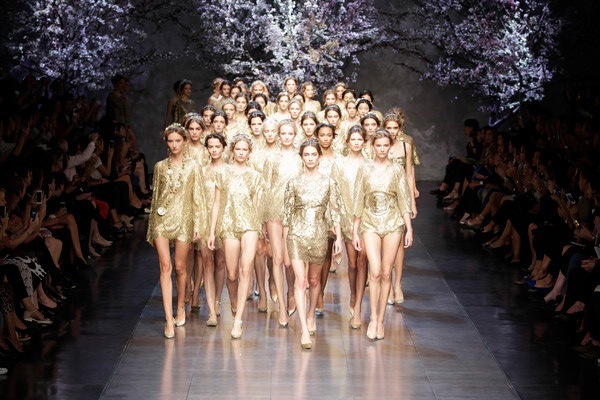 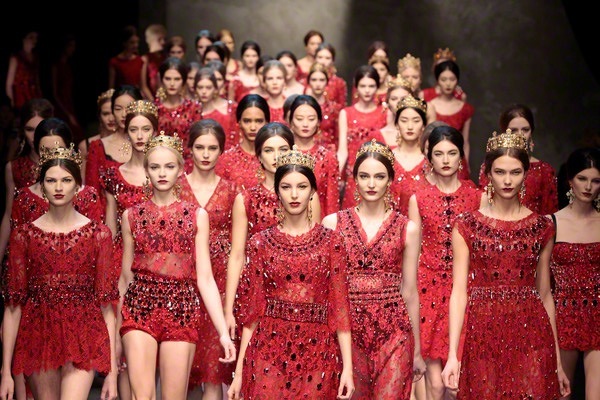 Dolce & Gabbana keep on celebrating their 20th anniversary with memorable events. 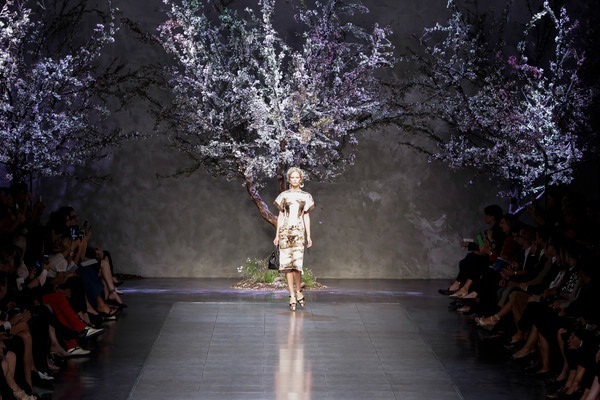 Not only a cocktail and exhibition in the Palazzo Marino (City Hall) in the centre of Milan, but also with great theatrical fashionshows. 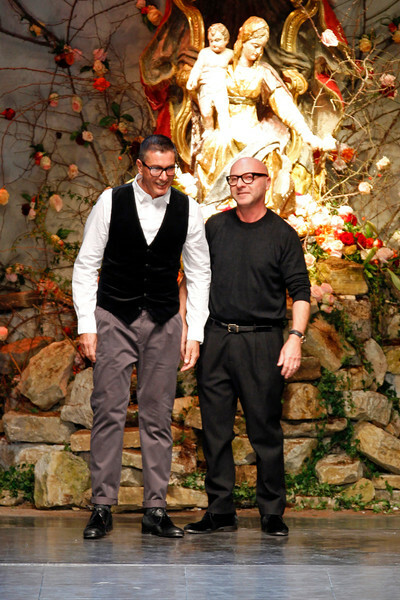 The shows not only tell the story of their roots, but also of their creativity and passion. 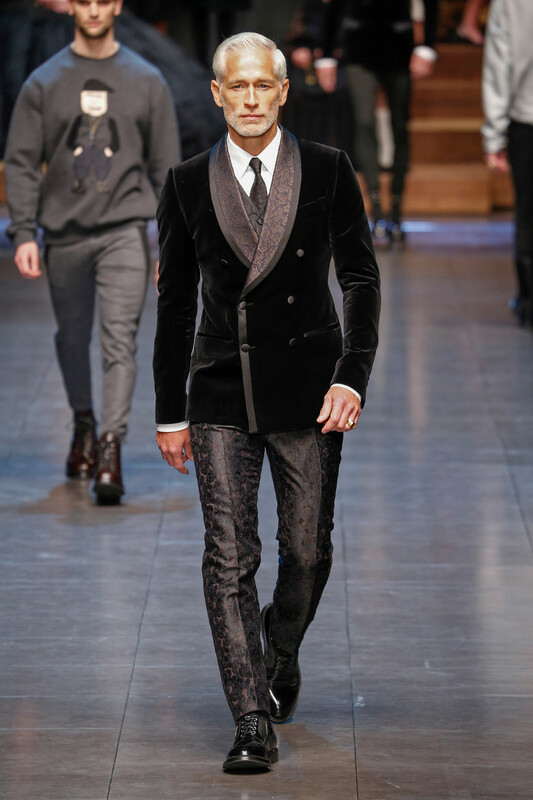 Today’s menswearshow was all about passion and drama. 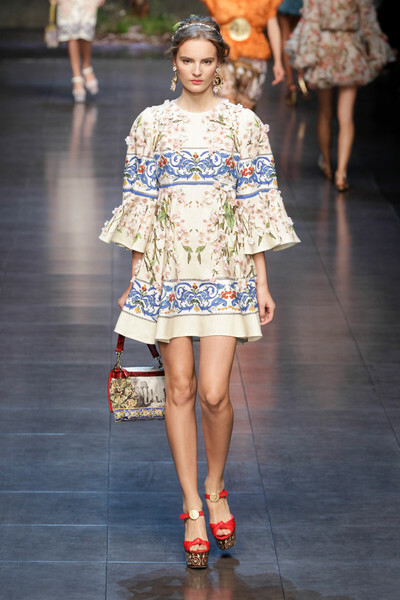 The duo took inspiration from their beloved Sicily, especially from the fishermen. 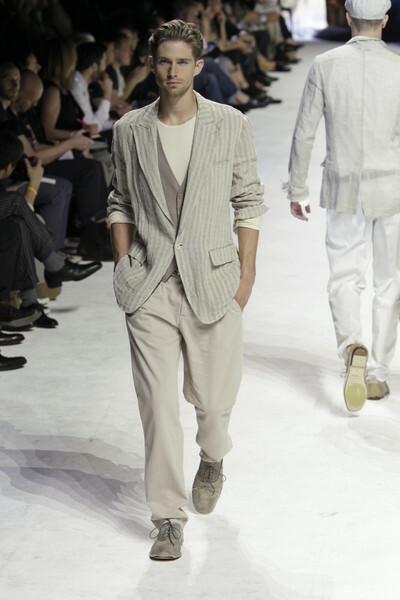 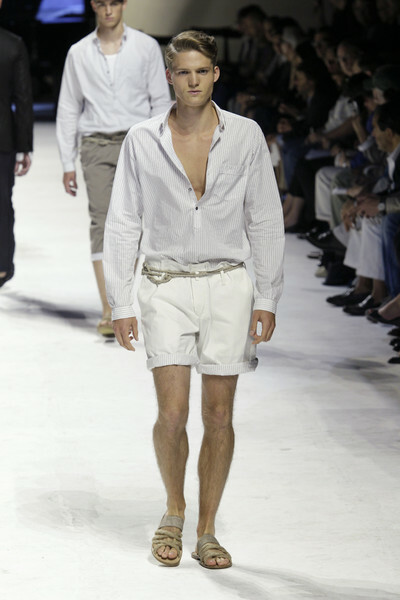 They took their simple, but inventive way of clothing – pants held together by a rope, fishnet-shirts, simple linen suits, sandals and shorts – and translated that in a casual, relaxed collection with white, black and sand as their main colors. 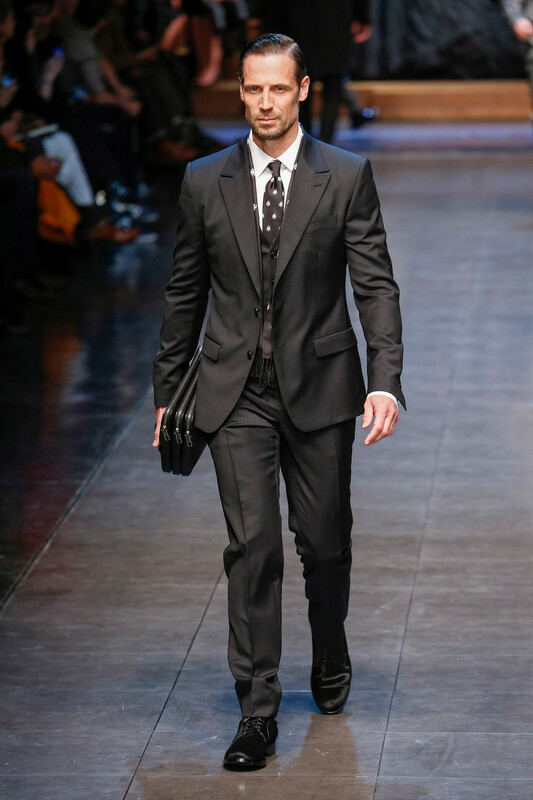 I’m sure there was something for actor Morgan Freeman or Matthew McConnaughey who were attending the show. 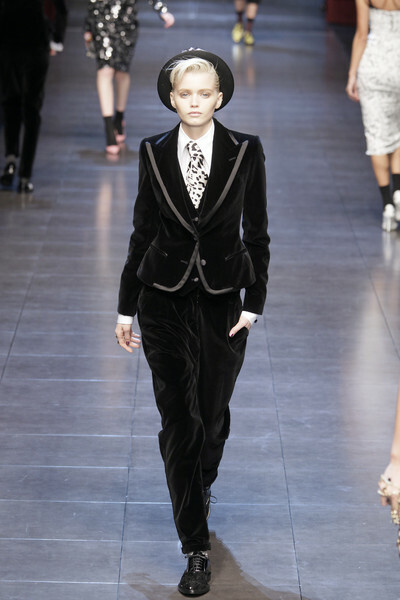 But the most dramatic part was the performance of singer Annie Lennox. 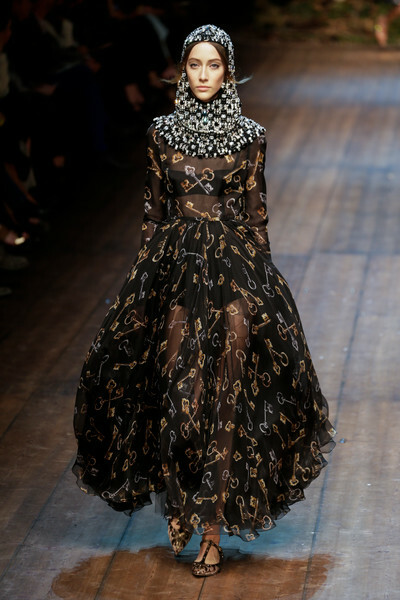 Dressed in a huge ballgown she played the piano and acted like a real diva. 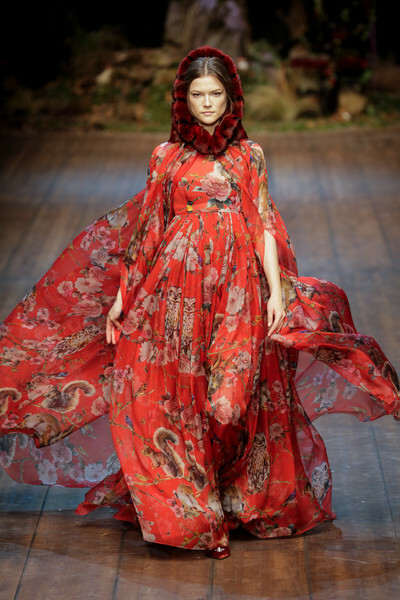 Her voice sounded better than ever and she sang her evergreens passionately.